The next 2 days of the trip were the days Steve & I were looking forward to the most. 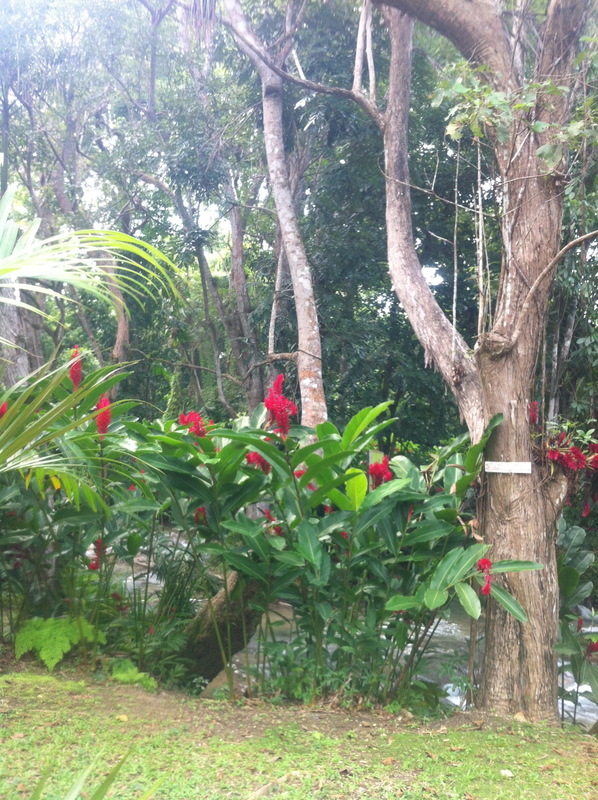 We were finally leaving the resort to see something of the “Real Jamaica”. Steve & I started off the day quite excited of what we were about to experience. But first, a small breakfast. 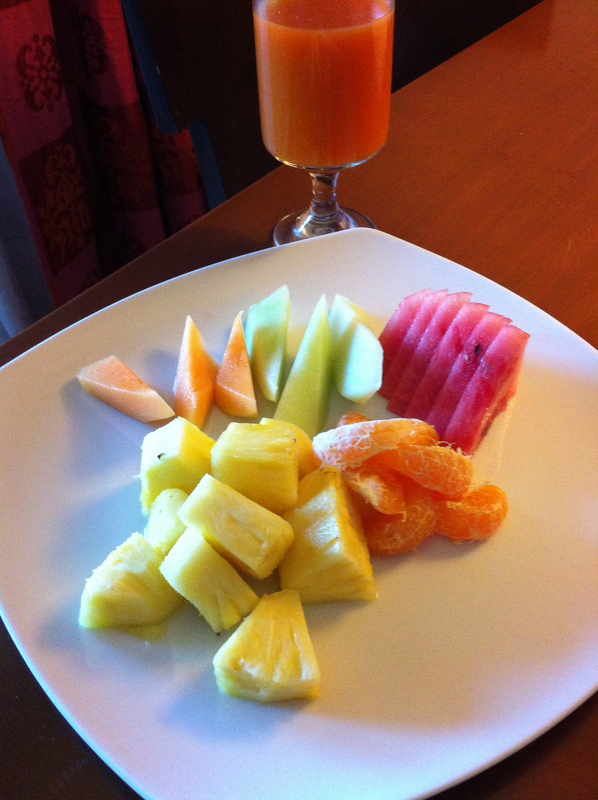 We decided to go with room service one last time and just get a fruit plate and juice. Day 3 breakfast. 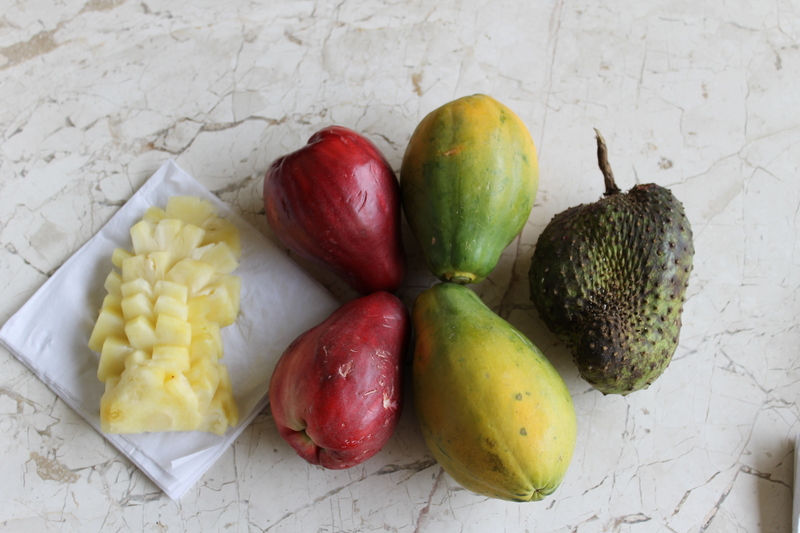 How fruit can be so mediocre on an island filled with amazing indigenous produce is unfathomable to me. Sigh… At least the pineapple was edible. After this disappointment, we headed downstairs to wait for our guide. We didn’t have to wait long. 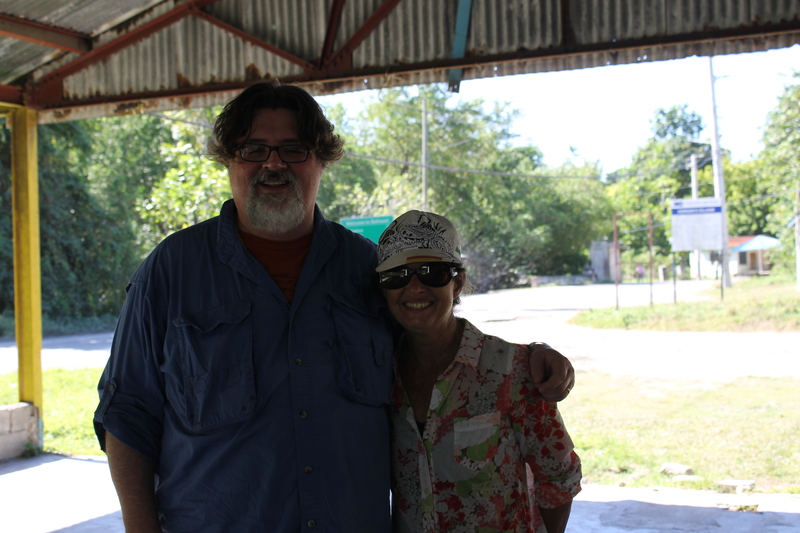 I will say that Steve hit the jackpot in our tour guide, the wonderful Lynda Lee Burks. 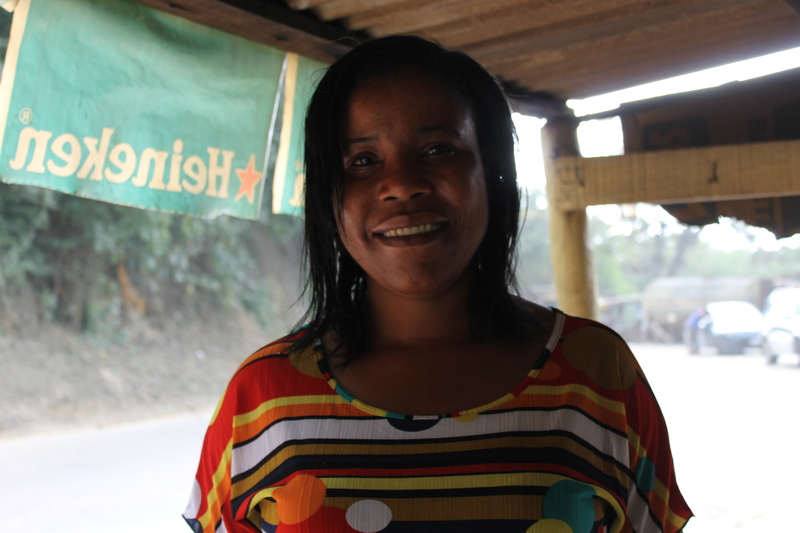 She is an American ex-pat who has lived in Jamaica full time for most of the last 20 years. 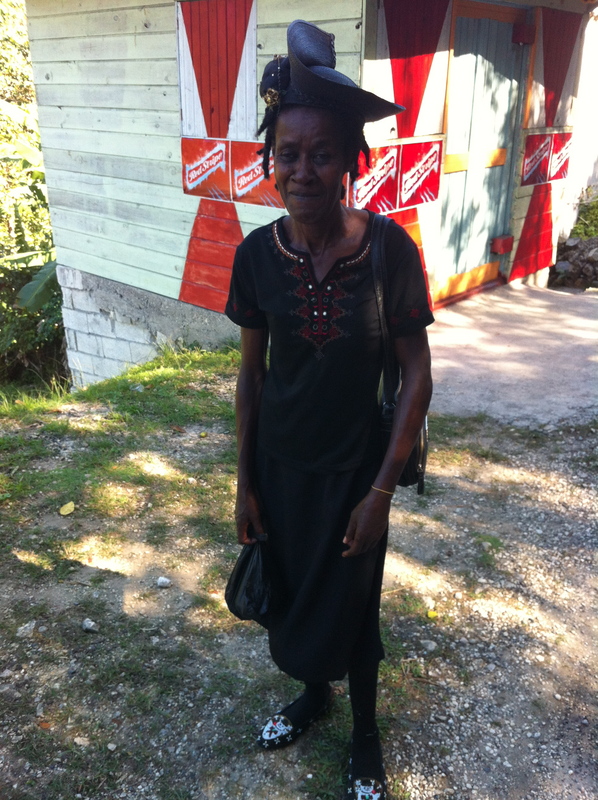 She has her own tour company that focuses on specialized tours, Jamaica Tour Society (http://www.jamaicatoursociety.com). She was a wonderful guide and companion for the next two days. I love her. 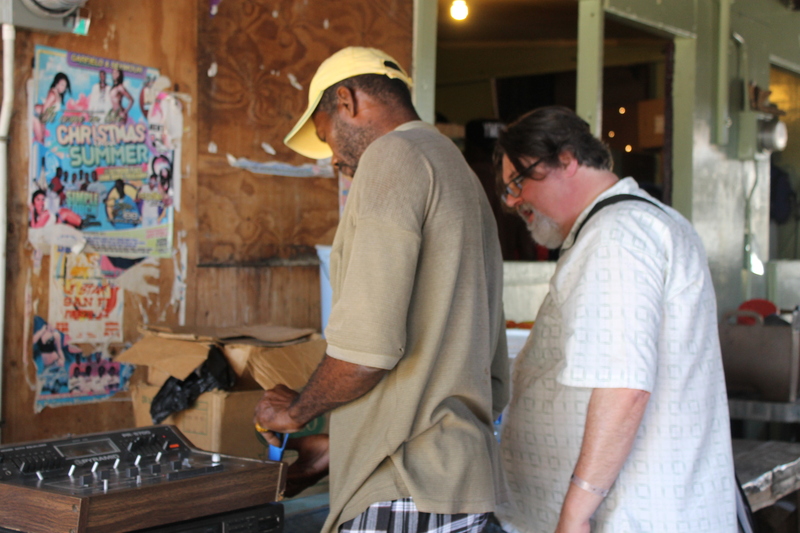 Steve & I wanted to go into Montego Bay to visit the produce market and look for some music. 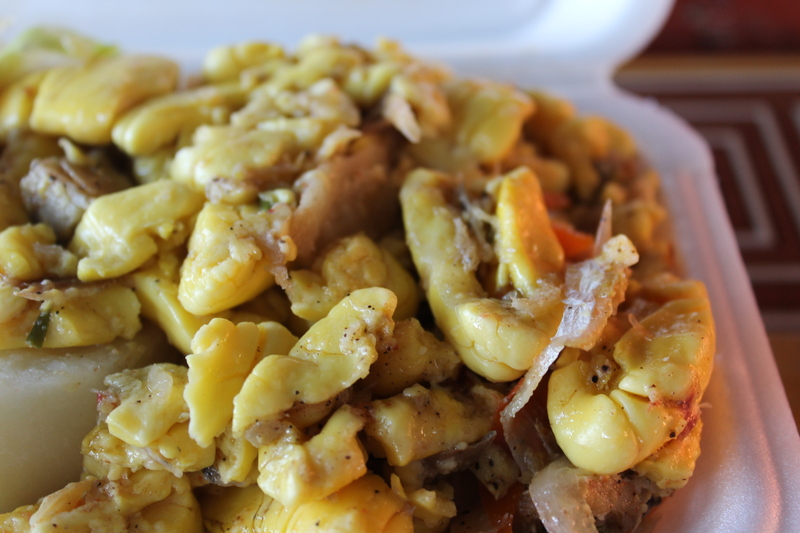 We also wanted to try the national dish of Jamaica, Ackee and Saltfish. Lynda Lee said she rarely gets requests to go into the city, so she was happy to take us. The market was a maze of sensory experiences. 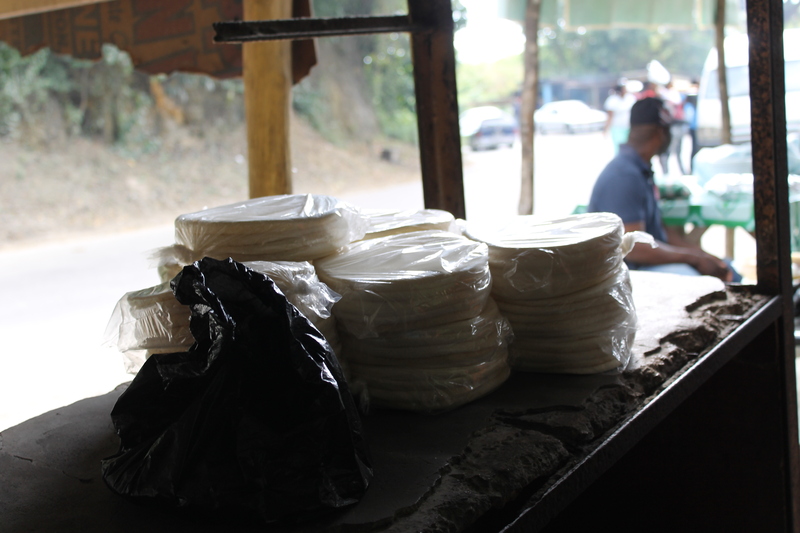 They sell everything there from tobacco to clothes to kitchenware to produce. I’m not sure of the age of the market, but considering the importance of the city as a port, the market has likely survived in one form or another for at least 350 years. However, the building we saw along with the current fixtures was probably built in the early- to mid-twentieth century. 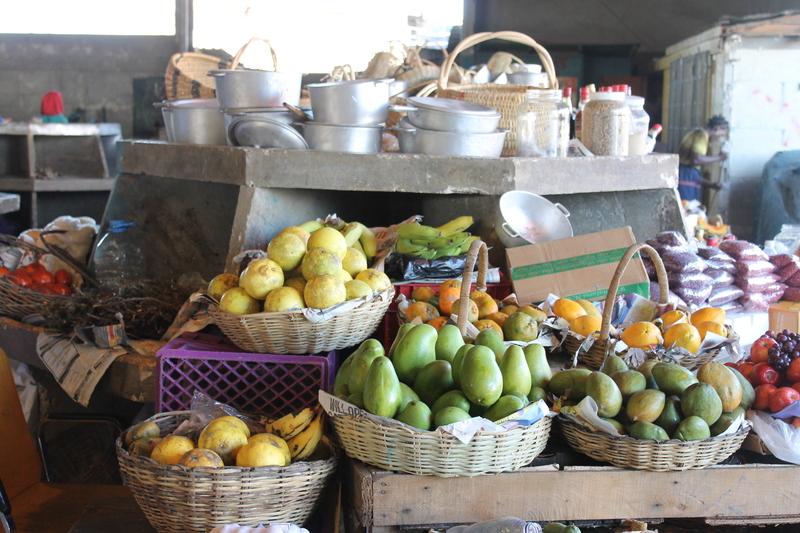 Some of the bounty at the Montego Bay Market. As we began walking around the market, it was clear to me that this is a country that takes a lot of pride in its food. While some of the produce was imported (we saw huge bags of onions, carrots, and potatoes), most of it was native grown. Lynda Lee also gave me some advice as we began walking around: Always ask to take someone’s photo. If you don’t, if seen as an invasion of privacy and/or they think you’re a journalist looking to make money off of them. Since I’m not one who would naturally walk up to random strangers and ask to take their photos, I found the easiest way to approach this is to buy something from the stand. I figured the vendors would be much more receptive. Luckily, they were. Pumpkin and Soursop. 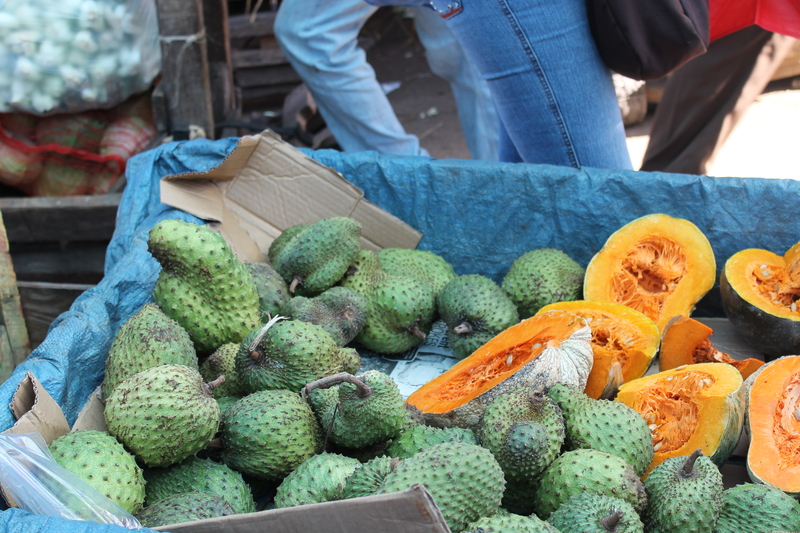 I’d never heard of soursop before this. It was quite the revelation. 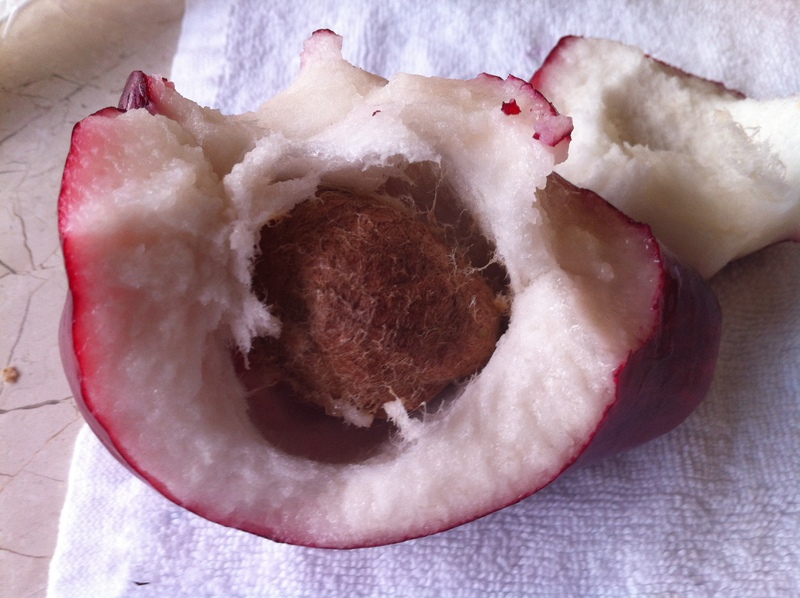 It is sour in its underripe state and gets sweeter as it ripens. Otaheiti Apples. These are actually indigenous to the Pacific Islands. 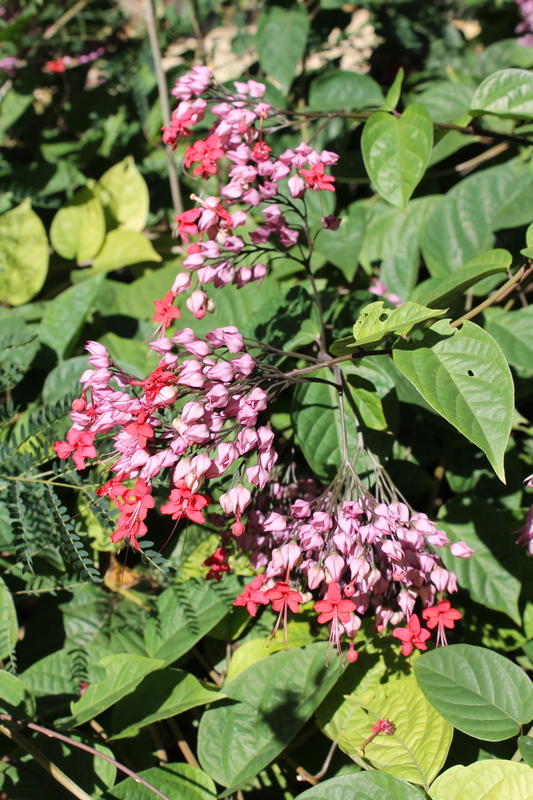 They grow well in tropical climates, and are grown and extremely popular in Jamaica. 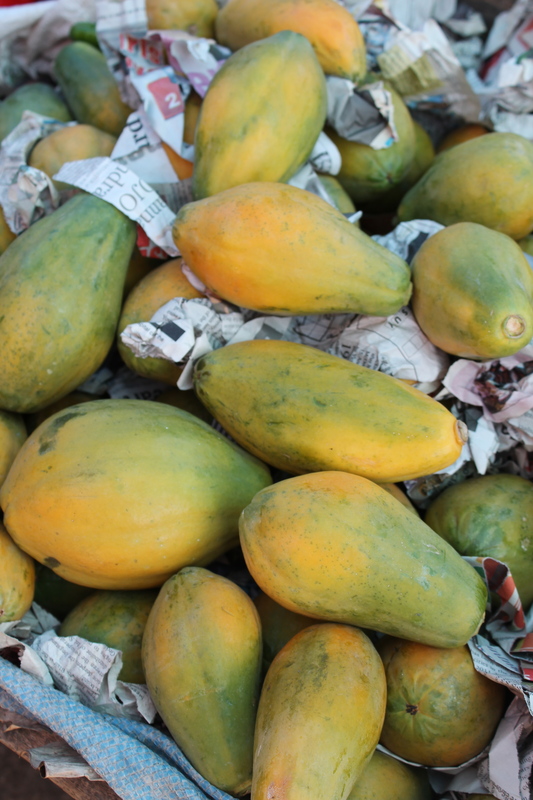 Papayas, known as Pawpaw in Jamaica. As we moved through the market, we did run across a stand that had the components of one of the national dish of Jamaica: Ackee. It has a mild, creamy flavor and texture that works well with the very salty fish in the dish. 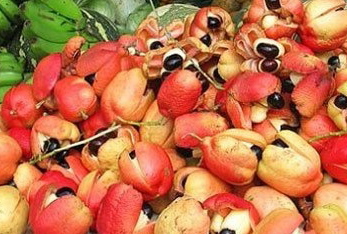 Ackee. These are indigenous to west Africa and were probably brought to Jamaica aboard slave ships. 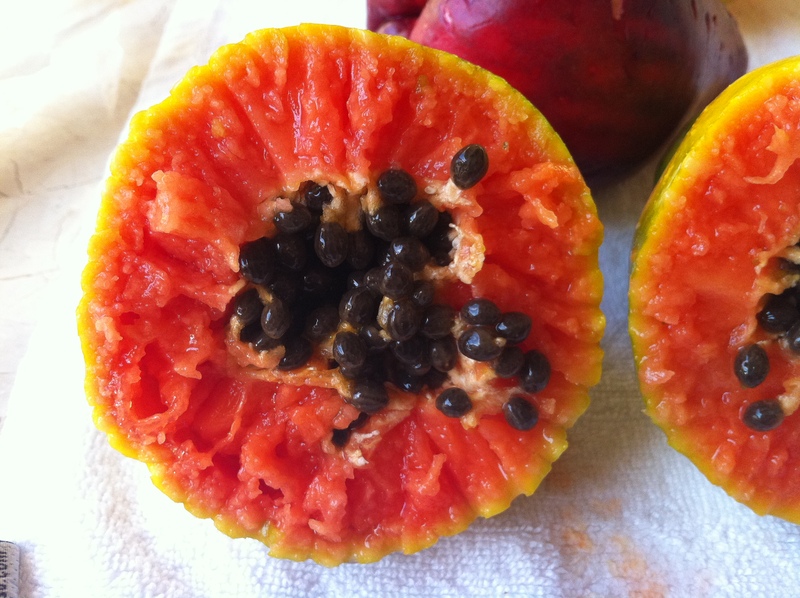 Parts of the fruit are toxic: so, if prepared improperly or eaten underripe, it can lead to severe hypoglycemia. 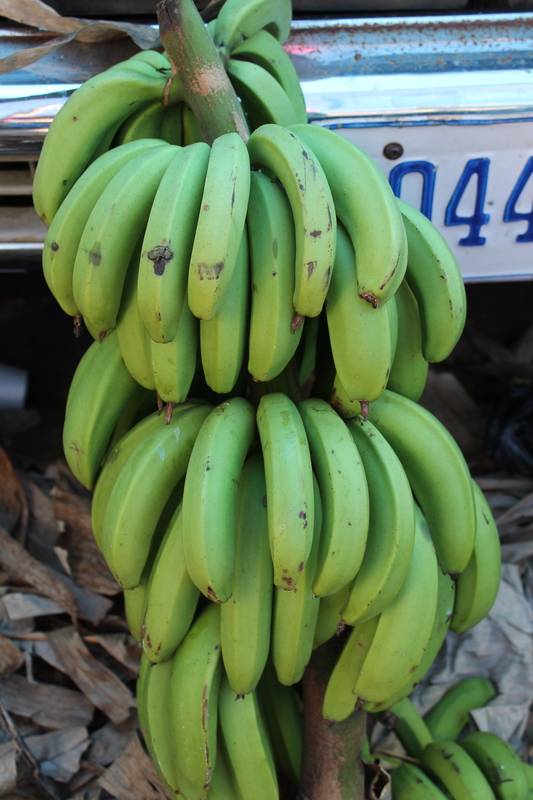 Bananas still on the stalk. After walking around a bit more, we all decided we were hungry enough to stop by one of Lynda Lee’s favorite cook shops in the market and finally get our Ackee & Saltfish. And, here are the ladies who made us this culinary delight. Esther and Janet. Esther and Janet. They introduced Steve & me to Ackee & Saltfish. They were absolutely sweet and lovely. Their tiny cook shop in the market seems to be quite popular. It was actually one of the first places we stopped when we got into the market. After Lynda Lee chatted with them for a few minutes (she knows them well; they usually have roasted breadfruit, one of Lynda Lee’s favorites, in season), Janet agreed to set aside some of the Ackee & Saltfish for us when we came back by. They apparently sell out quickly. To prepare the recipe, salt cod is soaked and boiled (although Janet used mackerel that morning), then sautéed with the cleaned ackee, onions, habanero (Scotch Bonnet) peppers, tomatoes, and black pepper and allspice (pimento). 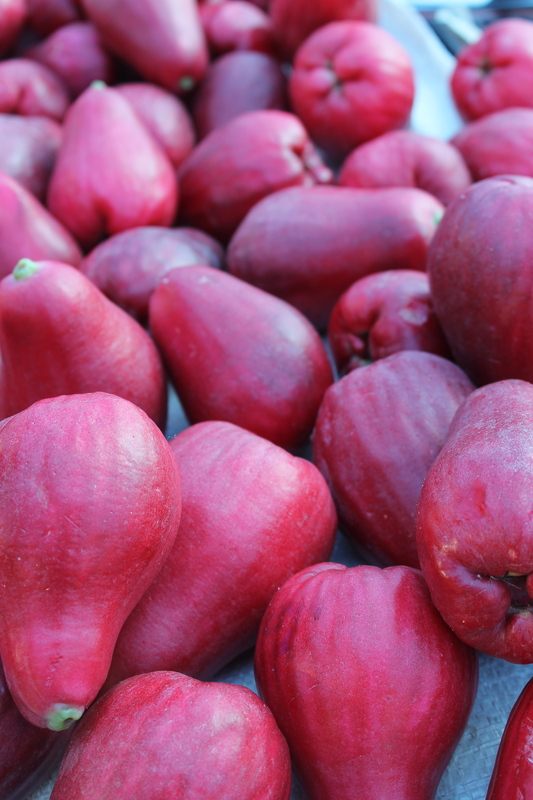 It is usually served as breakfast with breadfruit (when it’s in season), tomatoes, fried or boiled dumplings, boiled yams, and fried plantain or boiled green bananas. Our real breakfast on Friday. 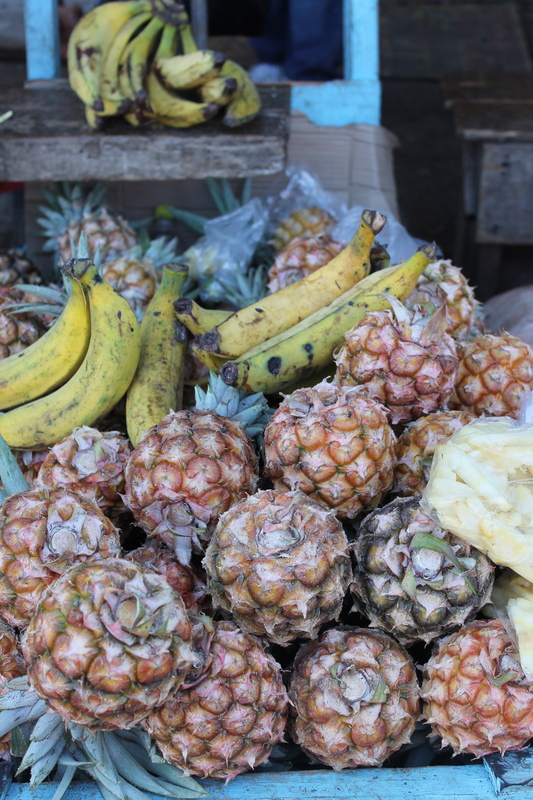 And, finally, a taste of the real Jamaica. Ackee & Saltfish. Absolutely delicious. Typically, it’s made with salt cod. That morning, Janet made it with mackerel. I’ve never had mackerel, so I had two new food experiences in one. 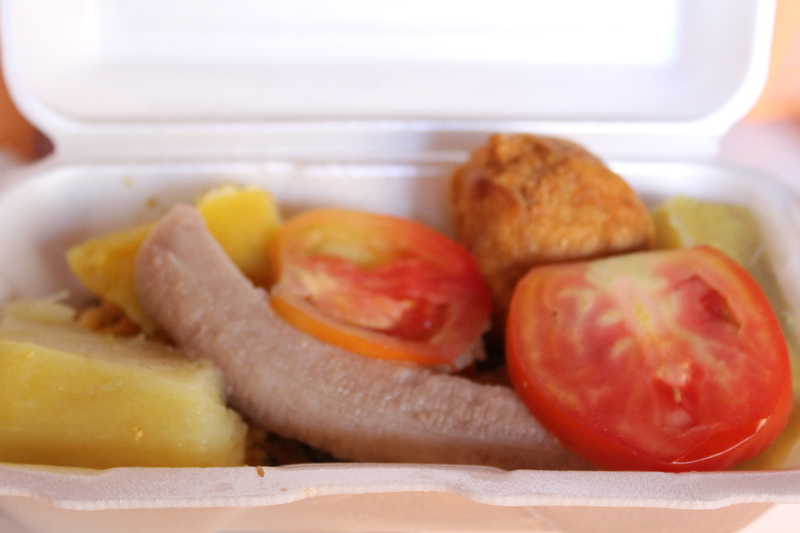 The full breakfast was Ackee & Saltfish, boiled yams, sweet potato, tomatoes, fried dumplings, and boiled bananas. 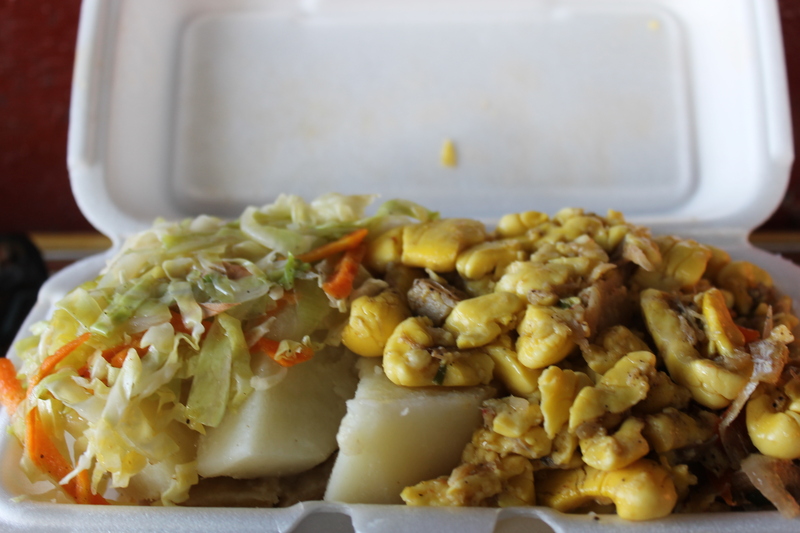 Like many cuisines in developing nations, starch figures pretty prominently in Jamaican cuisine. It’s a cheap, generally nutritious, and filling way to receive one’s sustenance. Not that I’m opposed to starch. 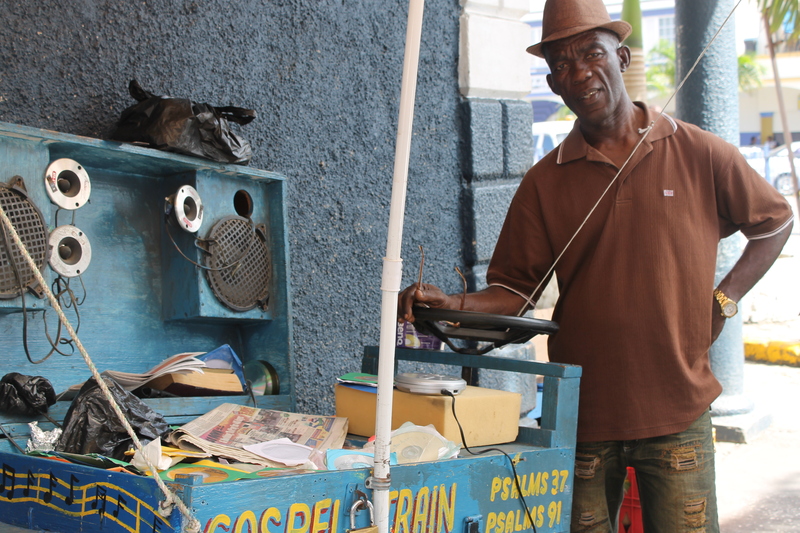 After we ate breakfast, we moved next door so Steve could speak with a gentleman named Bunny so he could buy some old-school Jamaican music. Bunny’s shop. Or, it may have just been a sign that Steve liked. Steve and Bunny listening to music. I think Steve bought 5 cd’s. While Lynda Lee and I were waiting for Steve to finish up with Bunny, we watch a gentleman dance to the old-school dub that was coming out of the speakers. But, I didn’t want to pay him for taking his photo (which can happen). So, I just have the memory. After Steve bought his cd’s, we wandered around a bit more as we worked our way out of the market. Pineapples. These were a smaller variety than we’re used to seeing here. 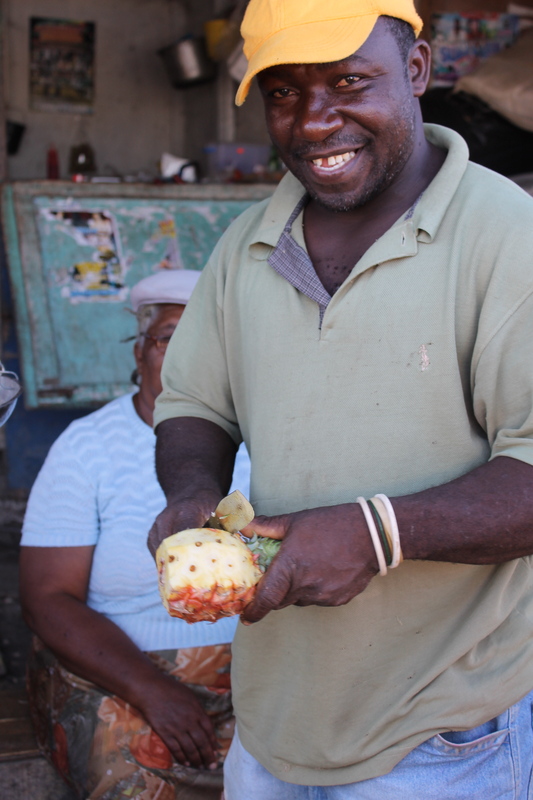 This gentleman was an artist in pineapple carving. I think he rather enjoyed having his picture taken. Yams. 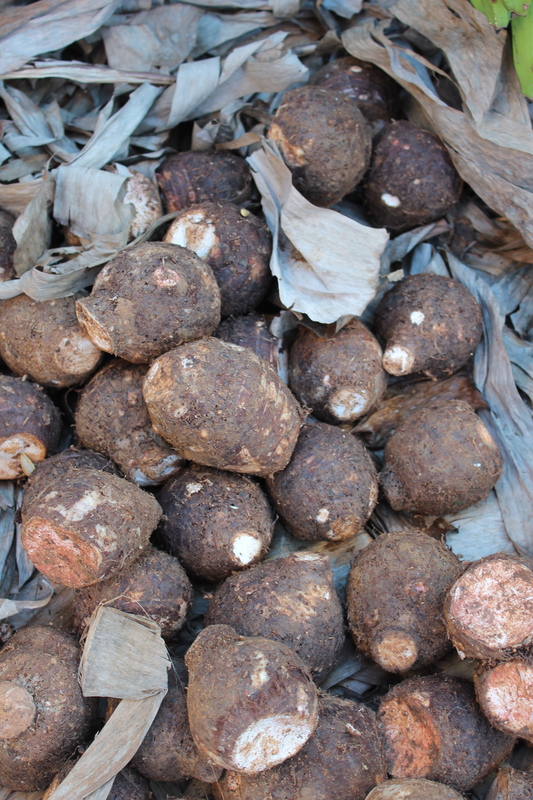 These and other starches like potatoes and cassava are quite prominent in Jamaican cuisine. Scotch Bonnet Peppers. Otherwise known here as Habaneros. 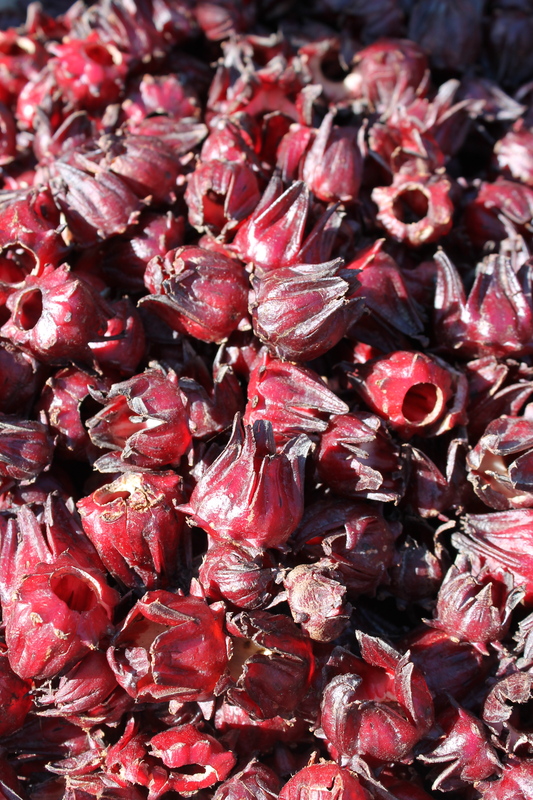 Sorrel flowers. They are generally used to make tea and are a traditional remedy to clear up respiratory inflammation. Nutmeg with the mace still on. The redder the mace, the fresher the nut. I bought some and never have to buy nutmeg or mace ever again. 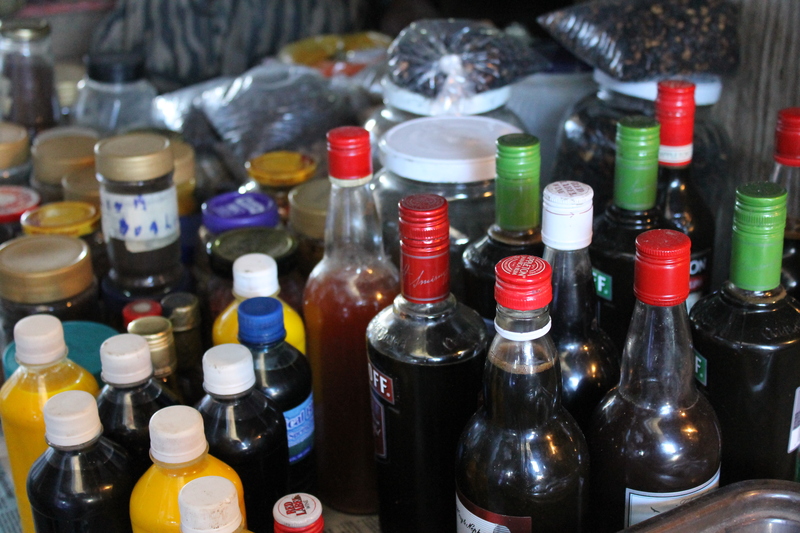 Various flavorings, traditional remedies, molasses, and chocolate. Another of the wonderful people in the market. One of the old-school vendor stands. You could conceivably have 6 vendors at one stand. As we left the market, I needed to change some money, so Lynda Lee took us over to Andy’s Market. It is directly across from the produce market and gets quite the trade in money exchange and simply making change. It looks like a dry goods store, but the money exchange takes place in a rather strange way (to us anyway). High above the floor is a room where someone will reach down while you reach up with your cash, they will take it, count it, and give you the exchange. It’s all very efficient. 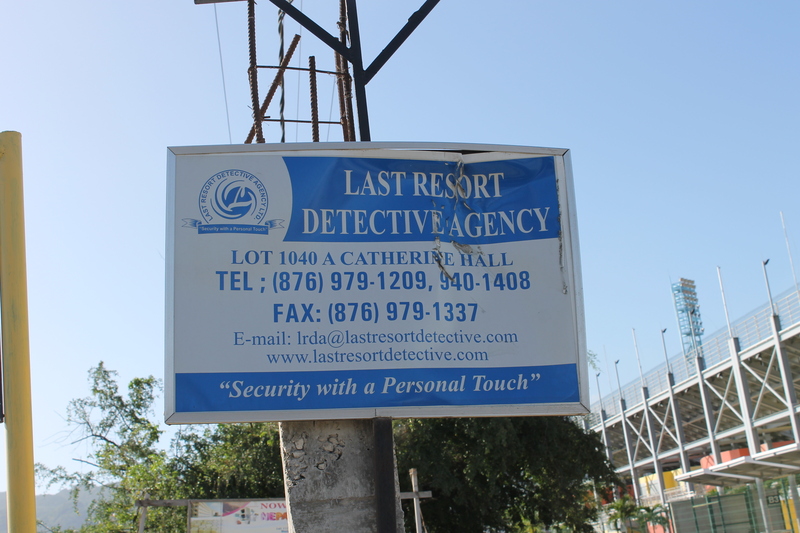 Given the crime rate in Jamaica, it makes sense to have the extra cash as difficult to get to as possible. 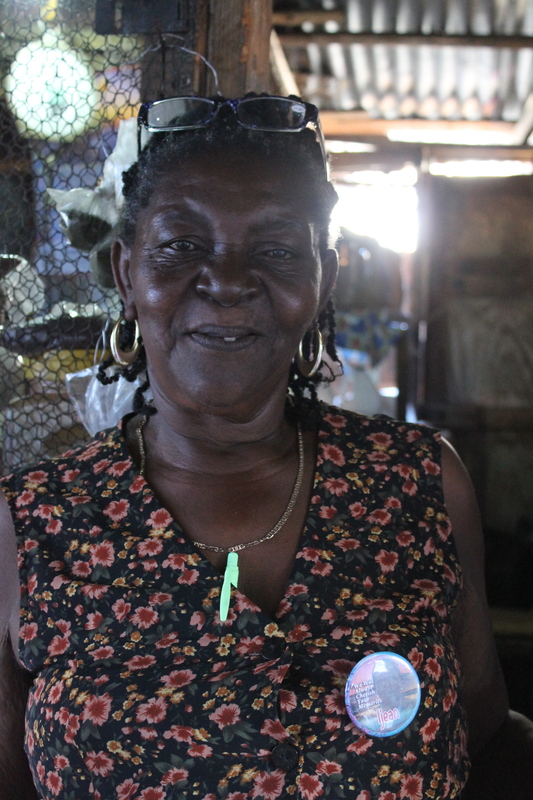 Lynda Lee told me that all (or most) of the markets (dry goods and grocery stores) in Jamaica are owned by Chinese. After emancipation in 1838, Chinese were brought over as indentured servants. Over the years, after the practice was ended in 1920, the Chinese went into the mercantile business. 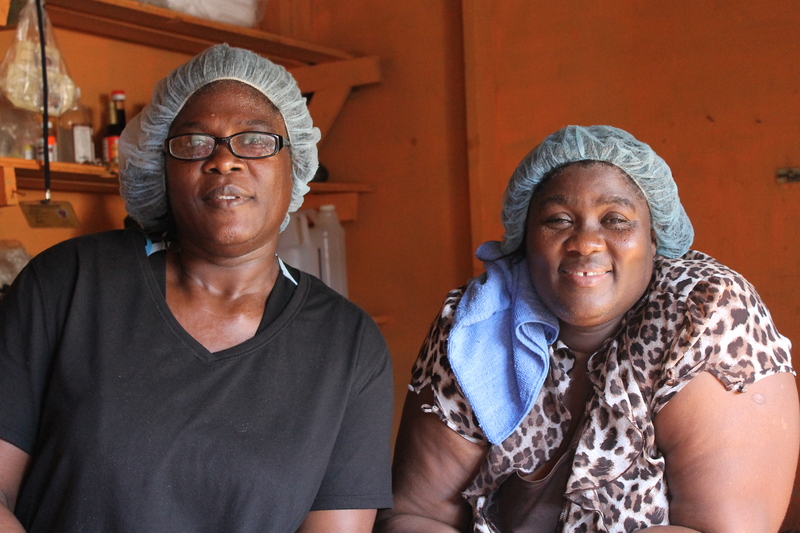 Their descendants and more recent immigrants have become very successful and have, of course, become a very important part of the Jamaican economy. 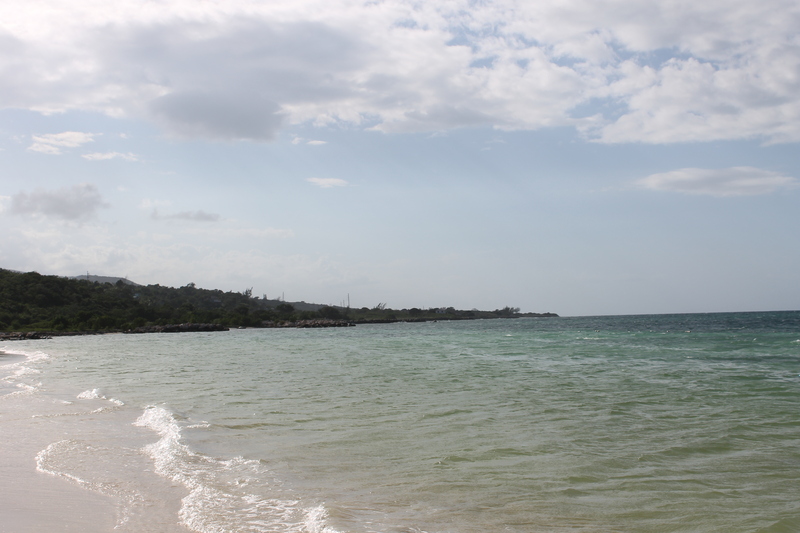 After this, we drove to downtown Montego Bay. Steve was on a mission to find Empire Records. 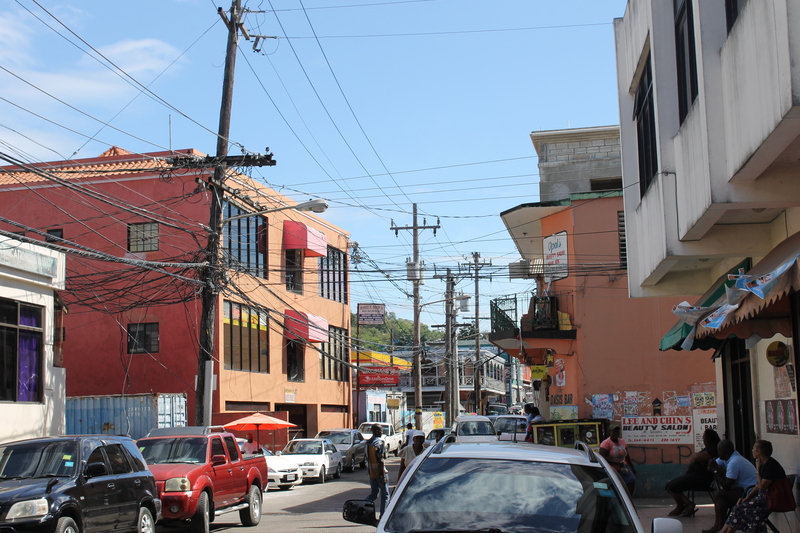 Downtown Montego Bay. It still has some elements of Georgian architecture. There was this gem. It was called “The Cage”. 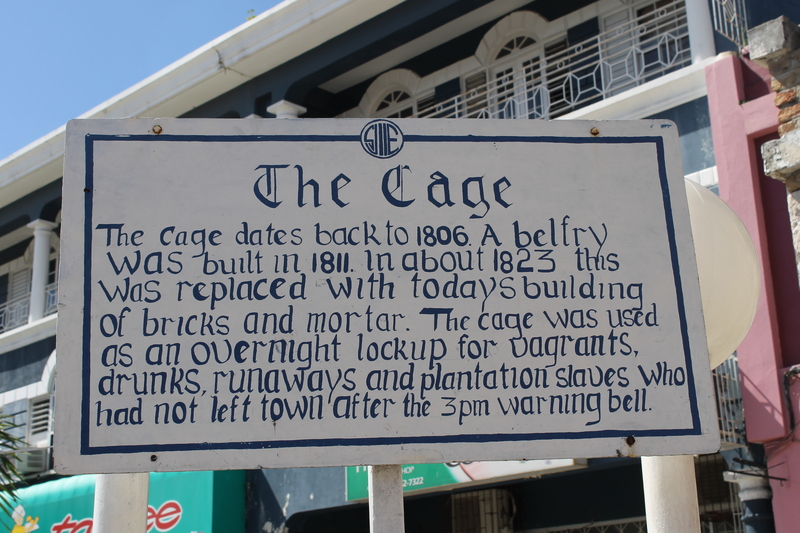 The short history behind “The Cage”. 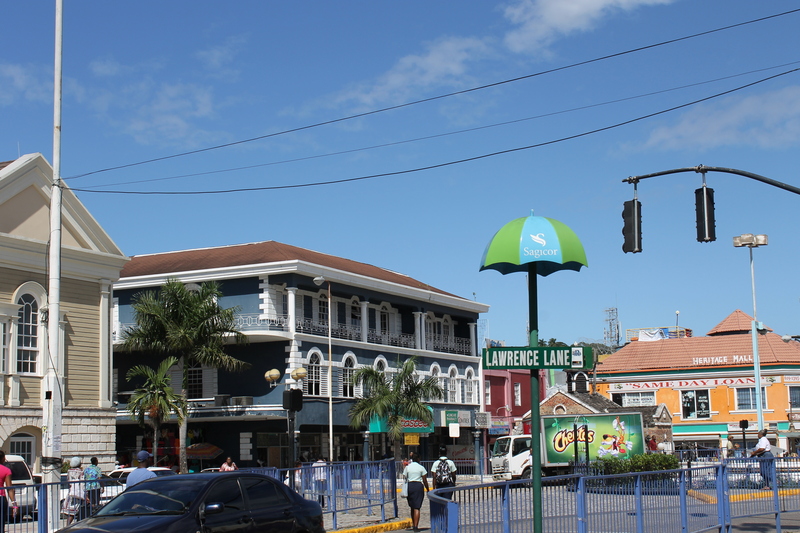 Downtown Montego Bay looking from Sam Sharpe Square. 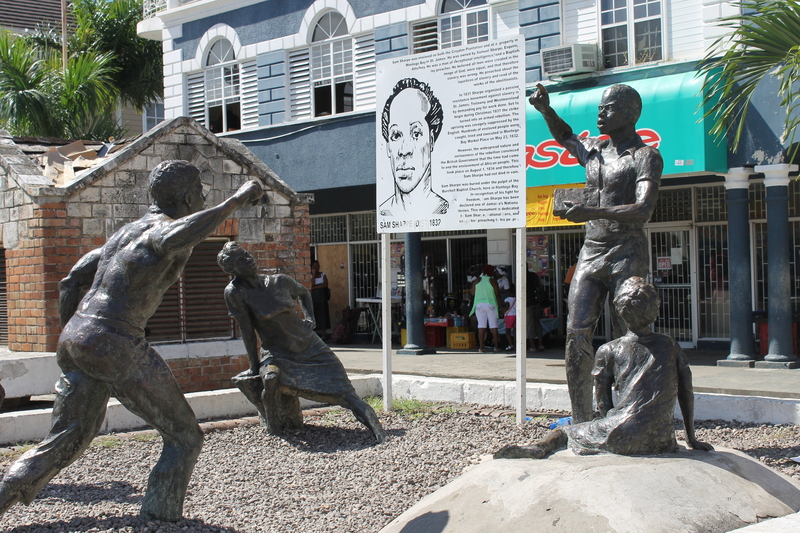 Statues of Sam Sharpe and 4 of his followers. Sam Sharpe was a slave who was the leader of the Jamaican Baptist War of 1832. He was unusually, for the times, well educated and his fellow slaves looked to and respected. He became a leader and deacon of his church who preached about the evils of slavery. While he initially preached peaceful resistance to slavery, in December 1831, the resistance turned violent. Plantation owners retaliated against the slaves and, in turn, the slaves burned the crops. Hundreds of slaves and 14 whites were killed in the ensuing violence. Within a few weeks, the rebellion was put down and the leaders of the resistance, including Sharpe, were captured and hung. Sharpe is considered a Jamaican hero and along with the statue in Montego Bay, he is also on the Jamaican $50 bill. While we went on the quest to find this seemingly phantom record store, we were able to get a good look around the city. It is a mix of Georgian and somewhat modern architecture painted in bright Caribbean colors. Everyone seemed to have a purpose and a destination to get to, even if there wasn’t one. It’s also a very young country; Lynda Lee told me the average age is under 30. Everyone seems to have a dignity that one simply doesn’t see in many places. And, everyone we spoke to was simply so lovely and kind. A perfect example of this observation was this man: The Gospel Man. The Gospel Man. He was blasting the sweet sounds of old-school gospel. Steve bought some music from him, too. Note his cart. All hand carts in Jamaica have the wheel on the end to help steer. This is what made the Jamaicans believe they could field a bobsled team. After a bit more searching and general confusion about its exact location, we finally found the fabled Empire Records. It was basically stacks of vinyl in a lottery shop. Steve searching through the stacks. He said they were pretty picked over. After all the searching he only found one record he was looking for. 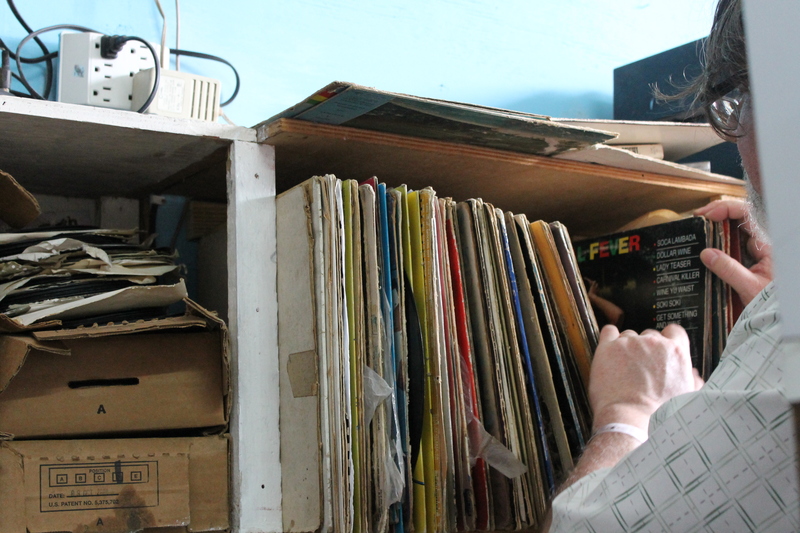 Steve said that he could’ve gone all day just searching through the thousands of 45’s that were there (at one time the music means of choice in Jamaica). But, since Lynda Lee and I were waiting for him, he decided against it. After this, we decided despite the rather substantial breakfast, we were hungry again. 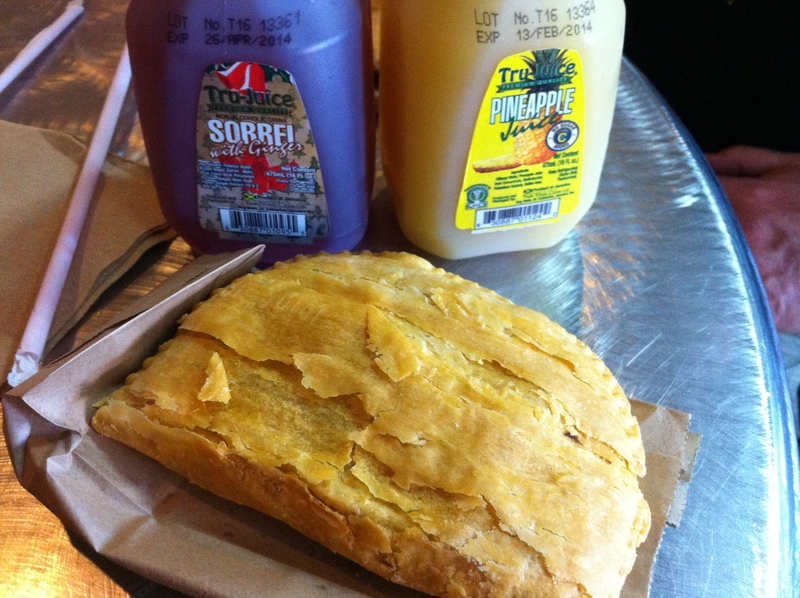 So, it was off to Tastee’s for Jamaican Meat Patties (apparently this is the place to go; it’s like the McDonalds of Jamaica – only better http://www.tasteejamaica.com). They’re a direct descendant of the English pasty. 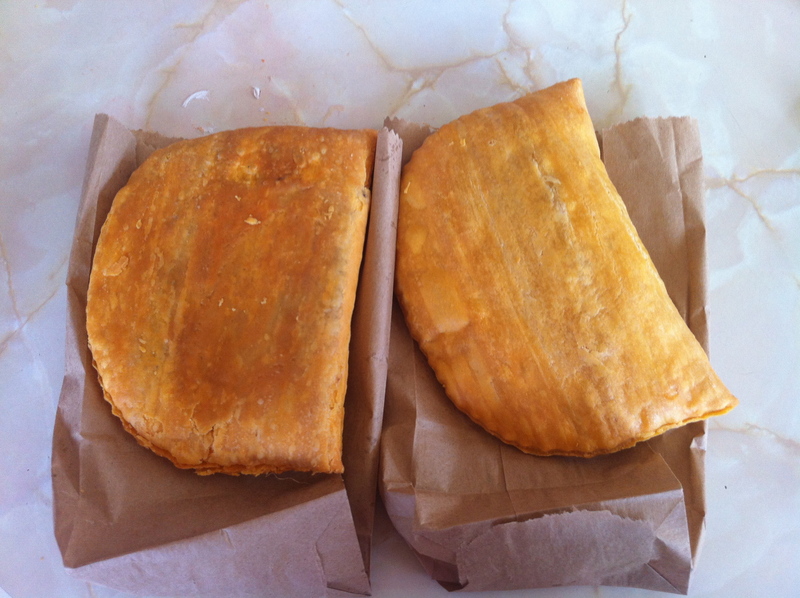 Authentic Jamaican Meat Patties. Delicious. One was a traditional style while one also had cheese. The filling was ground meat, most often beef, but it can be filled with other meats or even seafood, in a sauce and spiced with pepper, allspice, and some chiles. The crust is flaky (the yellow color comes from either egg yolks or turmeric in the dough). We kinda became addicted to these. I really need to find a good source for frozen ones. Or, better yet, learn how to make them. After Tastee’s, we made our way back to Lynda Lee’s car for the ride back to the resort. But, one last stop: Scotchies. 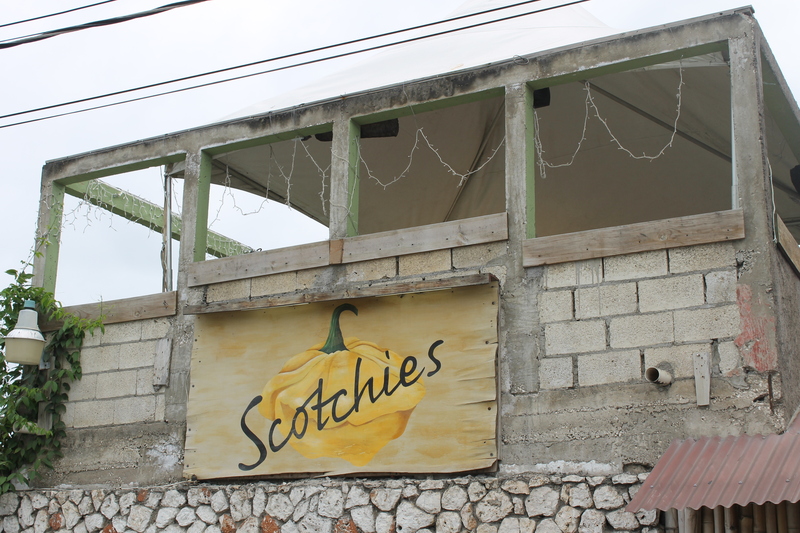 Scotchies is a very popular spot with locals and tourists alike. They have an extensive menu of jerk items, sausage, and fish. 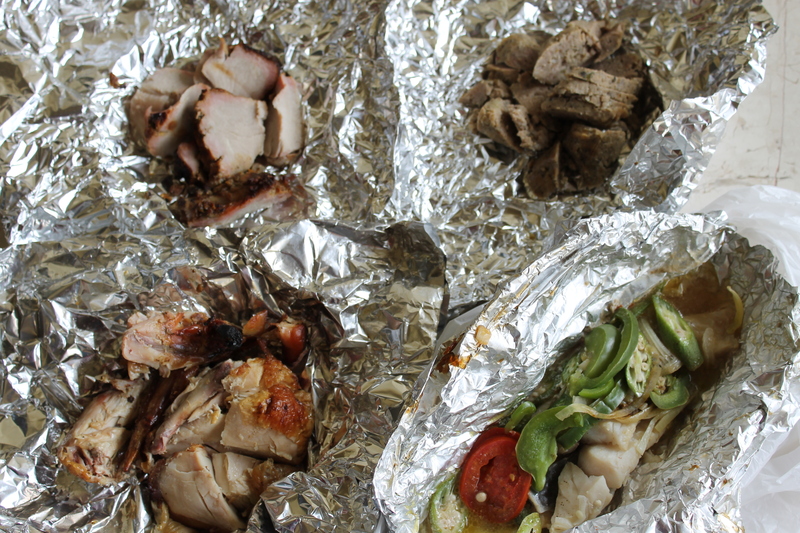 We opted to buy a little each of a lot of things: jerk chicken, jerk pork, pork sausage, and grilled fish. This, along with some produce from the market would be our dinner. As a quick explanation, jerk seasoning is basically a dry rub or paste that is rubbed, traditionally, on pork or chicken. It can be, however, used on other meats or even tofu. 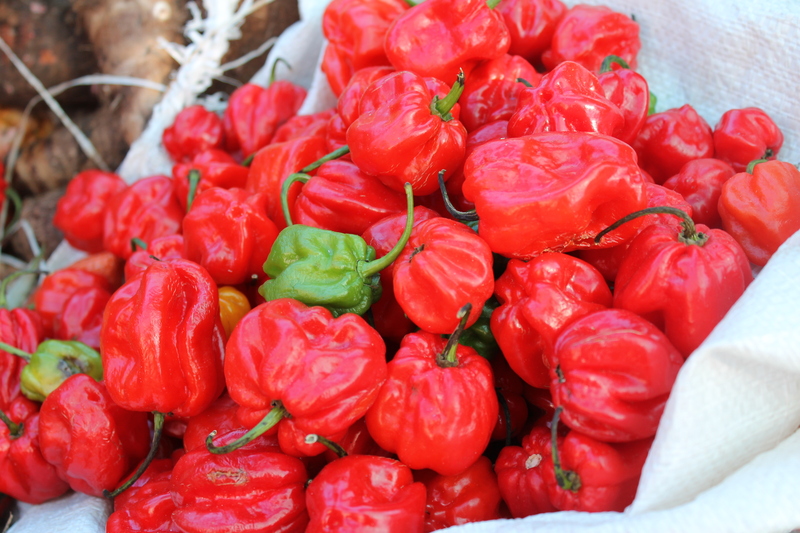 The two main ingredients in jerk seasoning are allspice (pimento) and habanero (Scotch Bonnet) peppers. other spices can include cinnamon, black pepper, garlic, nutmeg, thyme, and salt. 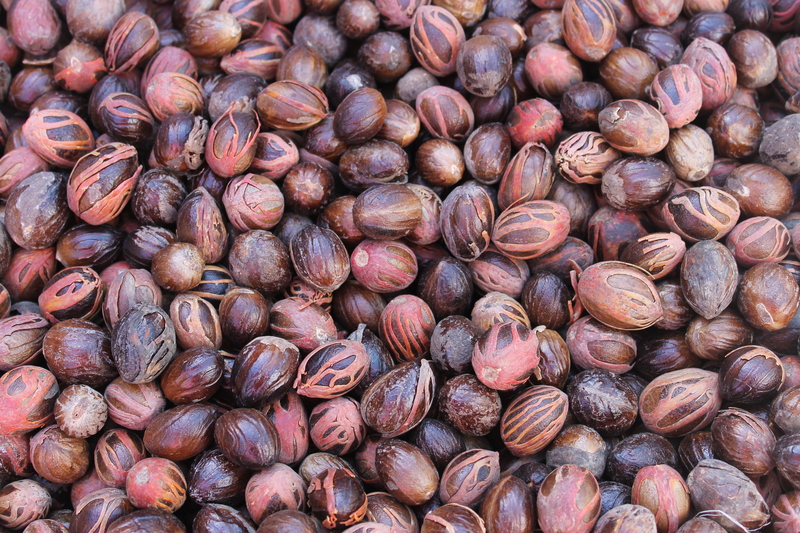 Like any other indigenous spice blends in the world, it has hundreds of variations depending on the region and family. The meat is traditionally cooked on pimento wood (allspice trees). 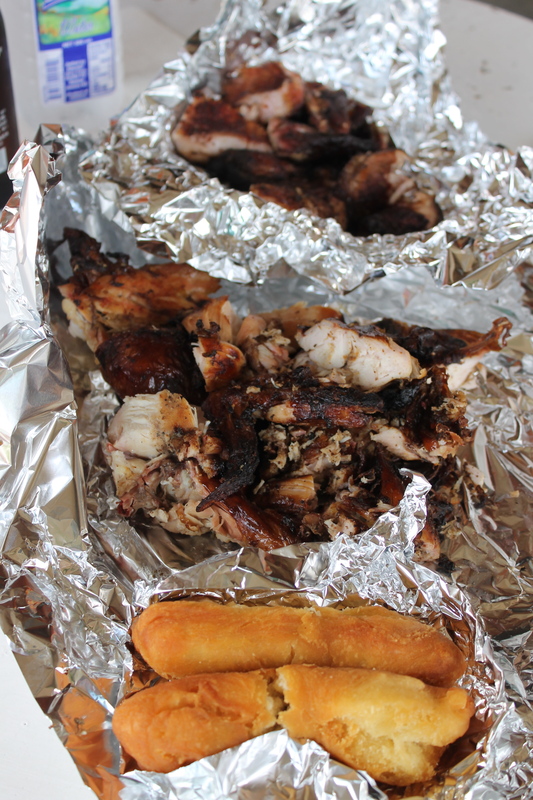 But, you’re just as likely to find street vendors cooking jerk chicken over charcoal in barrels. 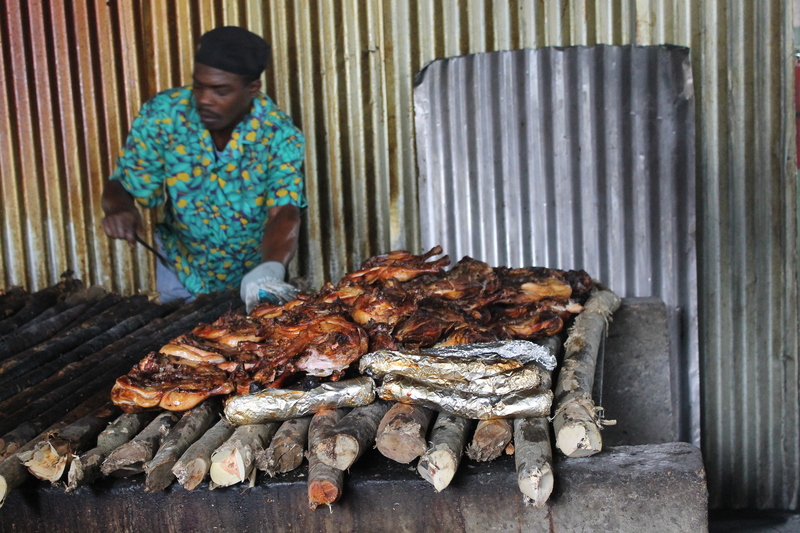 One of the cooks tending to the jerk chicken and pork at Scotchies. Here, he’s cooking it over a charcoal pit with the pimento wood on top. The corrugated sheet is placed on top to help keep the meat hot. After this, Lynda Lee took us back to the resort. We agreed to meet at 8am saturday morning. She left. We took our goodies upstairs, changed into our swimsuits and went down to the beach for a while. Finally, we decided to eat dinner. What we brought back was infinitely better than the resort food. 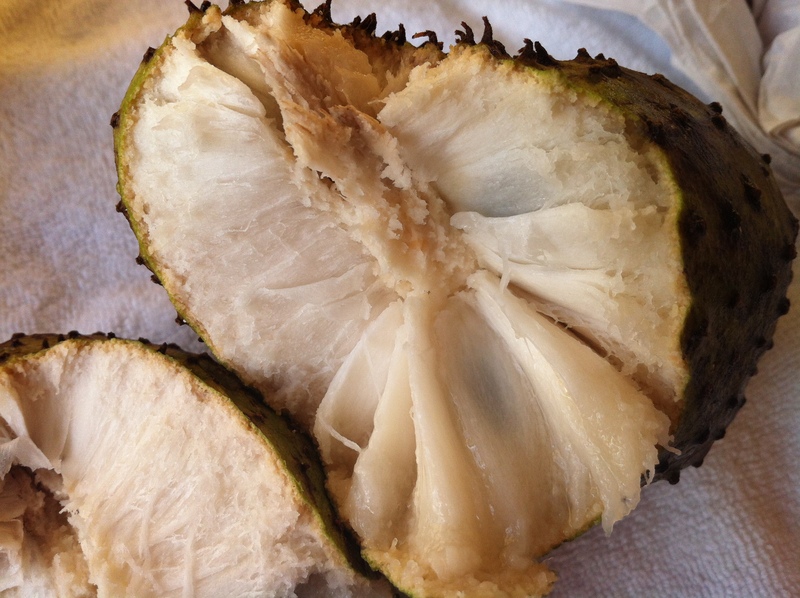 The inside of the Soursop. Lynda Lee picked this one out for us and it was perfect. The texture was creamy and the flavor was just the right balance of sweet and sour. There are seeds in the pulp, but they are hard enough that you’ll catch them before you bite through them. The papaya. It was just short of being overripe. I did try some of the seeds. They taste like raw radishes. The apple. 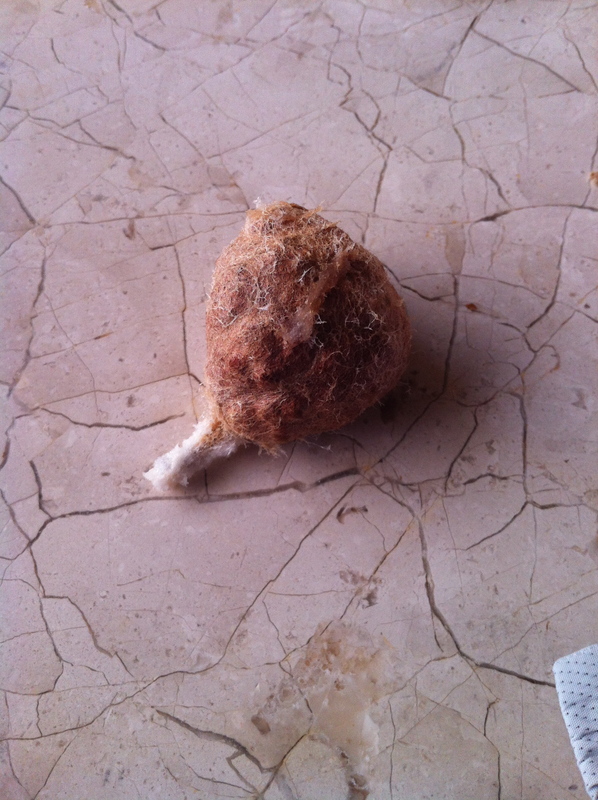 The texture was unusual in that it looked like cotton but it was juicy with a good crunch to it. The flavor is like almost like a mild apple (like a Golden Delicious) crossed with flowers. Roses came to mind for me. The apple seed. I thought briefly about bringing it home. However, I’d’ve probably been breaking about 10 federal laws, so I opted to leave it. Now, for the meat course. The fish was cooked with vegetables and chiles and steamed in foil. Almost like an escabeche style. The pork was tenderloin and very tender and flavorful. The chicken, if a little dry, had a good spiciness to it. Steve’s favorite was the pork sausage. It had a good, if course, texture and a spicy flavor. It all had a kick to it that I’m guessing is ubiquitous in Jamaican cooking. We concluded that it was the best food day we’d had on the trip. Well, the best day we’d had so far. But, Saturday was coming and Lynda Lee was taking us out into the countryside. Lynda Lee met us downstairs at 8am ready to take Steve & me into the wilderness. 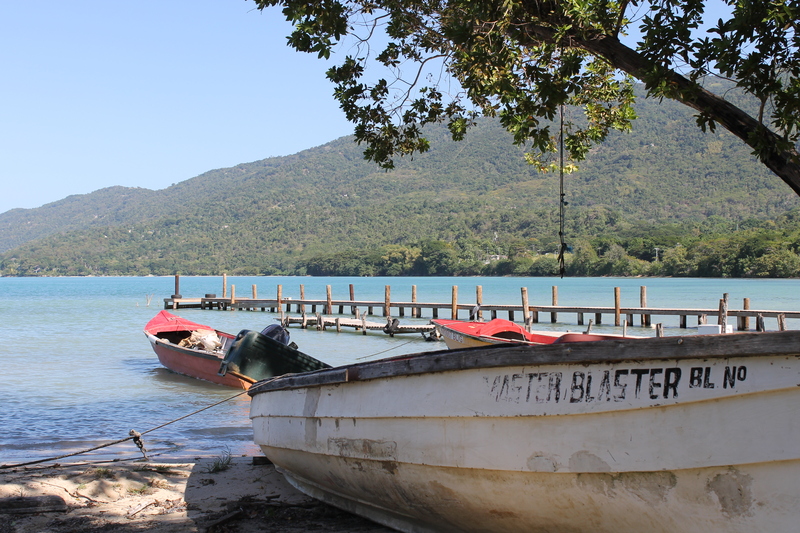 We first made a stop in Montego Bay at a cook shop known as Poor Man’s Pelican for, what else? Ackee & Saltfish. Hey, eat what the natives eat. It’s usually better. 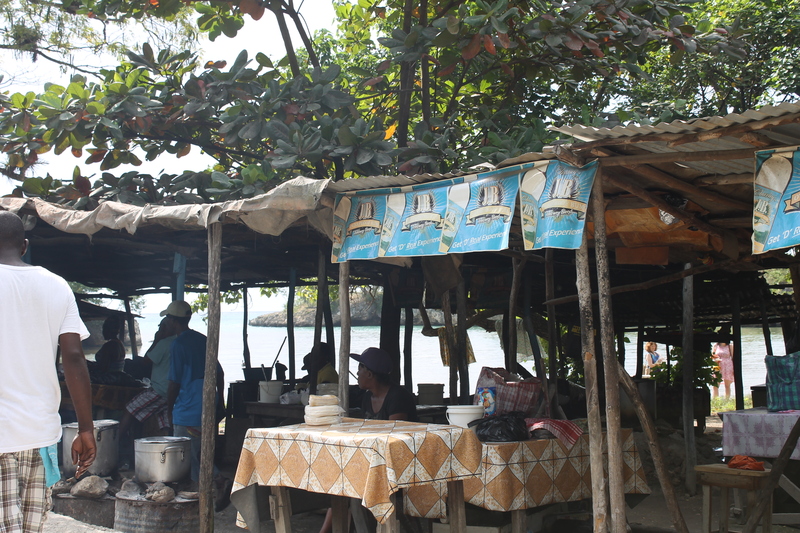 The breakfast here was a little different from the one in the market on Friday: The Ackee & Saltfish was made with the traditional salt cod instead of mackerel, the dumplings were boiled instead of fried, the yams were again boiled, and there was also a side of steamed & shredded cabbage. Breakfast. This’ll set you up for the day. 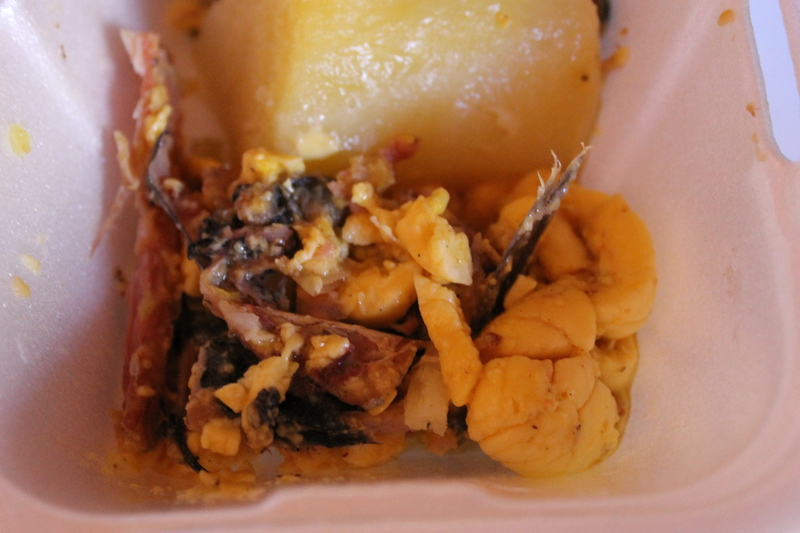 The more traditional Ackee & Saltfish made with salt cod. I can’t really compare the two. They were equally delicious, but different. I will say, though, I did like the boiled dumplings more than the fried. 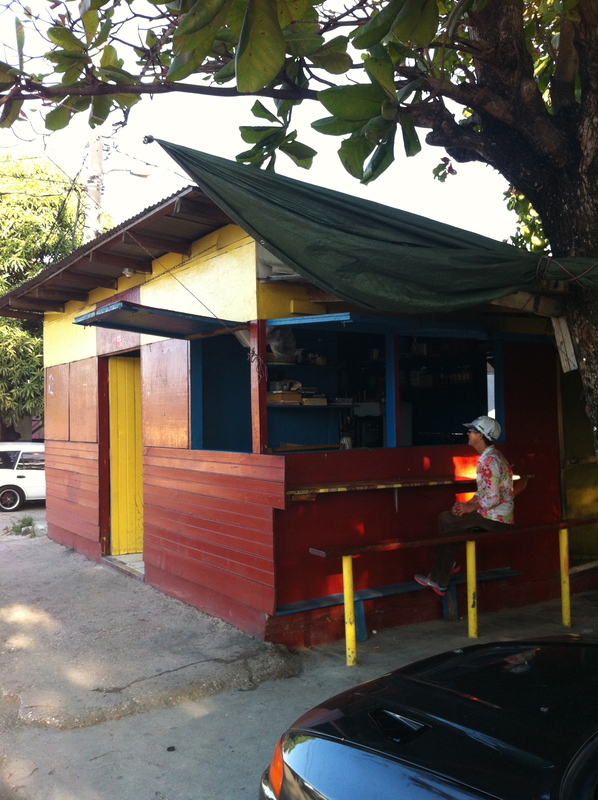 And, the Ackee & Saltfish at Poor Man’s Pelican was a bit oilier (which probably helps to explain the boiled dumplings – soaks up some of the oil). After breakfast, we headed the opposite direction towards the south and west coasts of the island. 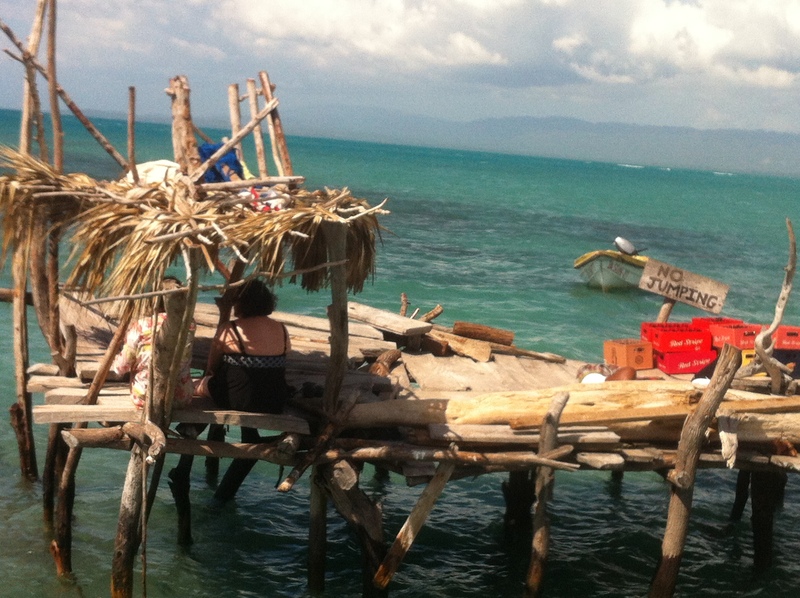 We had an eventual goal in mind: The Pelican Bar in Pelican Bay. 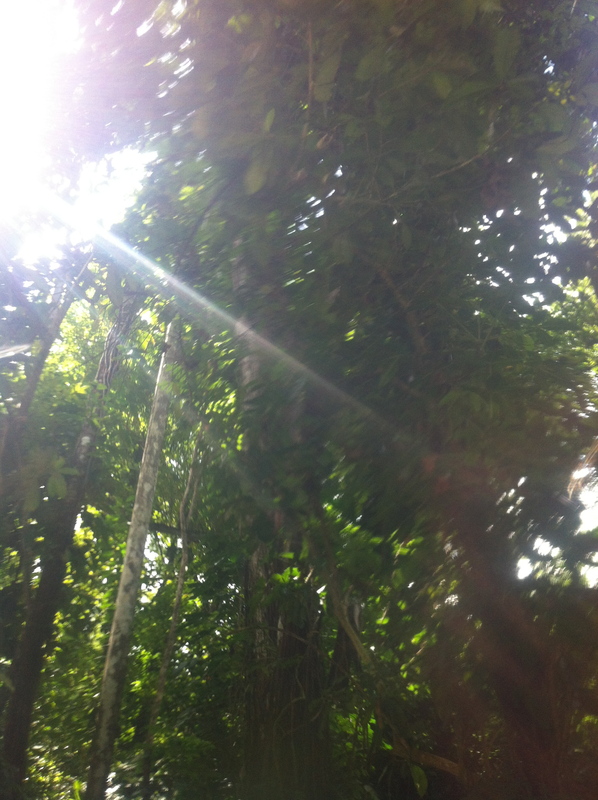 The Jamaican countryside is not at all what I expected it to be. I was thinking it would be all palm trees and sand. The stereotypical vision of what a Caribbean island should look like. Well, I was wrong. It ranged from lush and green to hilly to brown and scrubby the further west and south we went. No exactly the countryside, but we thought this sign was funny. 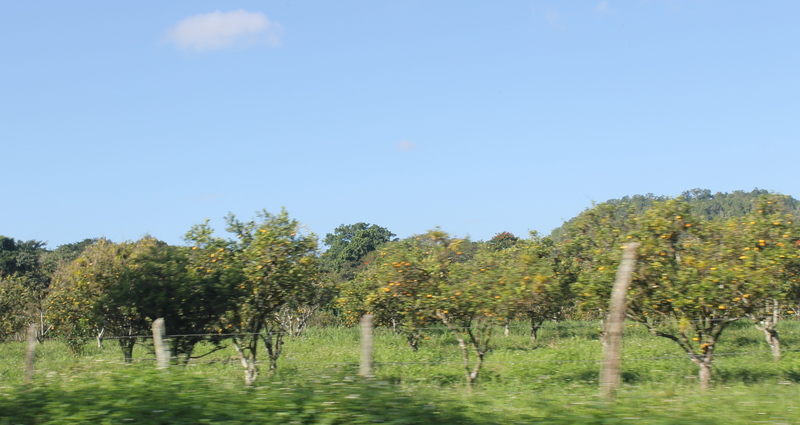 Pictures from the car: Orange groves. I had no idea there were groves in Jamaica. Makes sense, really. Pictures from the car: Fire Tops. 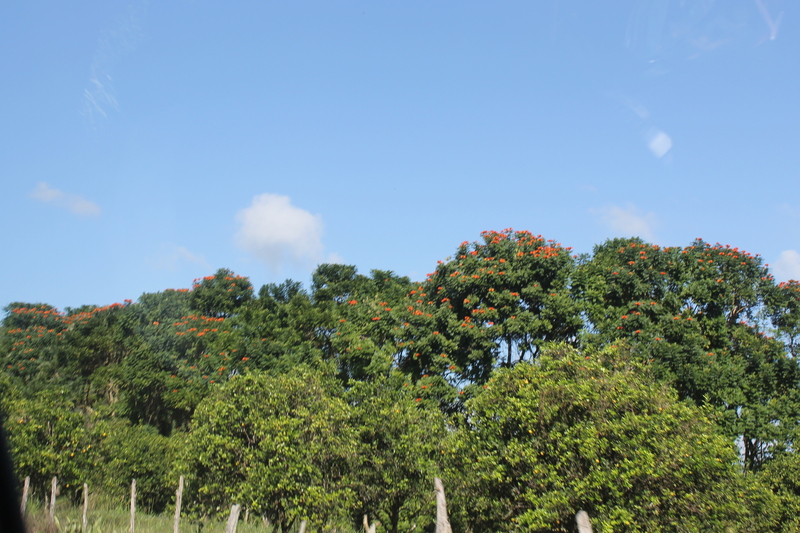 They get their name from the red flowers that grow at the top of the trees. I wish they grew closer to the ground so I could get a better look at them. 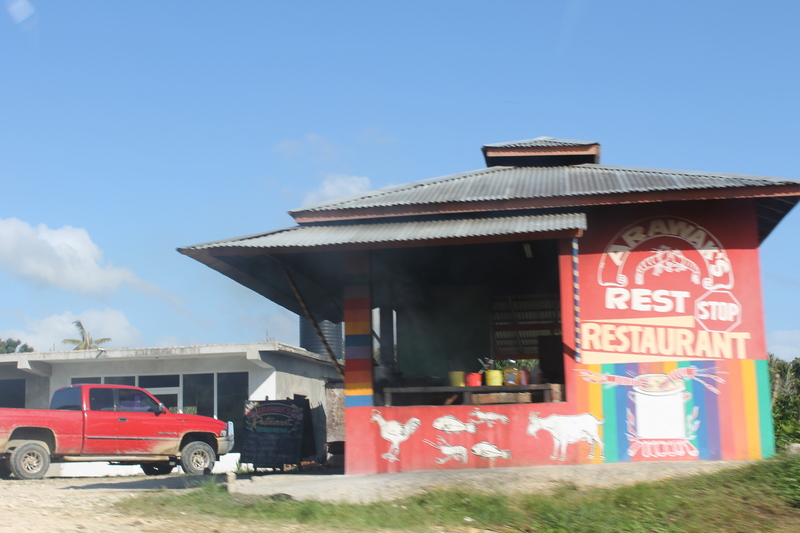 Pictures from the car: Managed to get a good photo of this cook shop. I wonder how the food is there. Pictures from the car: More Fire Tops and the hills. The island is ringed with basically one major highway (the A2) with smaller roads and spurs coming off of it. 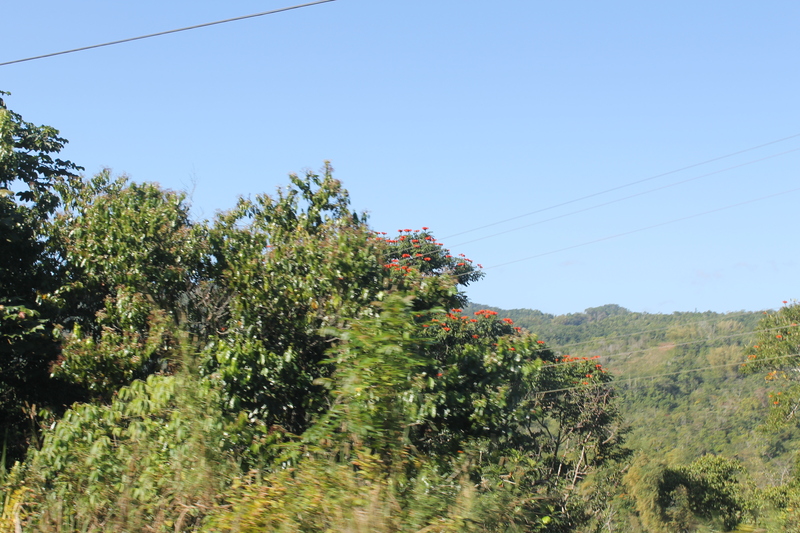 Outside of the major towns, much of it is basically a two-lane road (at least what we drove on), and depending on the parish administration, can either be a well maintained road or a rut-filled dirt track. I was admittedly reluctant to ask Lynda Lee to stop so I could take photos because there were essentially no shoulders. One side of the road was rock face and the other was drop off into a deep valley. I finally worked up the nerve to ask her to stop and pull over so I could take a few photos. We picked a good place. 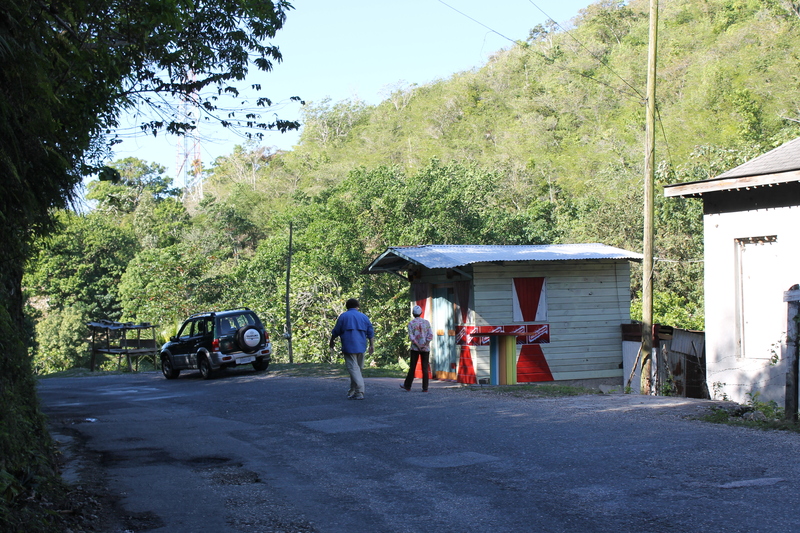 I’m not sure what town we stopped near (it was somewhere between Ferris Cross and Bluefields; possibly Cave). This was a neighborhood bar that wasn’t yet open for the day’s business. 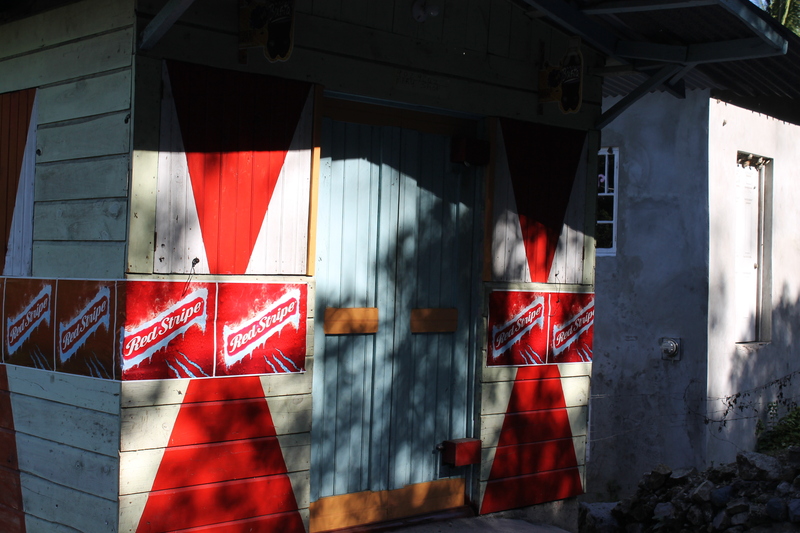 They obviously serve Red Stripe. 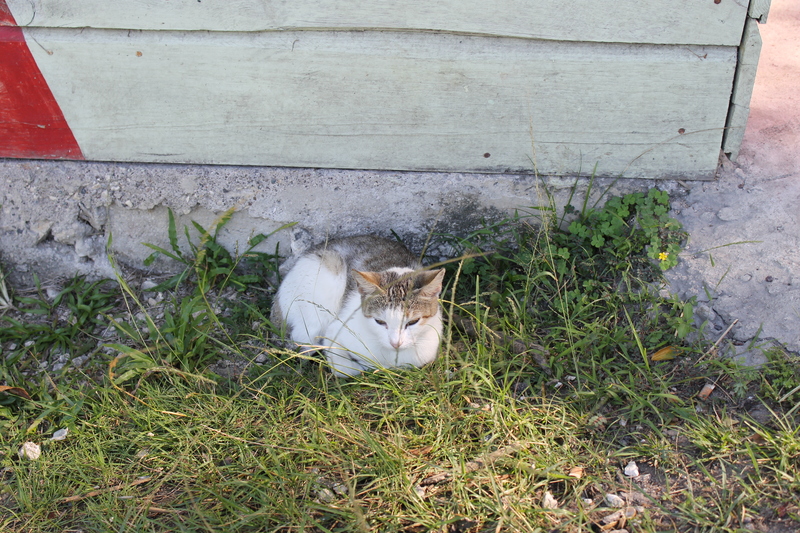 Jamaican Cat. Being a cat person, I can appreciate this. 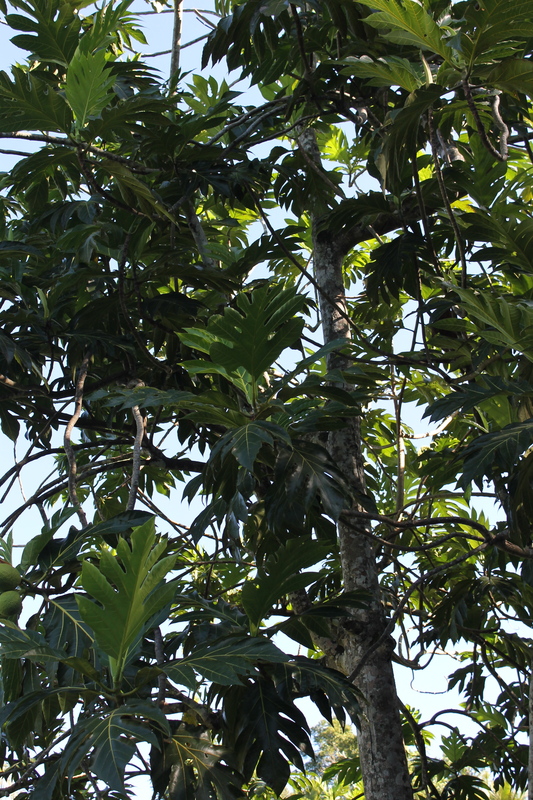 Breadfruit Tree. They weren’t in season yet, so we didn’t get to try them. You can just see the fruit in the tree. 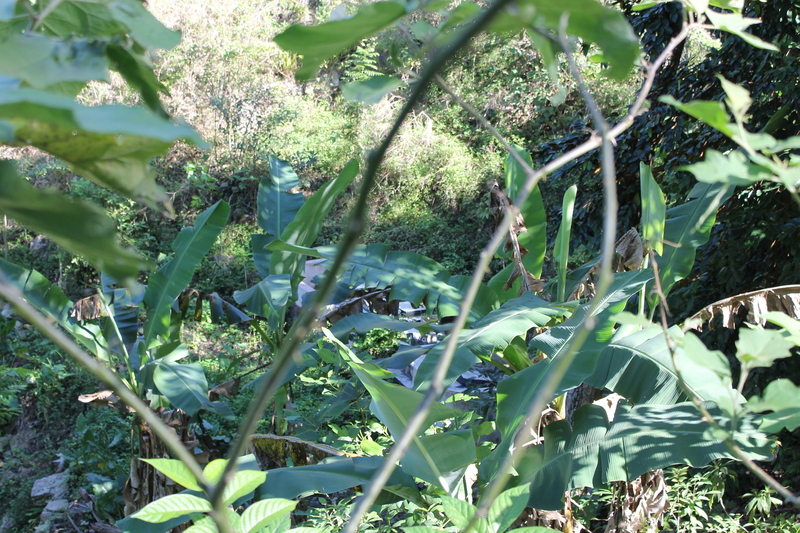 They’re a little difficult to see, but if you look closely, you can see some white peeking through the foliage. Those are above-ground tombs. Think New Orleans. Only in the family backyard. After we had been there a few minutes, a gentleman walked up to us to see if we needed help. 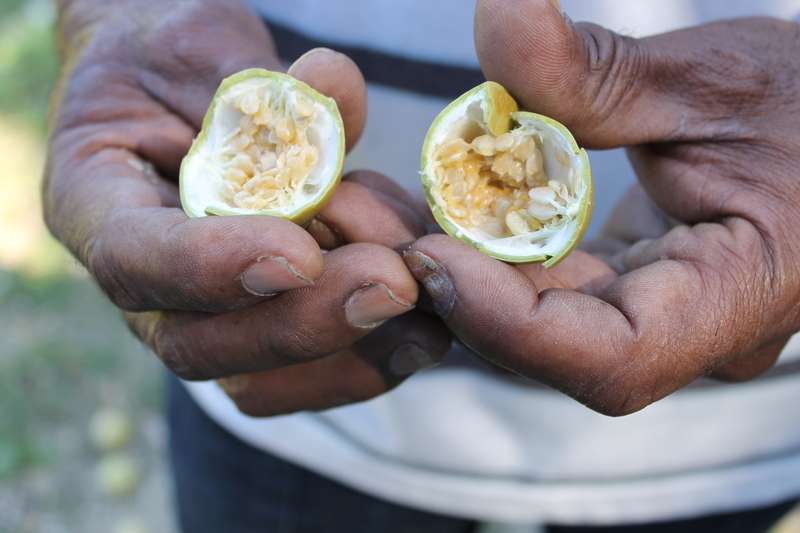 When Lynda Lee explained we were just looking around, he started talking to us about the fruit that he had in his hands – sweetcups. 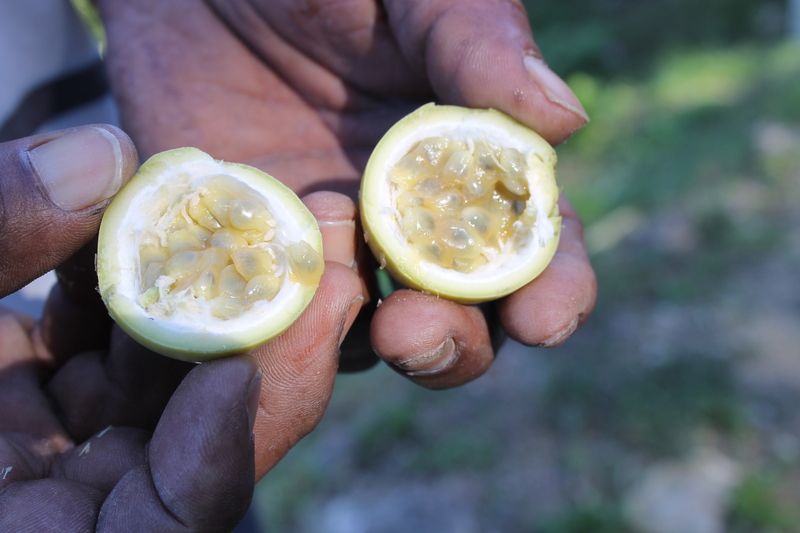 They are relatives of the passionfruit and crack just like eggs. Underripe Sweet Cup. He said they are very sour at this point. Aren’t those magnificent hands? Ripe Sweet Cup. He said at this point they’re very sweet. While Lynda & I were talking to him, a lady walked up to see what was going on. She and Steve began talking. From what he could glean from their conversation (we were pretty deep into the country by now, so her Patois accent was quite thick), she was on her way to a funeral. The man was shot, she said, and his body was frozen until they could bring him home. She was quite open about it. She was dressed in what was likely her best clothes and wanted Steve to take her picture; so he did. The lady on her way to a funeral. She just wanted her picture taken. Her shoes were magnificent. They had beaded snowmen on them. 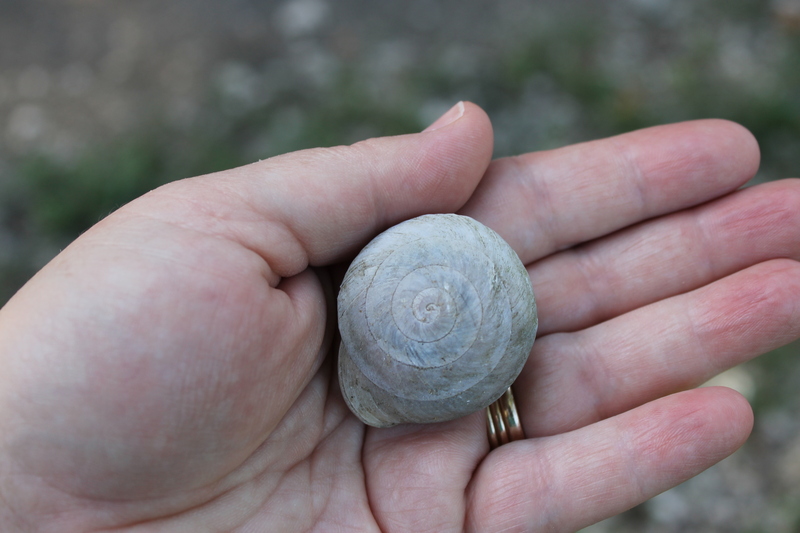 I suspect this snail died of old age given the size of the shell. Who knows. I didn’t keep it. There was something rattling around in there. 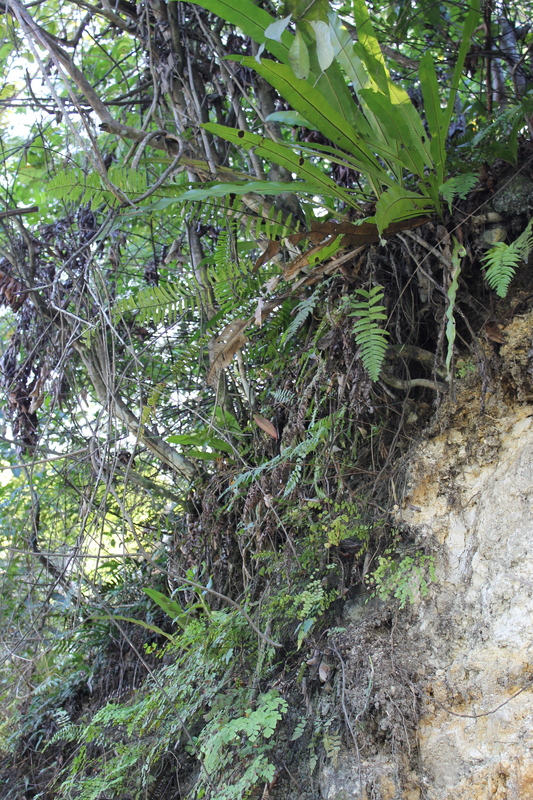 Ferns on the rock face on the opposite side of the road. I really had to watch for cars. Soon, we were off again. Steve and Lynda Lee headed to the car. 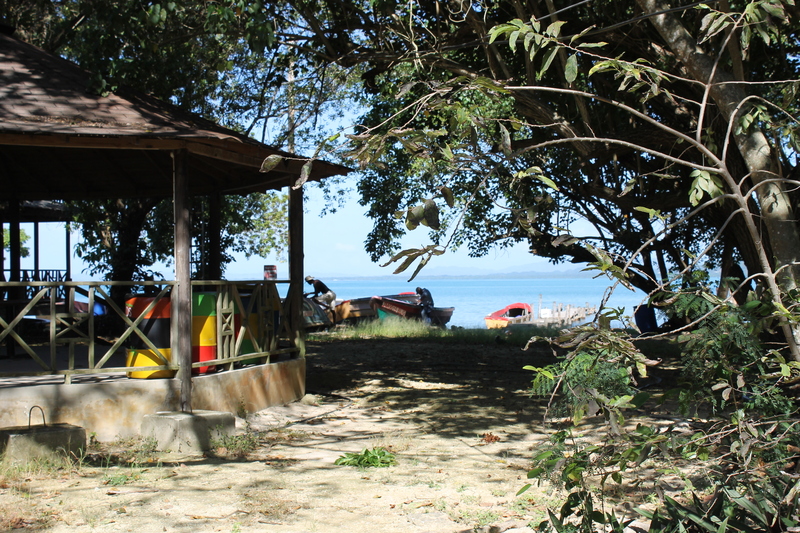 Our next stop was the small fishing village of Bluefields. Lynda Lee had done some work there with USAID about 10 years or so ago and wanted to show us around a bit. 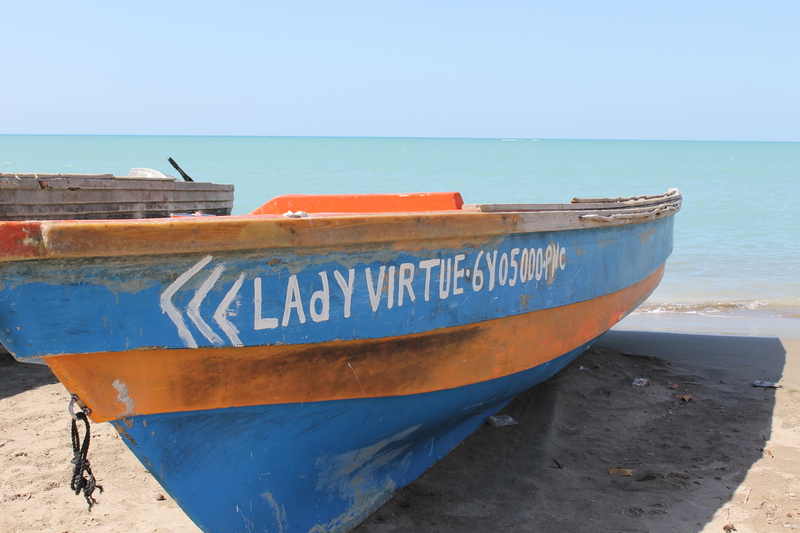 She said that while USAID basically provided the funding and got the program going, the local fishermen took it upon themselves to clean up the bay, begin fishing further out into the sea, and allow the fish to repopulate the bay. They learned how to manage a sustainable fishing model. 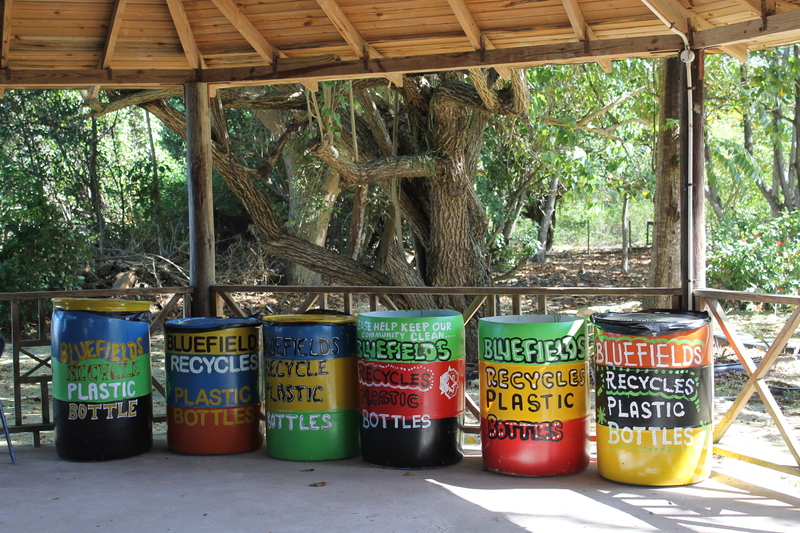 One of the other things they started in Bluefields is a recycling program. All recycling barrels should be this festive. As is my wont, I started wandering around. 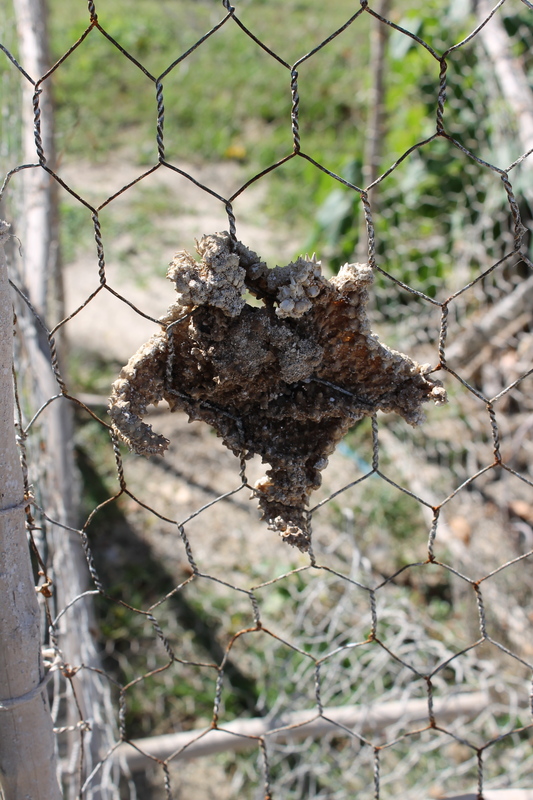 A very petrified starfish inside a fish trap. 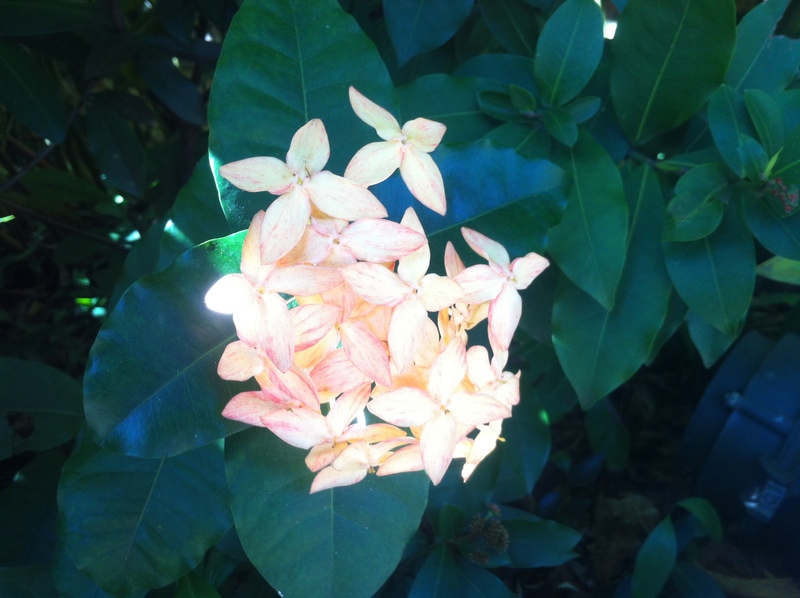 Another one of Jamaica’s beautiful flowers. 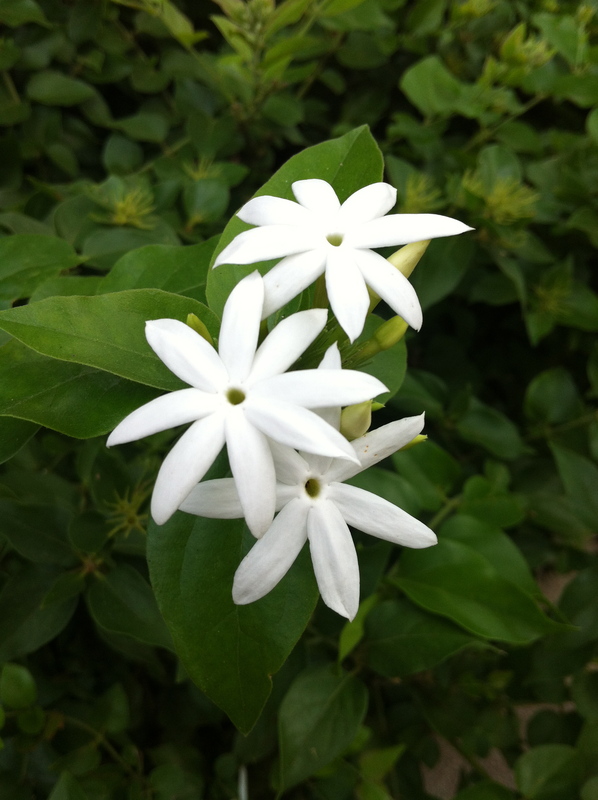 Lynda Lee said these are basically a wildflower that grows all over the island, but she couldn’t remember the name. 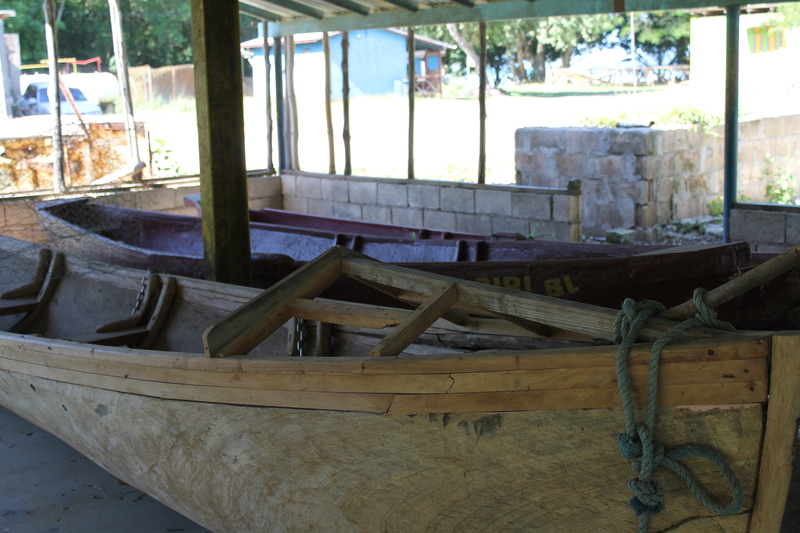 Boats in various stages of construction. 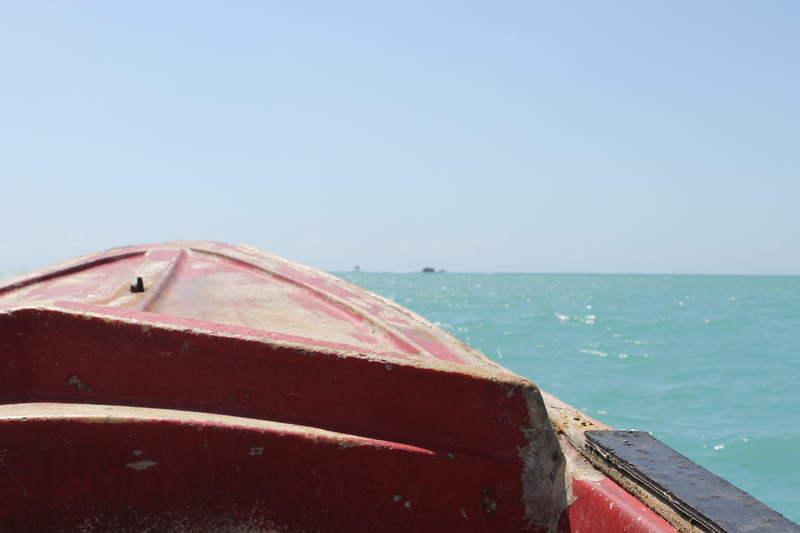 We continued on our way from Bluefields to the Pelican Bar. 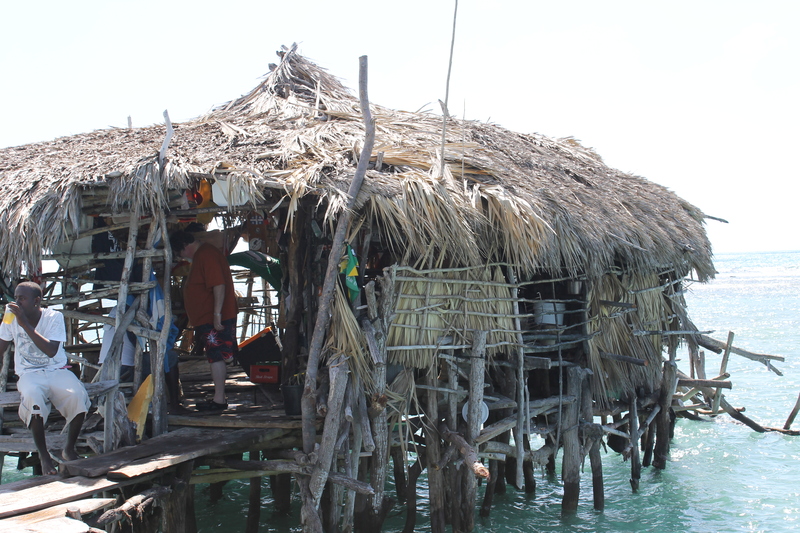 The Pelican Bar has become quite the attraction since it was first built in 2001. It was built originally by a fisherman, Floyd Forbes, as a place where he and his fellow fishermen could hang out after a day’s work. 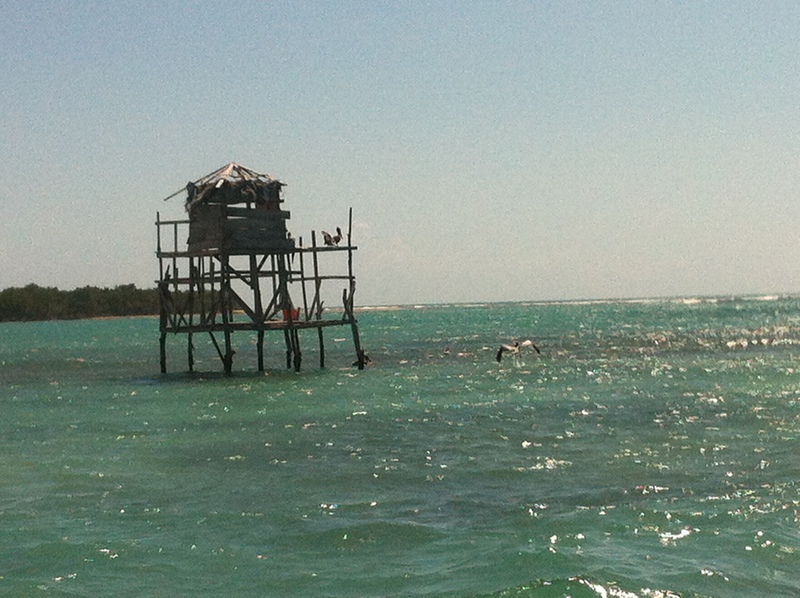 He built it in Pelican Bay (so named because of the large number of pelicans who nest and roost there) on a sandbar. Before long, the local hotels saw the potential of promoting the bar as a way to attract tourists to the area. 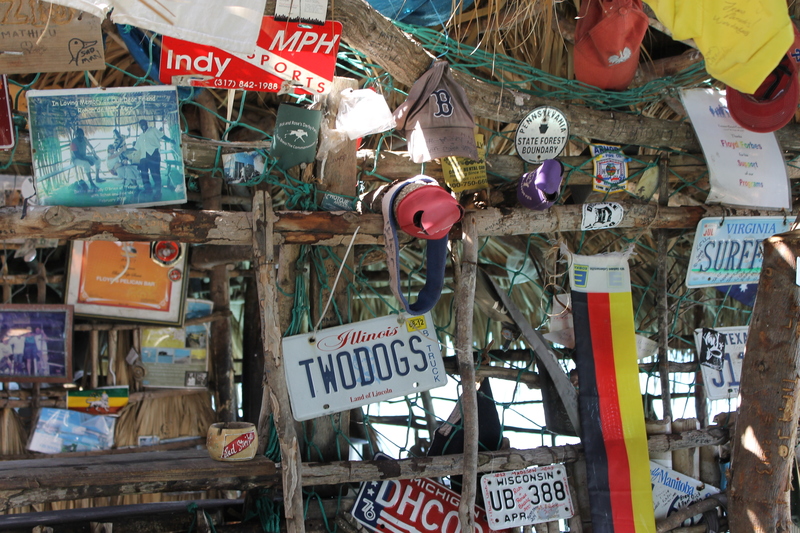 In 2004, the bar was destroyed by Hurricane Ivan. Floyd didn’t have the money to rebuild. 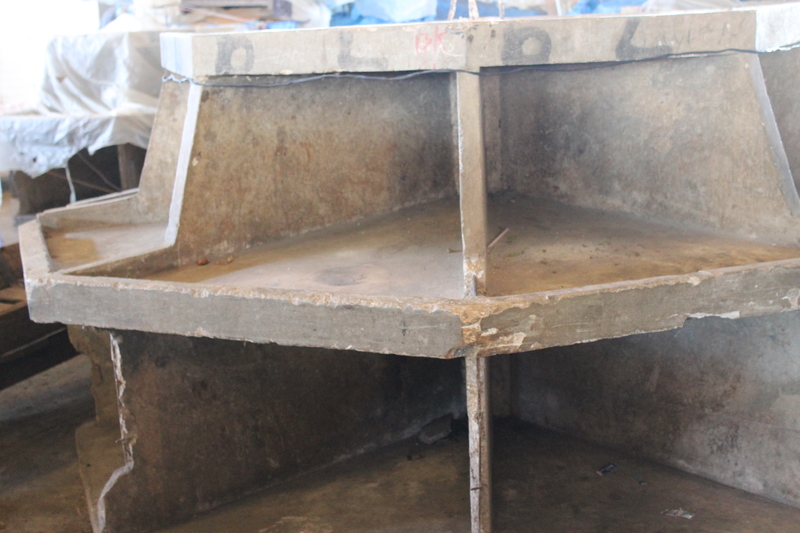 However, a local hotel owner donated money and materials so the Pelican Bar could rebuild. Before we left to go to the bar, Lynda Lee pulled out a rather sinister looking tool and told us that it was used to open jelly coconuts. That’s when I learned jelly coconuts are simply fully ripe coconuts that haven’t dried yet (becoming the coconuts we’re all familiar with). 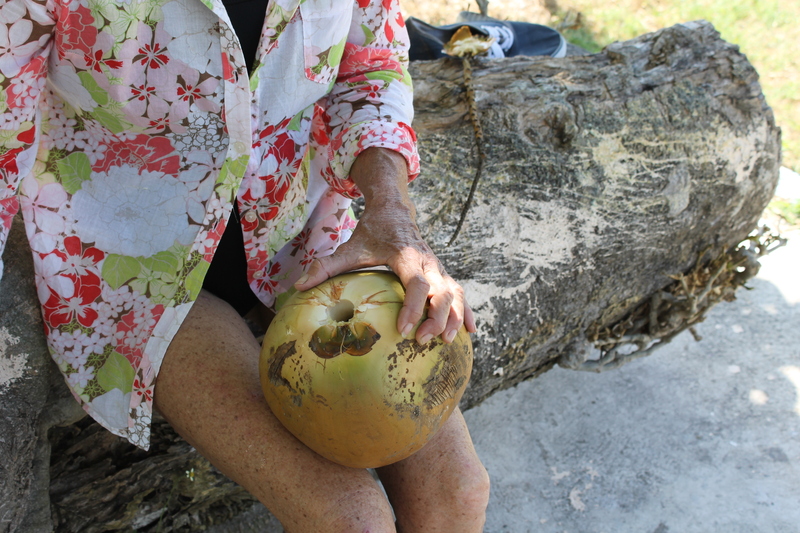 She cut the stem out with this tool – it looked like a very thin, curved, sharp trowel – and we all had a refreshing glass of jelly coconut water. The bar itself is about a 10-minute boat ride from shore. You simply hire a boat to take you out and the bartender will call when you’re ready to be picked up. Or, you can also set a time for the driver to pick you up. I think. 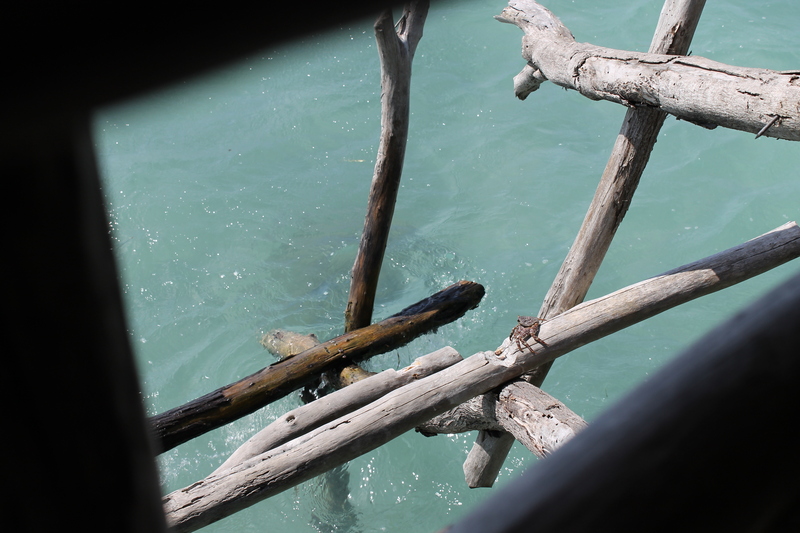 Our first glimpse of the Pelican Bar. That’s it on the horizon. Once you get up to the bar, the driver ties the boat to the steps and you carefully get out. More visitor memorabilia. 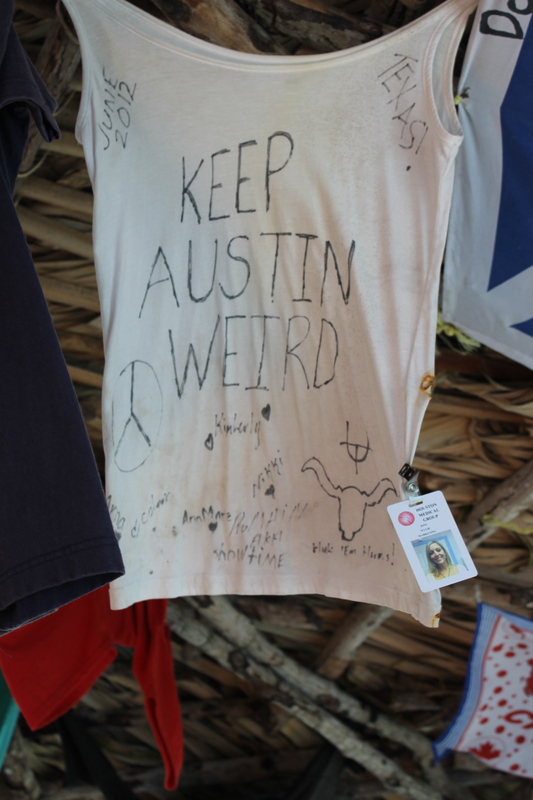 There was also more “Keep Austin Weird” stuff. Steve & I both looked at each other and said, “Who brings a license plate on vacation?”. After getting past the tourist-left rubbish, I made a point to just enjoy the beauty of the place. The pelican roost. There were a lot of them out that day. Lynda Lee went snorkeling, Steve was inside drinking a Red Stripe, and I sat on the steps in the water and just decided to revel in the sounds of the sea. 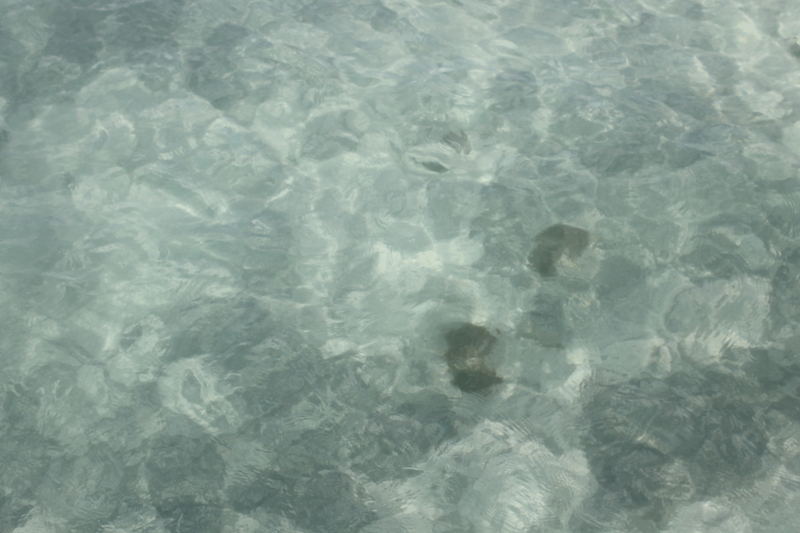 The Caribbean was literally chest deep here. After awhile, I moved to the back to dry off and get a little more sun. Steve got in the sea and swam a bit while Lynda Lee joined me. While Lynda Lee and I were talking, a fisherman docked at the bar and asked us if we wanted to buy some of his catch. We declined. 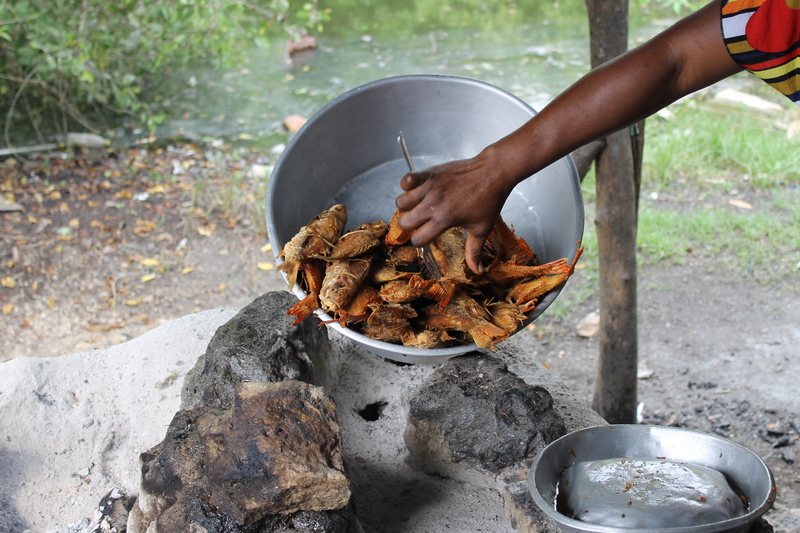 However, you can buy seafood from the fishermen and they’ll cook it up for you at the bar. Or, sometimes, the bar has something already made. We were still full from breakfast, so we didn’t eat anything. 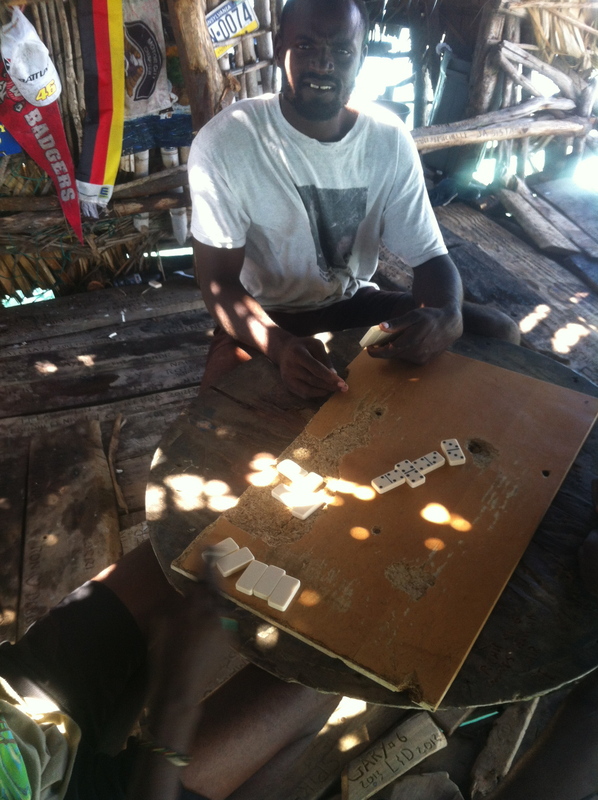 But, the fisherman did join some of the other gentlemen in the bar for a game of dominoes. It seems to be a contact sport here. At the least, it’s taken very seriously. It was fun to watch. A game of dominoes in progress. About this time, we asked the bartender to call to shore so our boat could pick us up. The wind was starting to pick up and we could see clouds on the horizon, so we decided it was a good time to go. Also, another boat of tourists was coming towards the bar. Call me anti-social, but I wasn’t having any of that. But first, since we had to wait anyway, a little more relaxation and photos. Basically, the back dock. I’m pretty sure this is where most of the fishermen will moor their boats. That’s me & Lynda Lee under the canopy. I had a sunburn by this point. Our boat arrived and we were ferried back to shore. 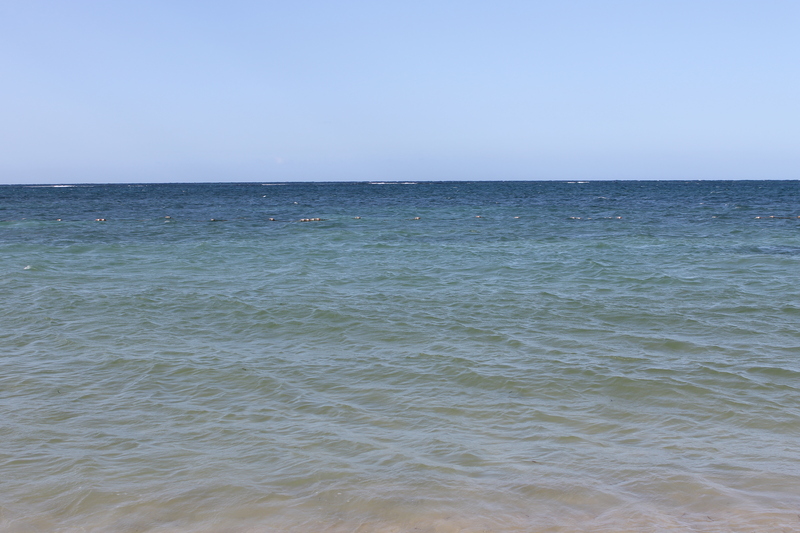 After hosing ourselves and our belongings off – kinda – we headed back towards Montego Bay. We ran into some pretty heavy rain and the reality of the rut-filled dirt roads hit hard. They become mud pits. Lynda Lee smartly had a 4-wheel drive; so, while problematic, the roads were passable. On our way out, we passed through a town called Whitehouse where they were setting up a row of cookshops for the Saturday night crowd. Coming back, the shops were open for business and we decided to stop. Some of cookshops in Whitehouse getting ready for Saturday night. We were immediately surrounded by vendors hocking their wares. It all looked really good. Lynda Lee, in her quiet way, told them we were just looking and they seemed to back off rather quickly. One lady did say that she had some fish fresh out of the fryer. Lynda Lee said that was the person to see. Fish fresh out of the fryer. 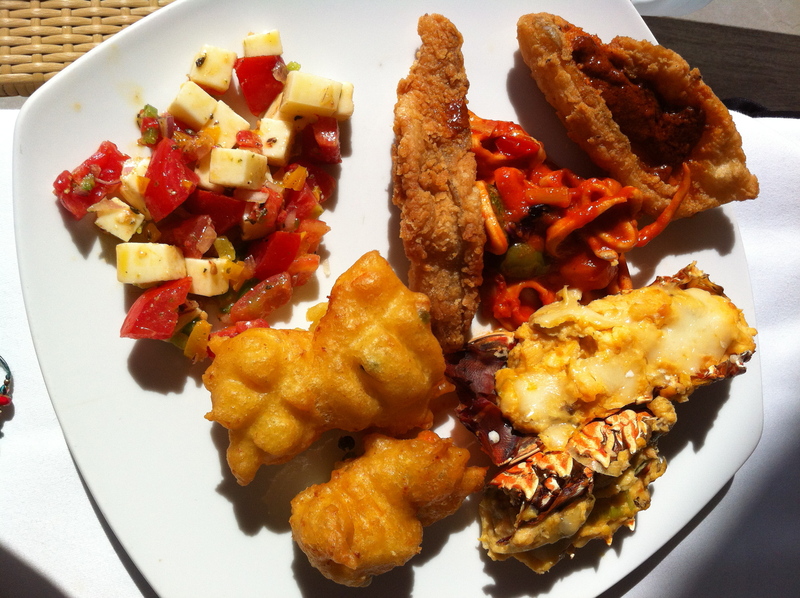 She had parrot fish and red snapper. We opted for parrot fish. Bammy Bread. 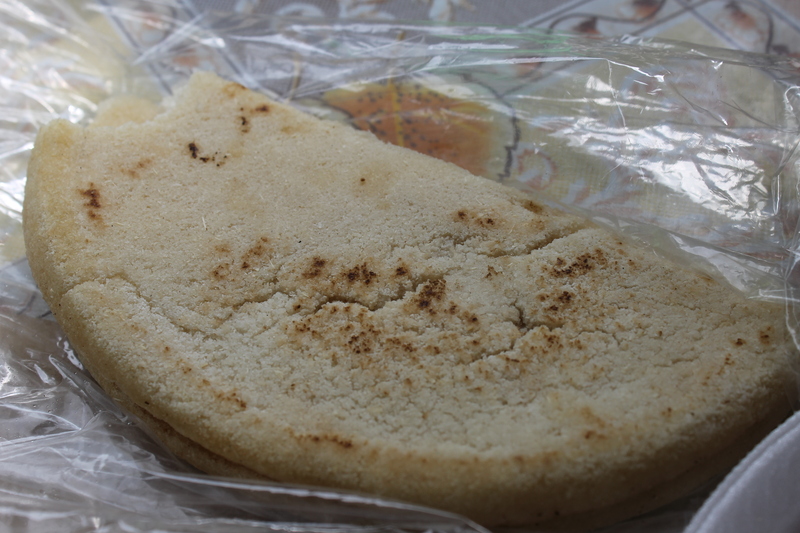 A very heavy and soft flat bread made with cassava. 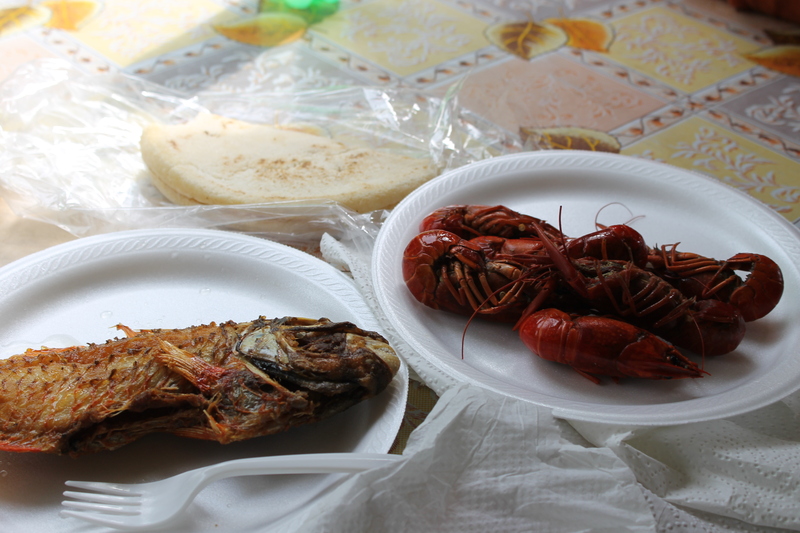 Bammy Bread, Pepper Shrimp, fried Parrot Fish. 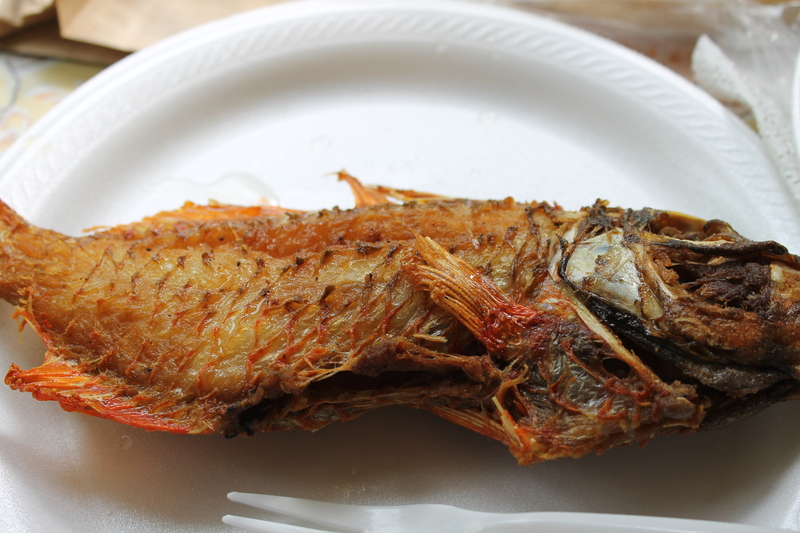 It was, quite honestly, the best fried fish I’ve ever eaten. I don’t know what she did, but it was magic. If I ever get back there, I’m gonna ask her. My dad told me when he was going to college in Florida, he and his friends would just throw these back. Boy, did he miss out. The fish has a delicate flavor and texture. 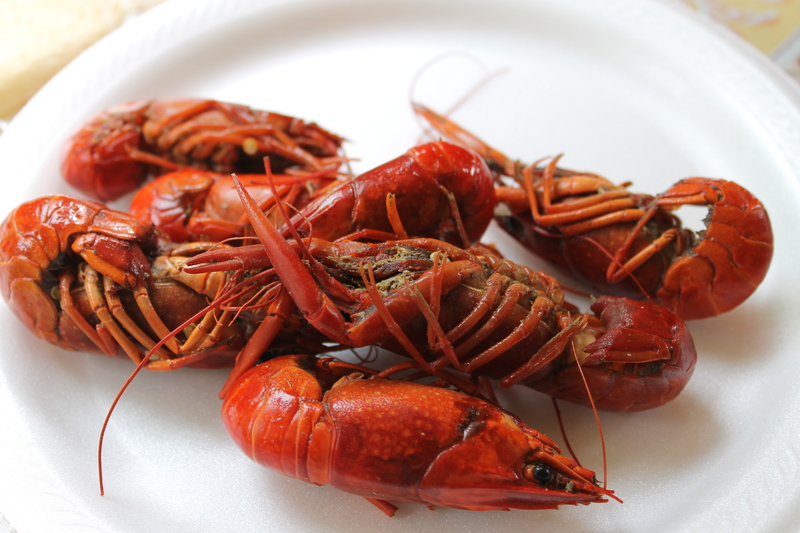 Steve doesn’t normally like crawfish, but he enjoyed these. Bammy Bread. 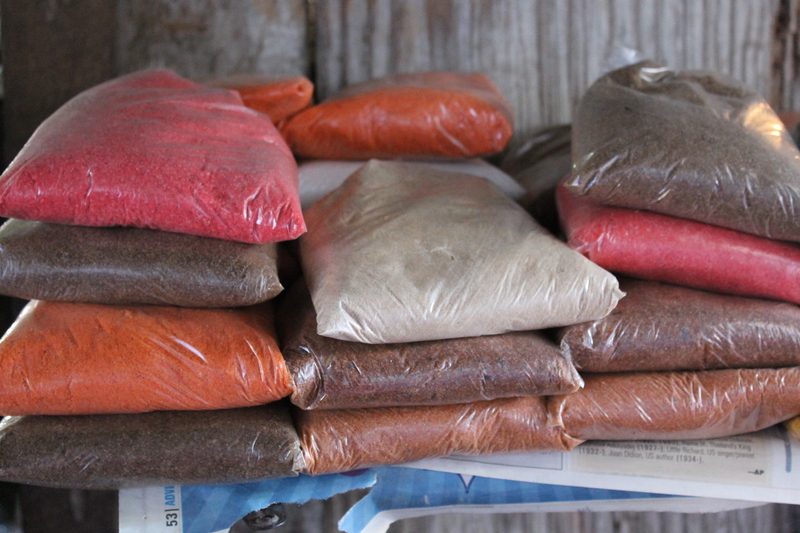 Another starch-heavy component of Jamaican cuisine. Perfect to help mitigate the spiciness of some of the food. And damn delicious. Lynda Lee told us that these cookstands really cater to the locals rather than tourists. I concluded that’s why the food is so good. The lovely Janet. The maker of the best fried fish I’ve ever eaten. 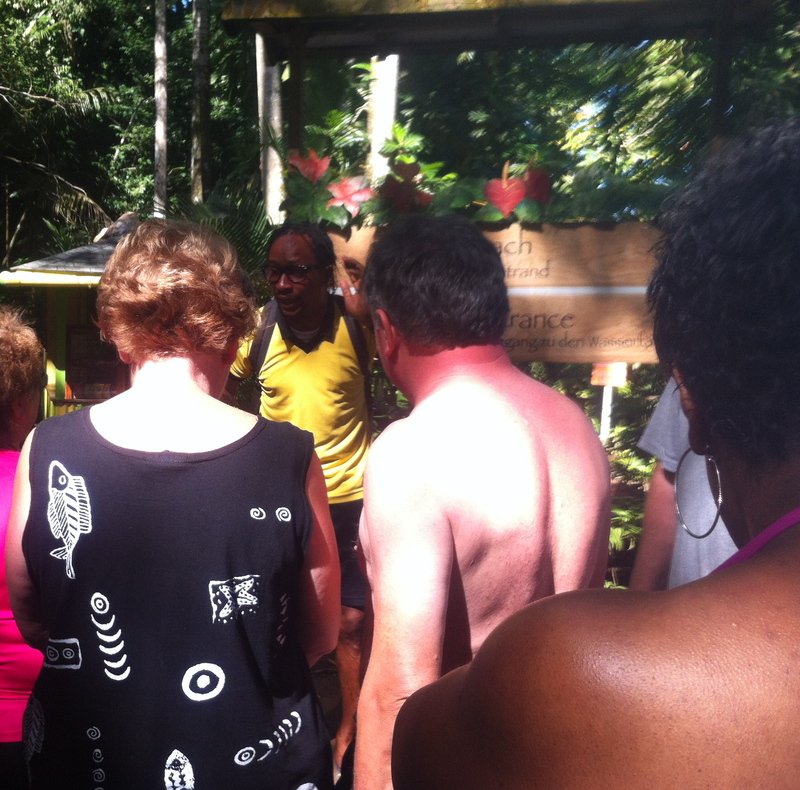 As we moved further into Whitehouse, we stopped at Peter Tosh’s house. It was one of Steve’s goals that we find it (his first reggae album purchase was Tosh’s “Legalize It”). It wasn’t easy to find. The entrance is tucked behind a coffee shop. Steve took a quick tour of the grounds with the caretaker and had a rather lengthy conversation with him about Tosh’s music. Steve seemed to be enjoying himself. It could’ve also been the wafts of ganja emanating from the caretaker and the whole place. Lynda & I could smell it and we were in the car. A quick biography of Peter Tosh: He was an original member of Bob Marley & The Wailers but had a falling out with Marley and left the group in 1973. He went on to a solo career and released nine albums, including “Equal Rights”, “Bush Doctor”, and “Mama Africa”. He was killed in September 1987 after a group of gunmen, one of whom he knew, invaded his home and demanded money. After he told them he didn’t have any, he was shot and killed. 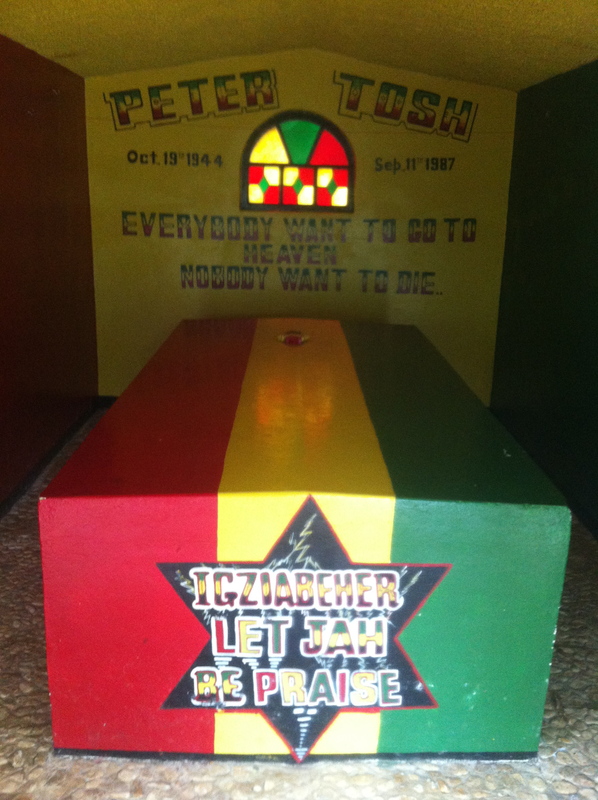 Peter Tosh’s tomb. Steve gave the guide $1000 Jamaican to help build a proper museum. I hope they meet their goal. 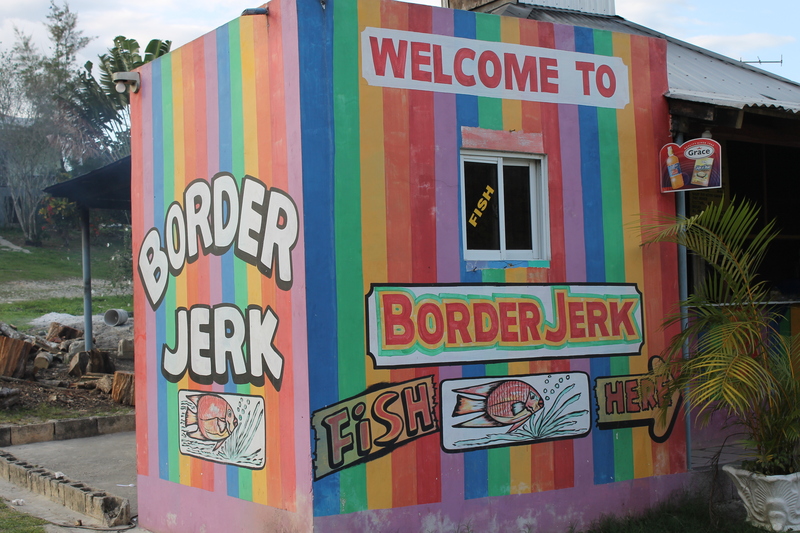 Lynda Lee had been extolling the virtues of this one jerk stand to us even before we set foot in Jamaica: Border Jerk. 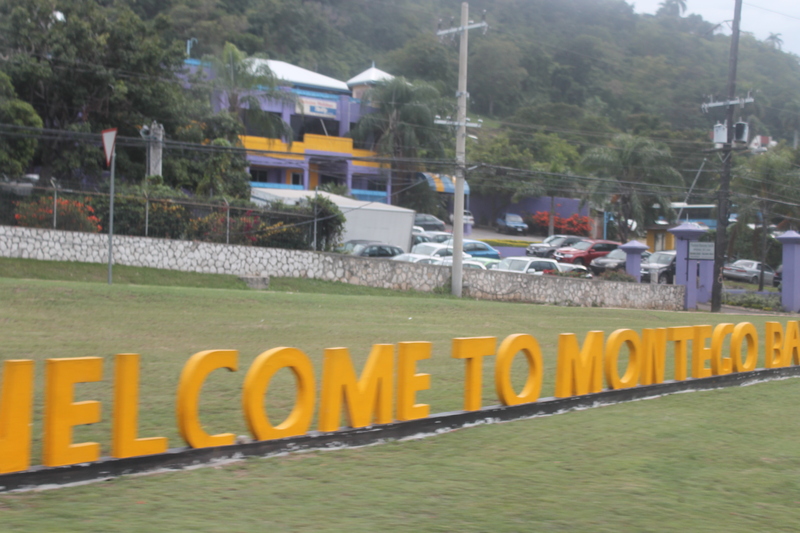 It sits on the border of Westmoreland & Elizabeth Parishes, hence the name. Once again, she didn’t disappoint. Again, it was like comparing apples and oranges with Scotchies. While we agreed that the chicken was most definitely better at Border Jerk – tender, juicy, and just the right balance of spicy – the pork was a different cut (I couldn’t quite tell what it was) while the pork from Scotchies was tenderloin. They were both equally wonderful. And, we finally got to try Festival. A slightly sweet fried flour fritter. All this paired with a Red Stripe? Ambrosial. 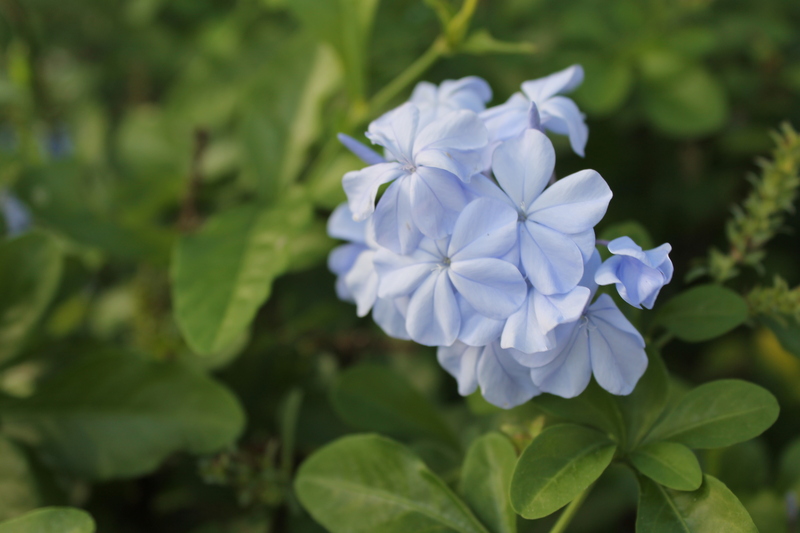 Beautiful periwinkle flowers. Frustratingly, I couldn’t find the names of these, either. 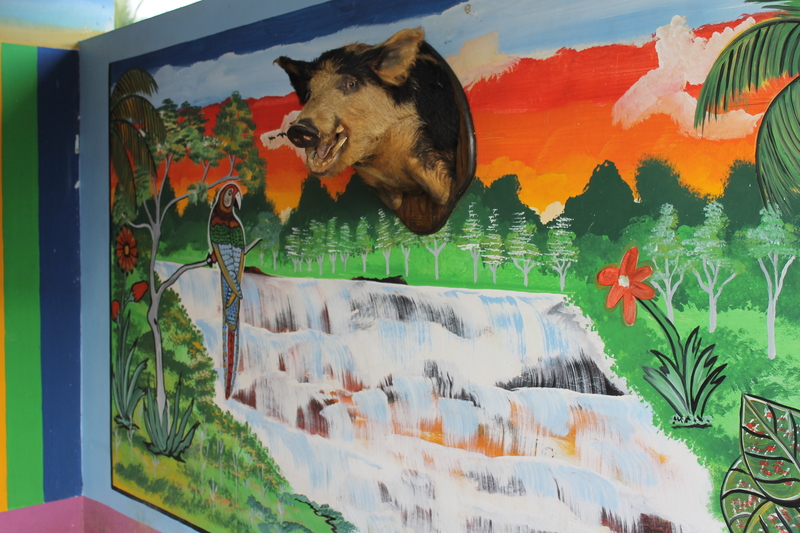 It must have been a strange set of circumstances for a boar’s head from Florida ended up in the Jamaican countryside. We finally made it back to the resort, exhausted, around 6pm. After some hugs, almost tearful goodbyes, and promises to stay in touch, we took our leave of Lynda Lee. There was a “Farewell to Jamaica” party sponsored by the resort and our tour group that evening. Steve & I opted to just stay in our room and then take a late walk on the beach. That’s about the time we decided we really wanted to come back someday. Just hire Lynda Lee for a week and just tour around the island and see and experience as much as we could. We didn’t think to bring any food back from our Saturday travels to have for breakfast, so we lurched downstairs and back to Port Maria for their breakfast buffet. We were prepared to be underwhelmed and we weren’t disappointed. In fact, I won’t even bore you with the details. Last view of the beach. Sigh. 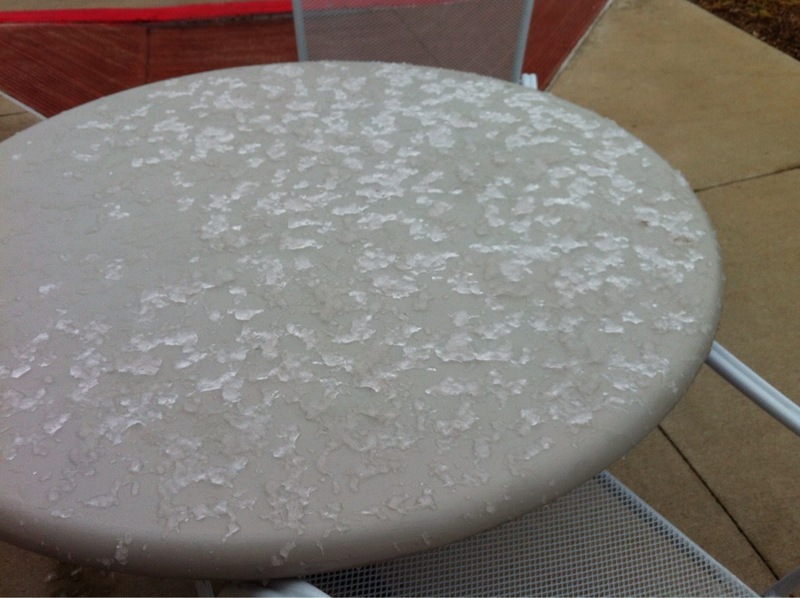 I checked the weather back in Fort Worth. It was 30F. Ugh. I told Steve this and we dressed accordingly. Many of our fellow travelers were about to embark wearing their summer togs. I figured they’d be in for a surprise. Or, they just wanted to enjoy the experience a little longer. I didn’t hear one person say they were anxious to go home. I wasn’t surprised. 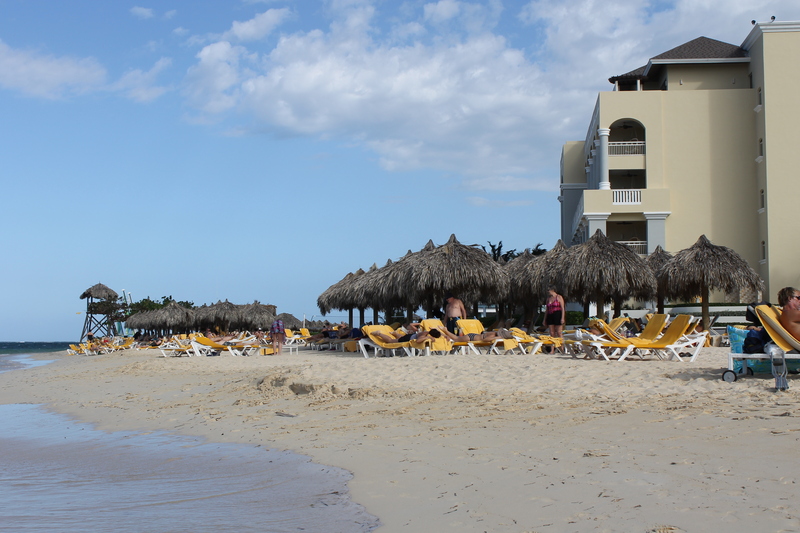 Many of our fellow travellers either didn’t leave the resort or went strictly to the tourist areas on the island. I tried not to pass judgement. A vacation means different things to different people. 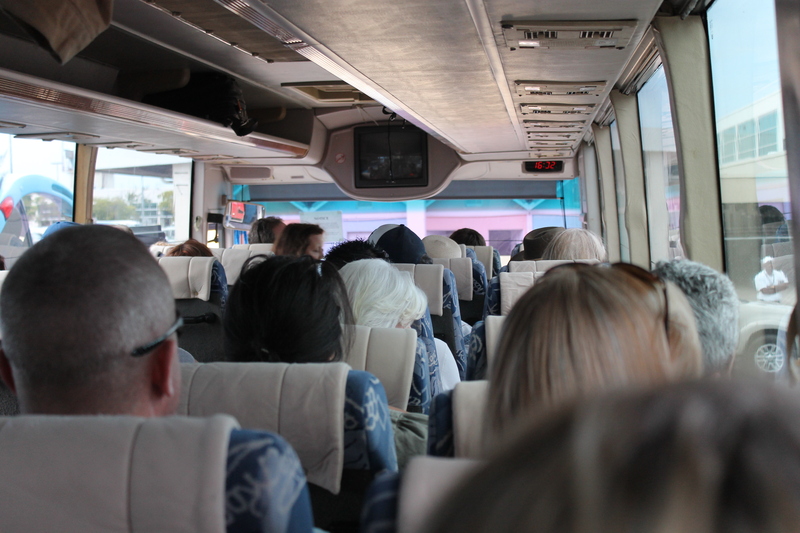 So, it was back on the bus to be shuttled to the airport. After the usual fun of getting the boarding passes, checking the bags, going through security, and finally making it to the gate, Steve & I spied some storefronts selling records, Jamaican foodstuffs, and meat patties. You can guess where each of us went. 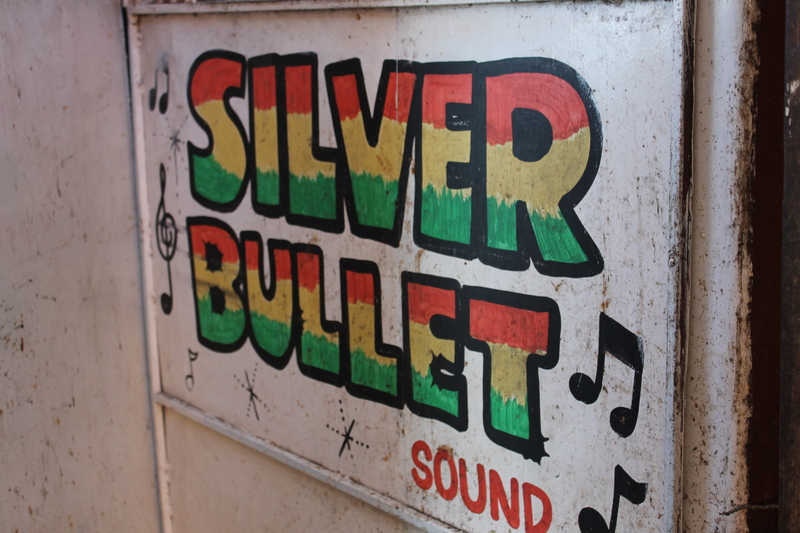 I think Steve bought 4 albums that he hadn’t been able to find in Montego Bay (in fact, the store owner told him to find vinyl, he’d have to go to Kingston). I bought some jerk seasoning that Janet at the market recommended to me and some Jamaican honey. Our final meal in Jamaica. Steve went back the shop after we ate and bought two more for us to eat on the plane. Yes, it was really cold when we made it home. After basically being waved through customs and finally finding my dad, we were on our way back to my parents. We did stop for fried chicken to take home to Mom. Yeah. it was good. The next morning before we drove back to Austin, Steve & I went to breakfast with my parents. Kinda drove home the fact that we weren’t in the Caribbean anymore. Once again I learned a valuable lesson. Don’t judge a book by its cover. Jamaica has a reputation, sure. Some of it is deserved, some not. But, as Steve & I discovered, when you let the scales fall from your eyes, you can find a whole new world you never expected. The people of Jamaica are lovely, wonderful people with a lot of pride in themselves and their country. I highly recommend the journey. And hire Lynda Lee. 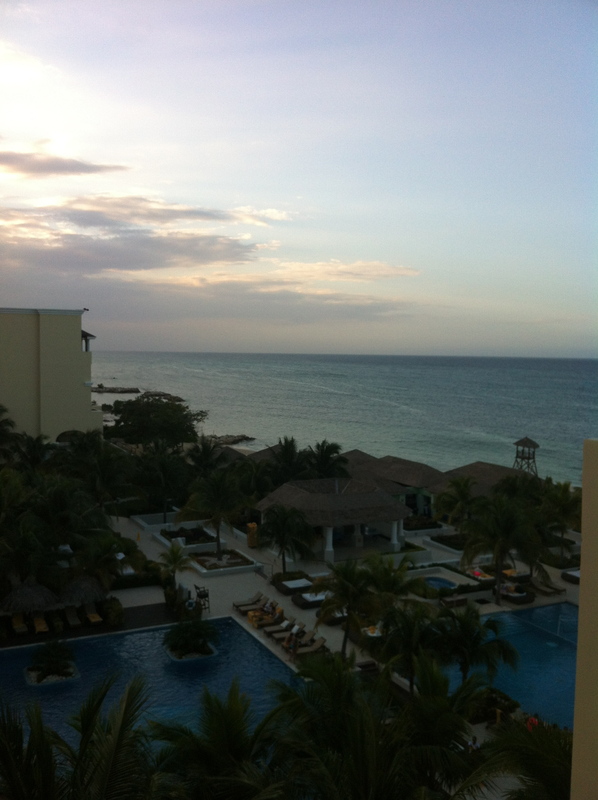 When my husband, Steve, called me last October from work to inform me that we had “won” a trip to Jamaica, it’s fair to say I was underwhelmed. 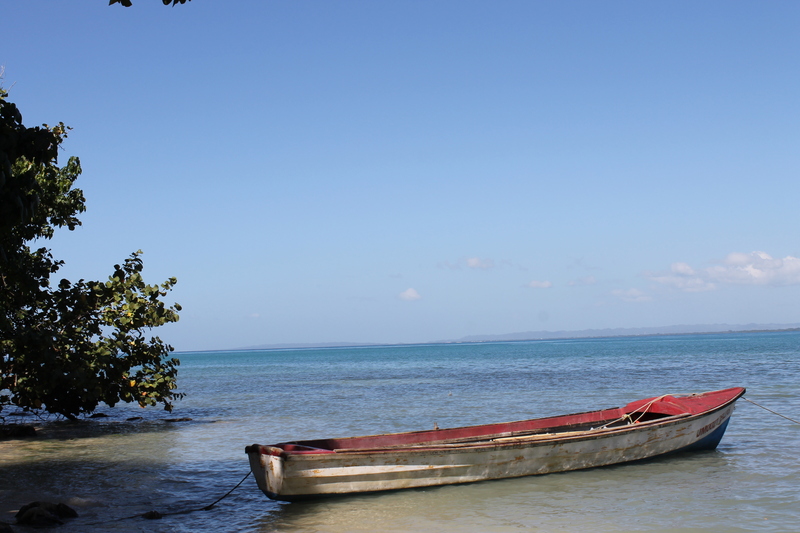 For one, Jamaica was never a place that was on my radar as a desired destination. I honestly imagined it to be either full of walled-off resorts hosting pasty tourists frying themselves to a collective crisp trying to tan; or, outside the resorts, to be like the legendary tough streets of Kingston with clouds of ganja smoke hanging in the air. Needless to say, Steve was disappointed in my reaction. A little background on the “winning” of this trip. Steve & I own a small restaurant he inherited in his hometown of Vernon, Texas (it’s about 20 minutes from the Oklahoma state line). The lady who leases the restaurant from us does business with a food distributor in far north Texas (they’re based in the Panhandle) that, every year, gives away trips to a few of its customers as a thank you for their business. Now, our lady has taken a few of these trips herself – and she deserves it – but, this year, she asked if it could be transferred to Steve & me. She knows we enjoy travel to farther-flung lands than she is used to (Las Vegas is the height of excitement for her), and Jamaica just wasn’t for her, she decided. Plus, we have passports. That’s how we ended up in Jamaica. I let Steve do all the planning (normally my domain) for our extracurricular activities. 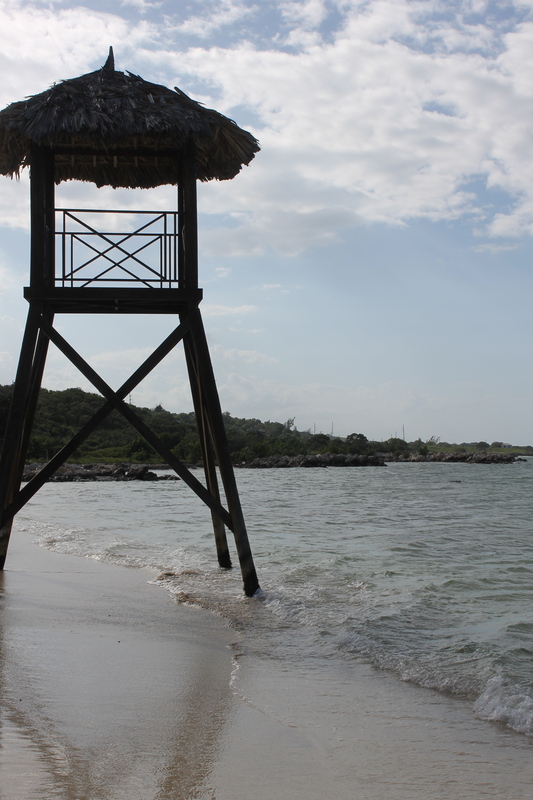 My only stipulation was that we find a way to get away from the resort for at least one day so we could see something of the “real Jamaica”. 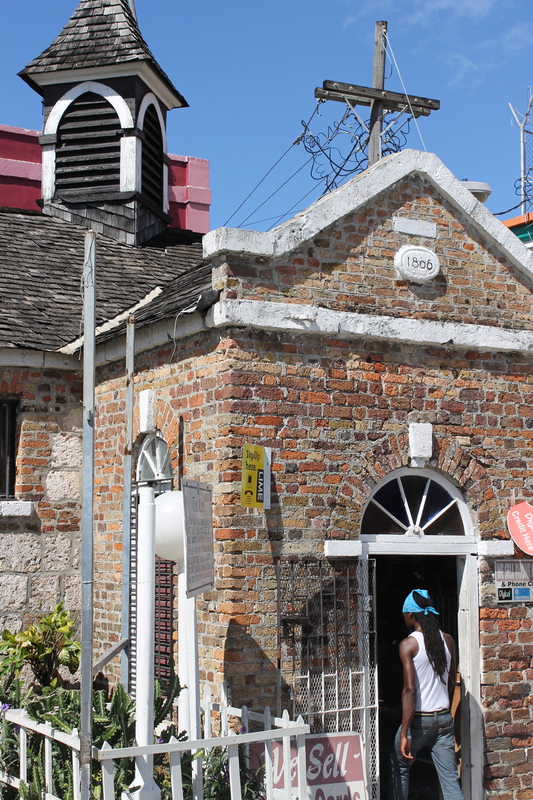 We decided that if we were going to actually go somewhere that we knew next to nothing about except for jerk chicken, Red Stripe beer, rum, reggae music, Bob Marley, Rastafarians, and Yardies, we’d better do some boots-on-the-ground learning. Steve & I drove up from Austin to my parents’ house near Fort Worth on Tuesday, January 28. Our flight was scheduled to leave Wednesday morning. And, since our tickets had us leaving from DFW, up we went. We got a later start on Tuesday than we would have liked because it had iced over the night before. We weren’t able to get on the road until about 2:30 pm. Then, of course, we hit the legendary Fort Worth traffic right at rush hour. Lovely. We finally made it to my parents reasonably sane. 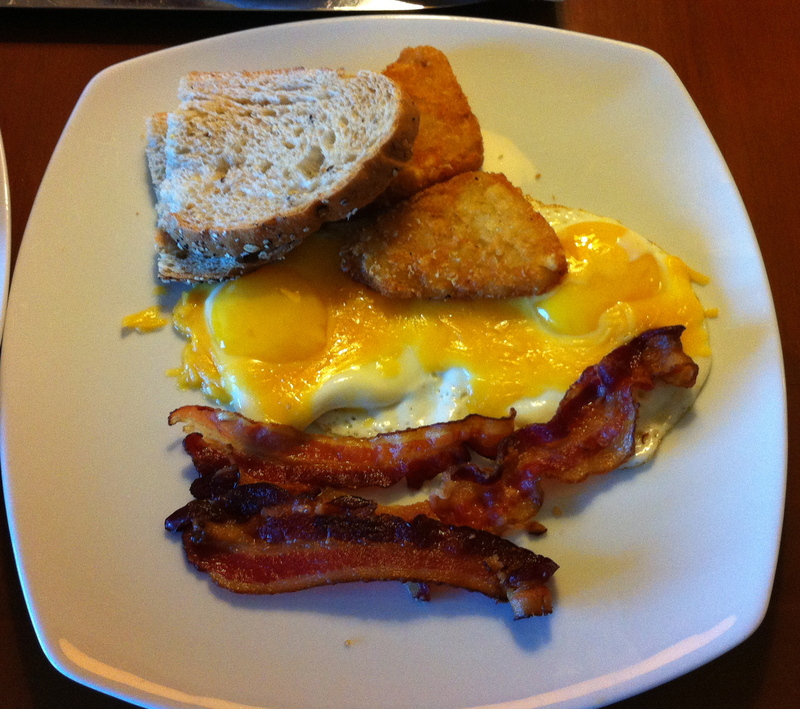 Mom made us one of my favorite food memories from her kitchen – fried egg sandwiches. It was a slightly more grown-up version with whole grain bread instead of Mrs. Baird’s. Now, as we all know, you can make something for yourself that your mom used to make when you were a kid and it tastes pretty good. But, there’s nothing like Mom making it for you. Dad loaded us up, Mom gave us each a hug and one more admonition not to bring them back anything because “you’re going to get it back anyway”, and, off we went. Dad drove, he and Steve conversed, and I was half asleep. Airport check-in was relatively painless. (I do have to say DFW has this stuff down.) And, as always, the TSA security screening was an unexpected adventure. A full body scan or a pat-down? Always an unpleasant decision. We finally made it through to the secure area. I changed some money (as a FYI, the Jamaican Dollar is worth roughly $.01), and we headed towards the gate. 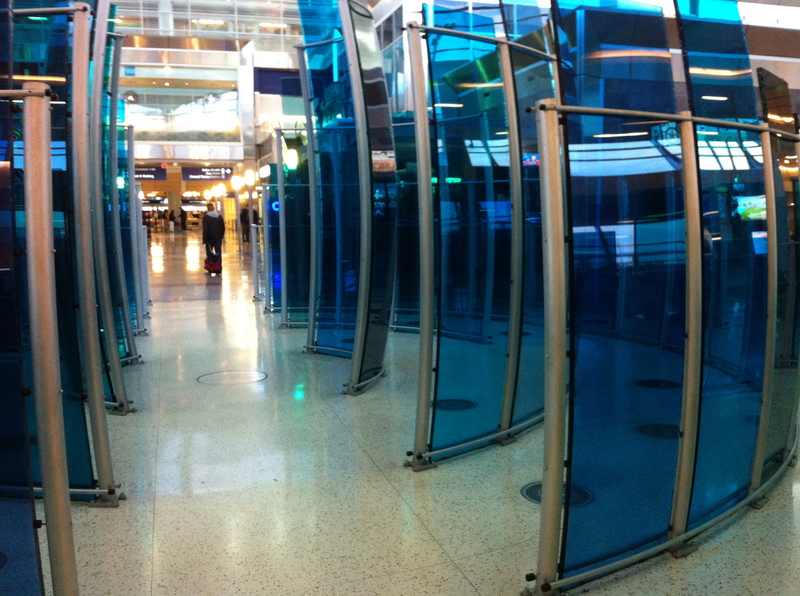 A bit of art in Terminal D. The disks on the floor are lights that, when they light up, make different tonal sounds. The glass panels amplify and direct the tones and keep them from echoing. Interesting concept for an airport. After about 15 minutes of sitting at the gate, Steve & I decided we were still hungry. So, off we went to forage for food. Well, decent food anyway – sometimes very hard to find in the airport. We settled on Einstein Brothers Bagels. I know it’s a chain, but it’s a decent enough one. 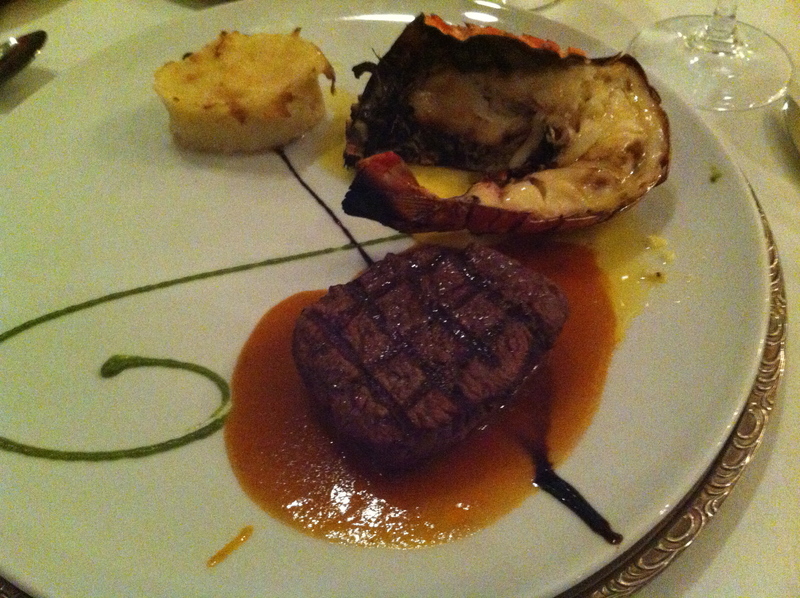 Plus, I figured we wouldn’t be eating again until we reached the resort, so this would set us up for a while. 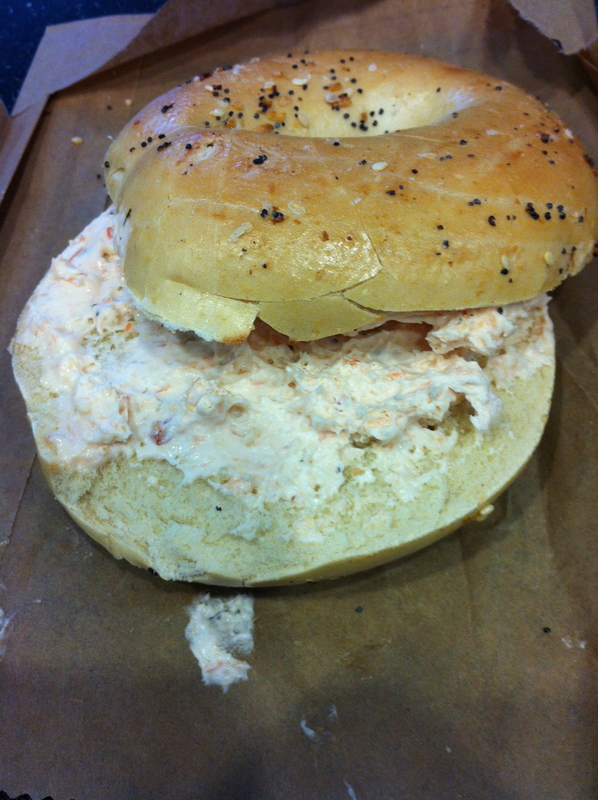 Einstein Brothers version of the Everything Bagel with Lox & Cream Cheese shmear. Meh. After a rather cramped flight where almost everyone was playing musical chairs because, inexplicably, the travel company didn’t seat couples together, we made it to Miami. 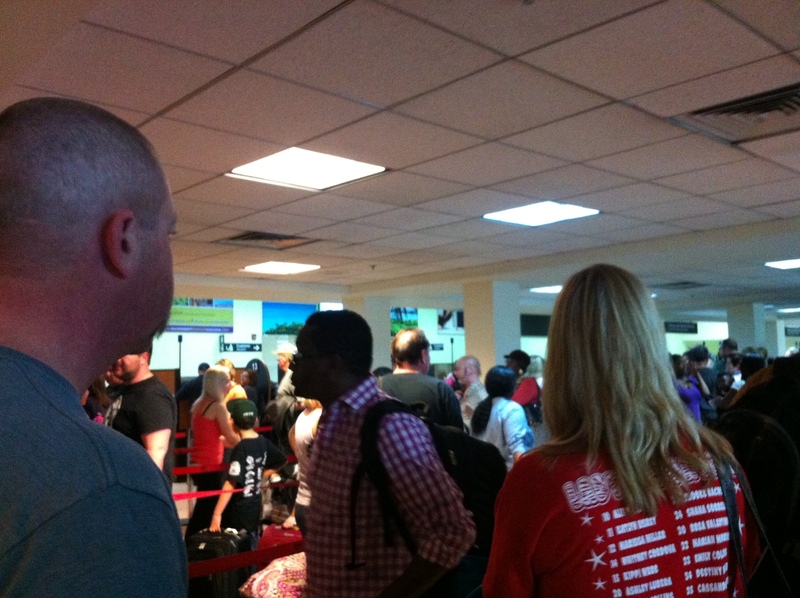 We were rushed to our next flight (2 gates away) where it was hurry up and wait again. There was another round of musical chairs when we were able to board. 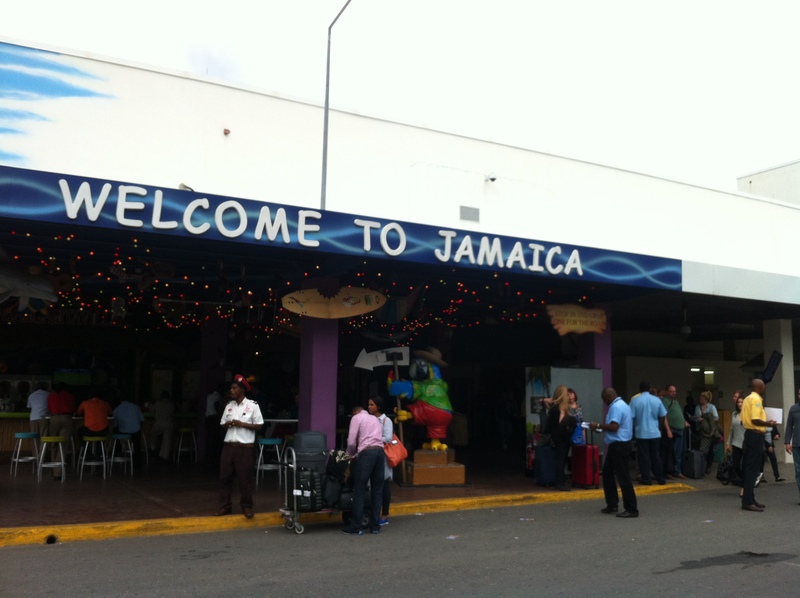 About 2 hours later we landed at Sangster International Airport in Montego Bay, Jamaica. It definitely wasn’t DFW. 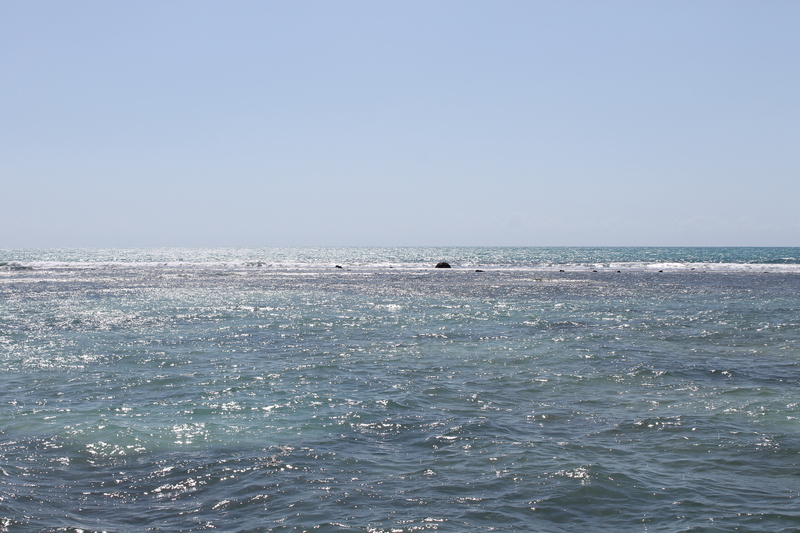 But, we all caught, what was for most of us, our first glimpse of Jamaica. My first impression? It was very green. There is some small comfort that Passport and Immigration control officers are about the same everywhere: fairly robotic and slightly rude – at least with non-citizens. 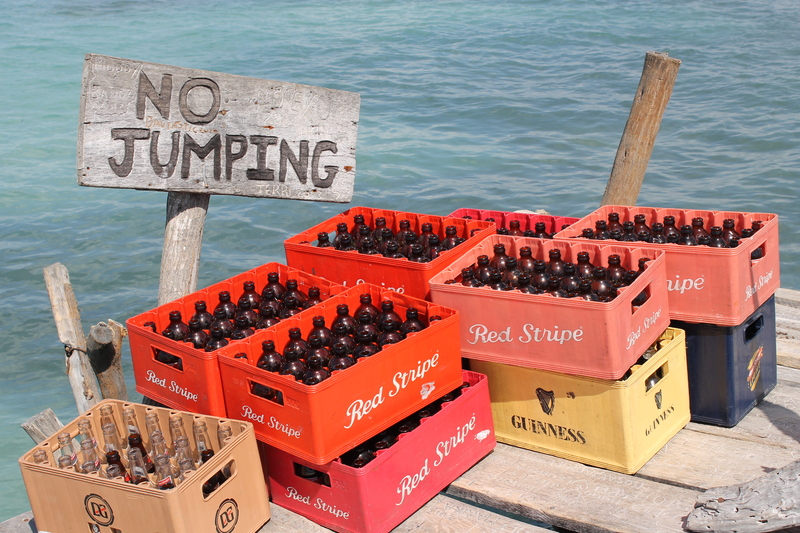 Jamaica was no exception to this rule. The lines at passport control for us non-citizens. I took this before I saw the sign not to take photos. After about 30 minutes – a surprisingly short wait time considering the lines – we retrieved our checked bags and headed to the buses waiting to take us to the resort. I couldn’t help but think of ZZ Top at about this time. It was about a 30 minute ride from the airport to our resort. 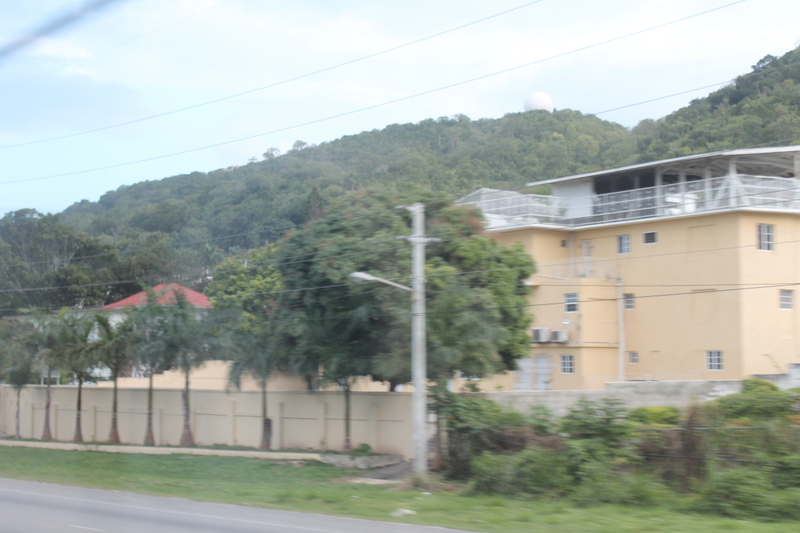 At least from the bus, anyway, we saw a little of the real Jamaica. One of the better photos from the bus. 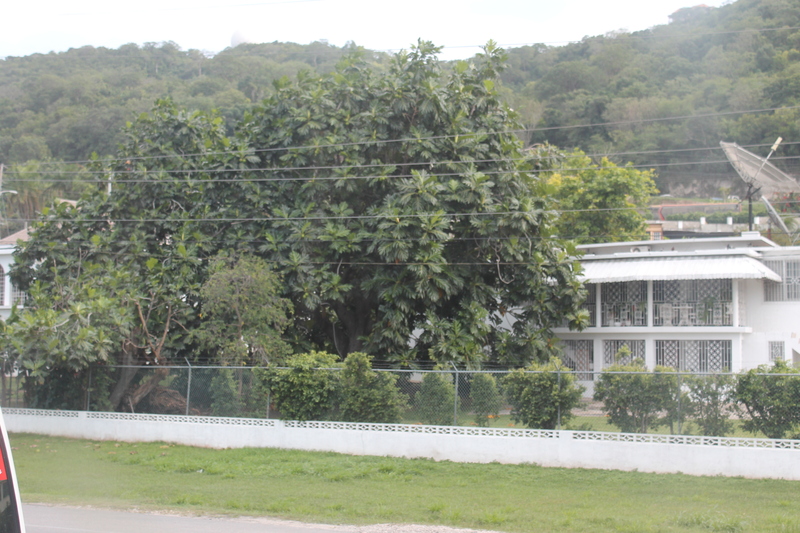 It’s hard to see in this photo, but it’s fairly typical for Jamaican homes, if they can afford it, to put bars on the windows and doors. If they have a patio, they bar that off, too. A direct result of the crime rate. One more from the bus. Not sure what this building is. Apartments aren’t common, so this might be a government building or school. We finally made it to the resort. I was thrilled because I wanted a shower. Steve was just glad we were done traveling for a few days. After our bags finally arrived to our room, Steve & I cleaned up and headed down to the “Welcome to Jamaica” buffet the resort arranged for our group in the Port Maria restaurant – an open-air buffet restaurant next to the beach. 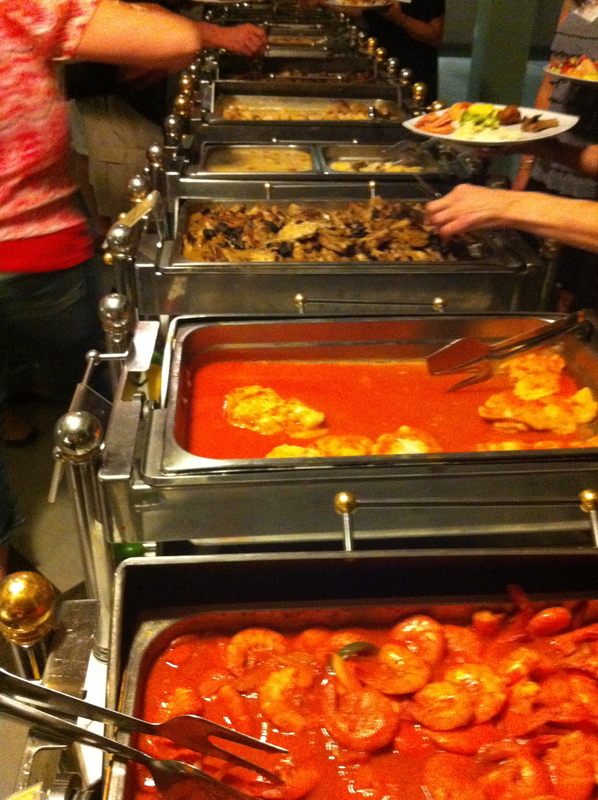 The food was resort food – beautifully presented, plentiful, and bland. But, it was open bar. So, there was that. A few of the compound salads. 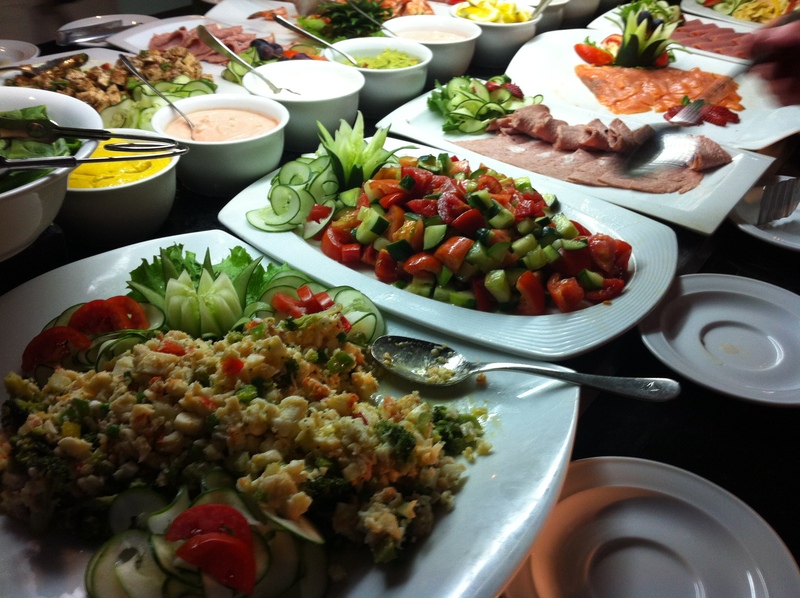 I will say this, they did lay out quite the selection of salads and fresh vegetables. My plate. Honestly, I did feel a little ashamed. 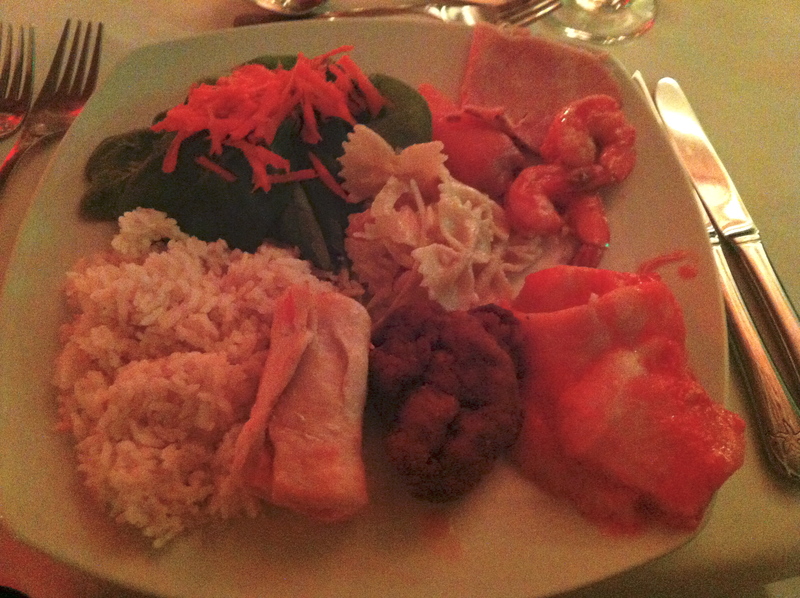 Shared plate #2. I should’ve just stuck with the cheese, rice, and goat. I would have been a lot happier with my meal. 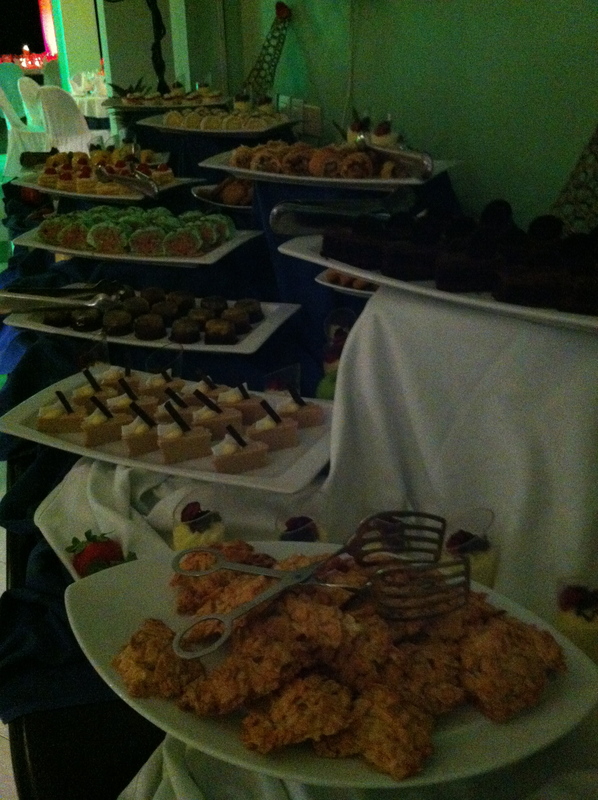 The photo is a little dark, but this is part of the dessert table. 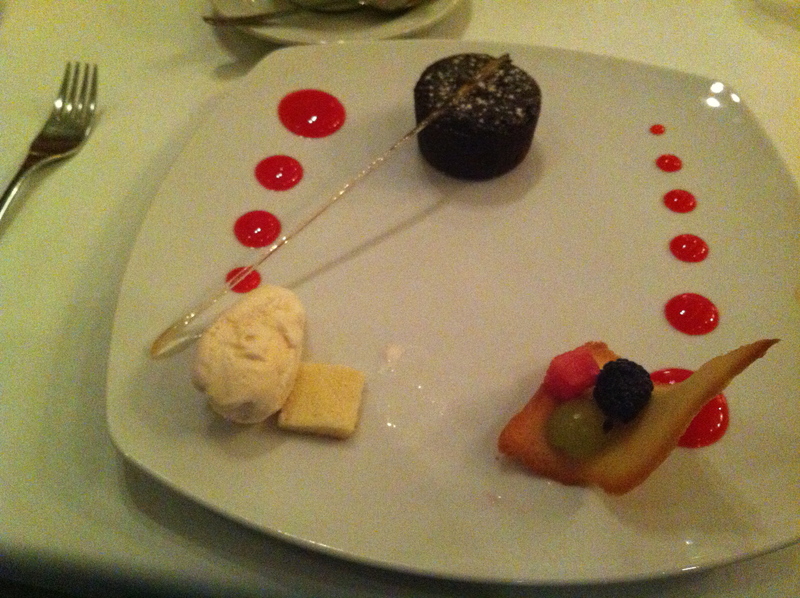 Sadly, the desserts were pretty marginal, too. 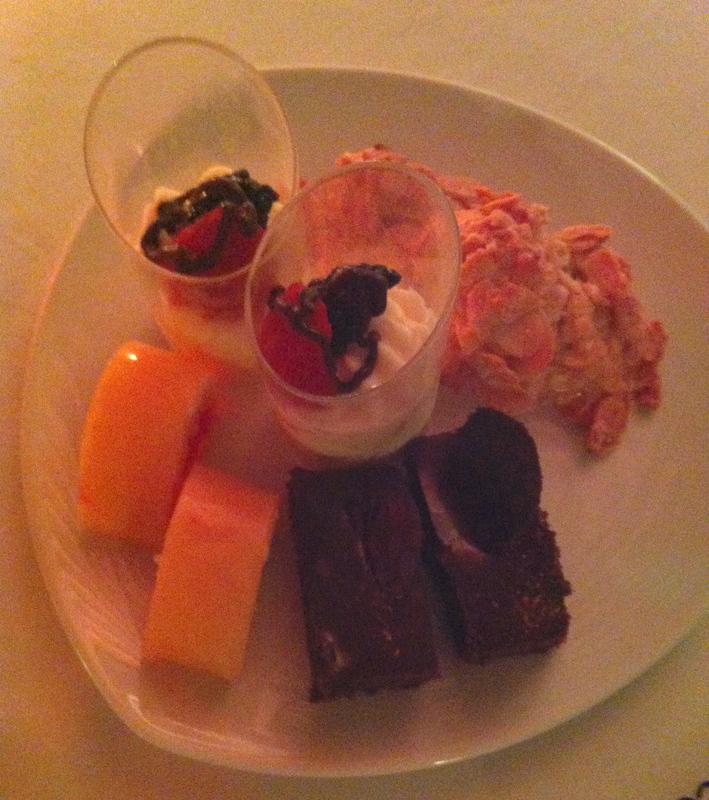 Our shared dessert plate: Mango “Sushi” (really just thinly sliced mango rolled around cake with jellied strawberry filling), Lemon Custard, Chocolate Cake, and Almond Cookies. But, the drinks were excellent. 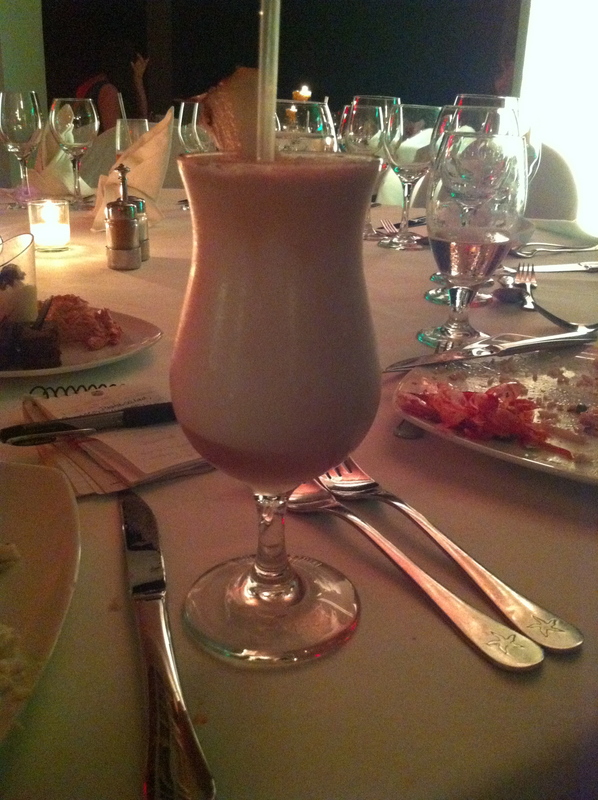 I went all ’80’s and had a couple of Pina Coladas. Steve stuck with Red Stripe. After a short nighttime stroll on the beach, we decided we were done with the day and headed up to sleep. This was the one day we decided to do a group activity. 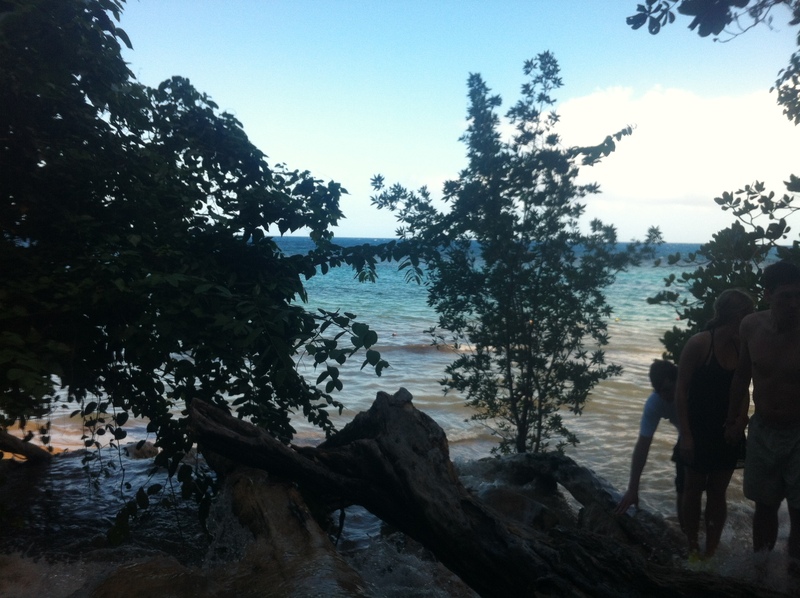 We were going to climb Dunn’s River Falls. But first, breakfast. We decided on room service. I was feeling it from the night before (and not in a good way), so I opted for something reasonably light. Steve took on the full breakfast. Breakfast. 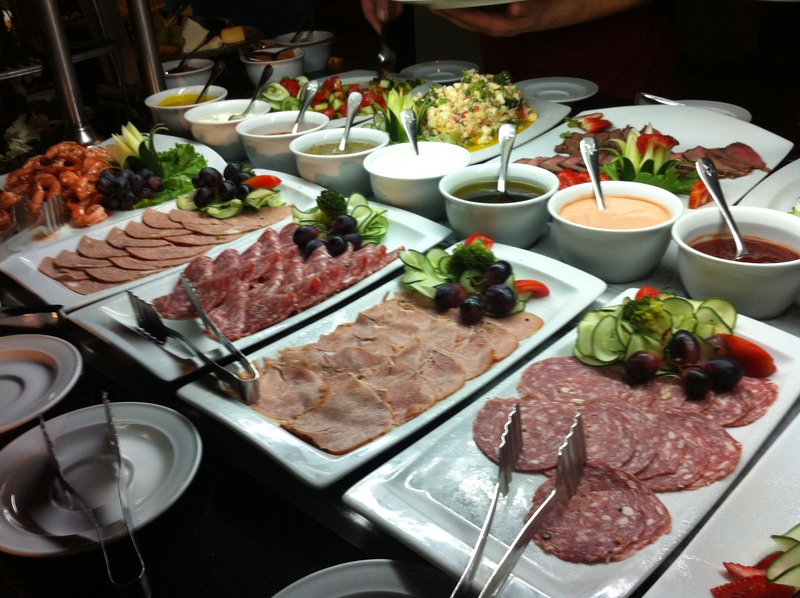 It was all right – as hotel breakfasts go. At least it wasn’t a cook-it-yourself waffle bar. 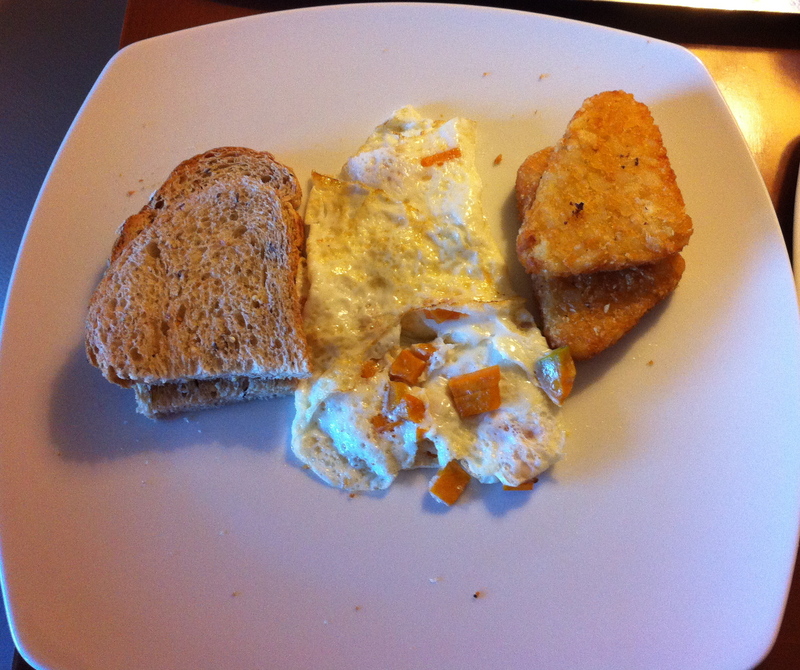 My breakfast: Mango Juice, Hot Chocolate, Egg White Omelette with Pumpkin Flowers (however, this was simply diced pumpkin), hash browns, and toast. 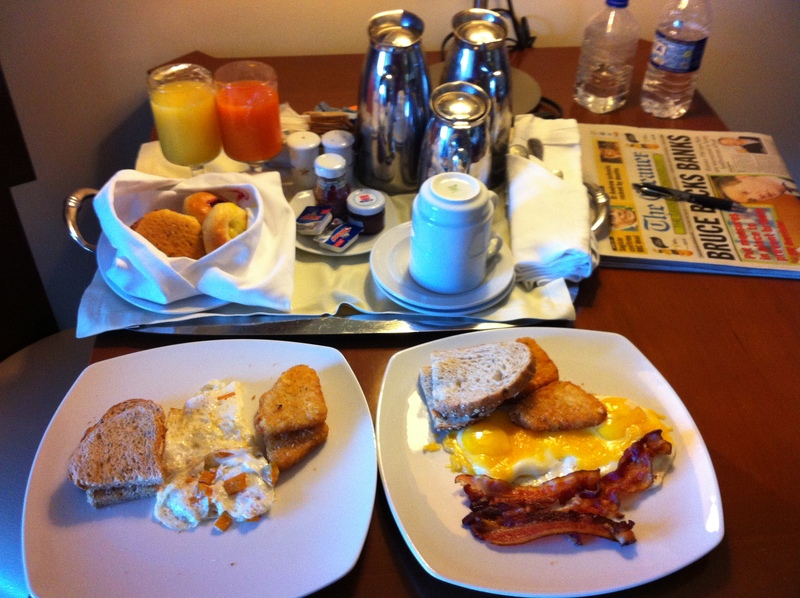 Steve’s Breakfast: Coffee, Orange Juice, Eggs with Cheese (American Style, they called it), Bacon, Hash Browns, Toast. Along with breakfast, we received a copy of one of Jamaica’s daily papers, The Daily Gleaner. It was an interesting read. One story about a man who was killed contained the line, “…when police asked about the (man’s) lifestyle, the family fidgeted nervously”. Then, there was the phonetic spelling of the Patois (the local dialect) of the witnesses. Then, there was a take-down by the reporter of the “thugs”. You just don’t get kind of reporting here anymore. 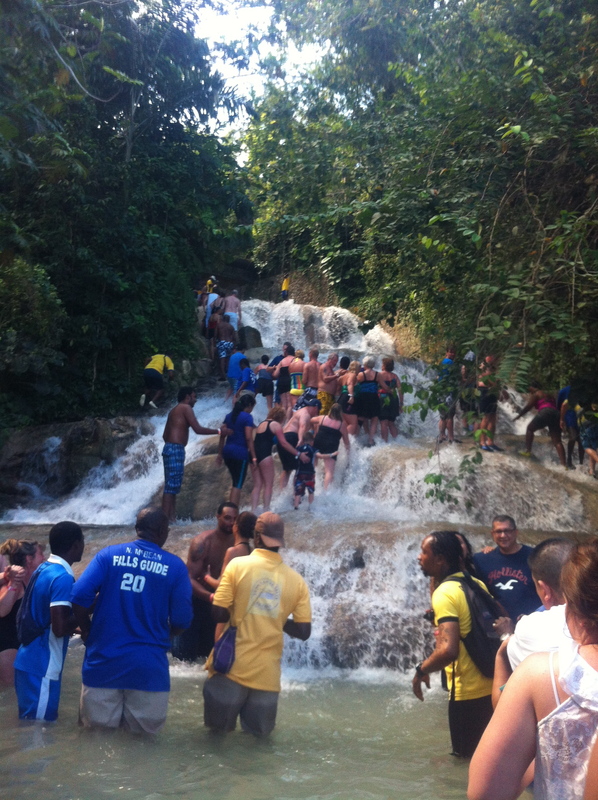 Dunn’s River Falls are east of Montego Bay at Ocho Rios (another popular tourist spot). The falls drain directly into the Caribbean Sea – one of the few falls in the world that drain directly into the sea or ocean. Another claim to fame is in 1657 when the British defeated a Spanish expeditionary force from Cuba during the Battle of Los Chorreras. It was also used as a location for “Dr. No”. 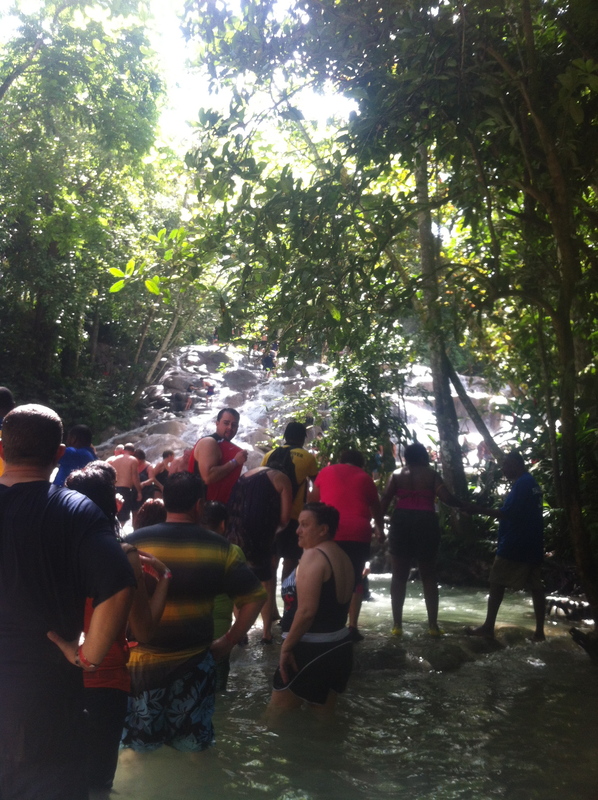 Dunn’s River Falls is an approximately 800 foot tall waterfall that is terraced and is actually not too difficult a climb, as waterfalls go. Not to say it isn’t tricky in spots. Generally, a human chain is formed before you head up the falls to help support each other along. (I ended up holding hands between Steve and a gentleman named Al. Al was great. So was his girlfriend, Emily.) You’re grateful for the lagoons so you can stand is some calm water for just a few minutes. 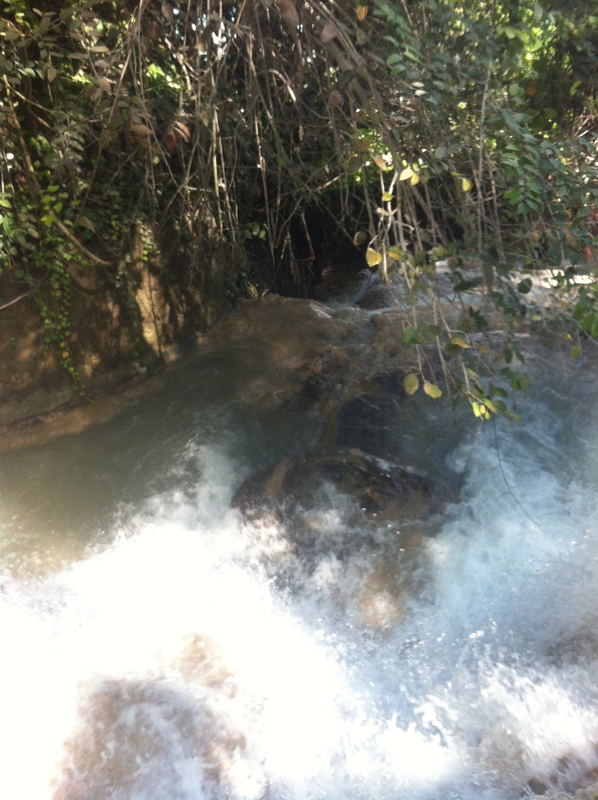 My first glimpse of Dunn’s River Falls. Each group is given a guide. Ours was the very affable Mr. Wilson. He liked to hug the ladies. But not in a creepy way. Mr. Wilson in the center in the blue shirt. Lovely man. Each group was also given a videographer. His sole purpose was to take photos and film your embarrassment so you could buy it on CD for $40 at the end of the climb. 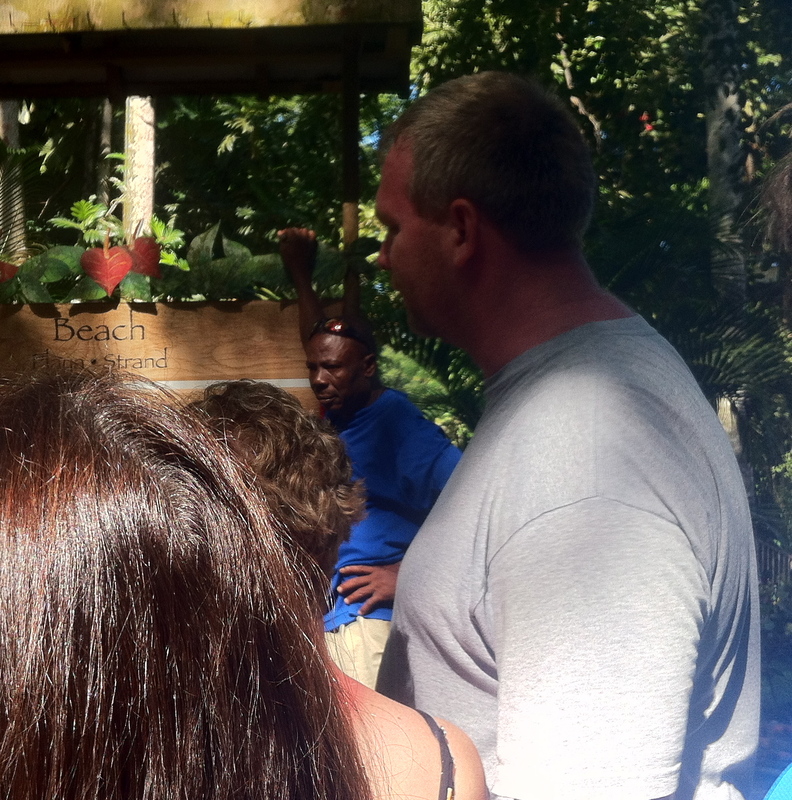 He was very enthusiastic and managed to get just about everyone in our group to do some “whoop-whoop” noises. Steve & I did not participate in this. Our assigned videographer. Sadly, I can’t remember his name. Very enthusiastic guy. While I was waiting for video guy to finish his pep talk, I wandered a bit. 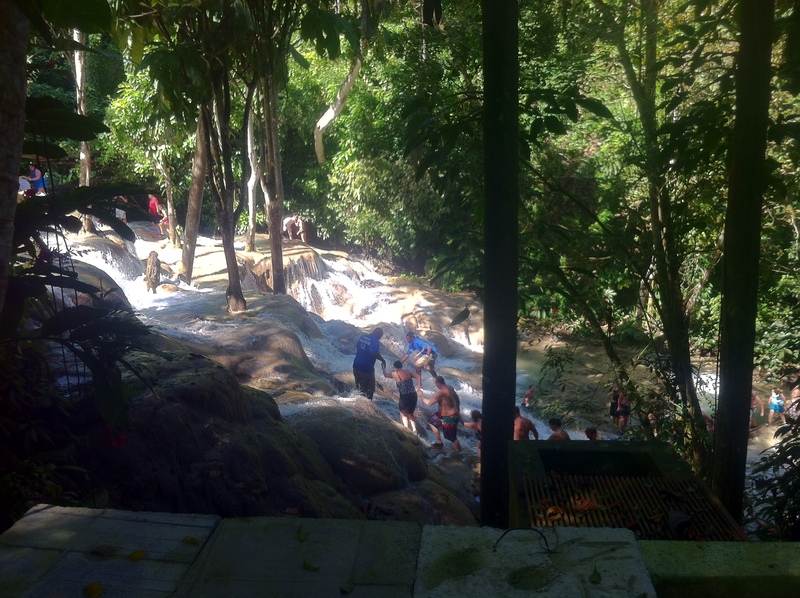 A lovely day at Dunn’s River Falls. 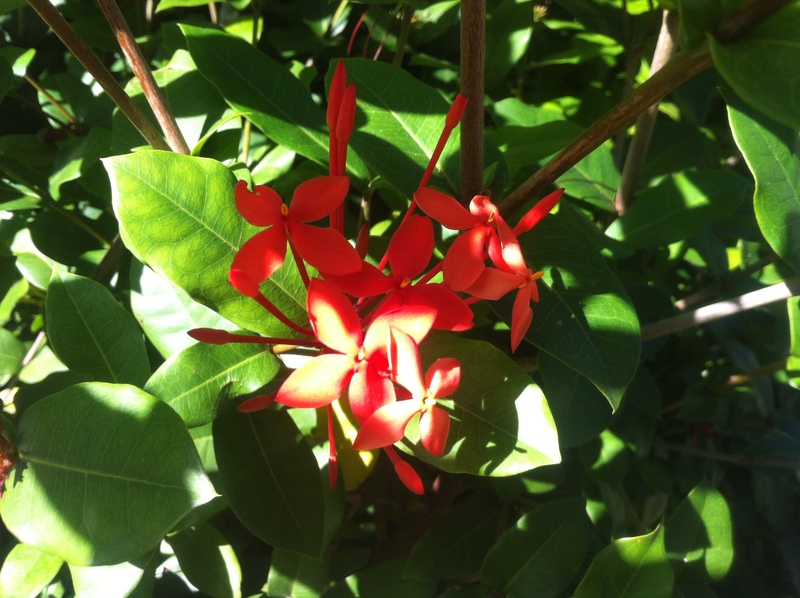 One of the beautiful flowering plants in Jamaica – Ixora. Then, it was time to climb the falls. We formed our human chain and got started. 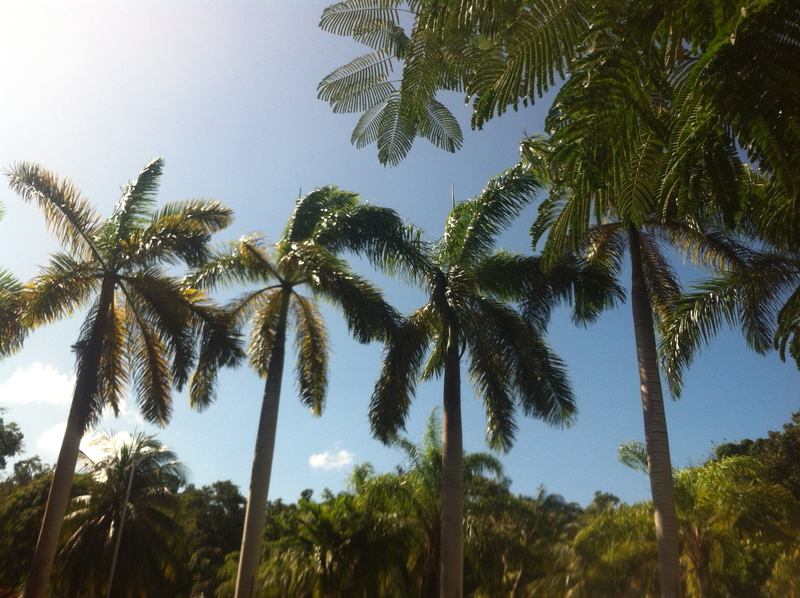 A quick glimpse back at the Caribbean. A glimpse forward. This about the time we hit the first lagoon. Quite the mass of humanity there that day. We had a great time. Got very wet. As one would when they’re climbing a waterfall. It was also fascinating to watch the guides climbing the falls, in some cases, all their lives. They were climbing those rocks like goats on a mountain. I just know I’d never be that nimble. At this point, we’re about halfway up. Another lagoon stop, another photo. Despite the crush of people, the falls were actually quite lovely. Our only complaint about the climb up was the amount of people they were trying to push through at once. Not only was there our group, but there were perhaps 6 others plus two cruise ships had come in. So, it was either a waiting situation until there was an opening, or you were rushed up the falls to make room for the next group. The guides are well trained, friendly, and efficient. I suspect there are few truly serious accidents. And I’m sure that they are used to the waves of tourists coming through. Overall, people seemed to have fun. I know we did. I was also proud Steve & I got as far as we did. We left the falls area and just wandered slowly through the rest of the park. 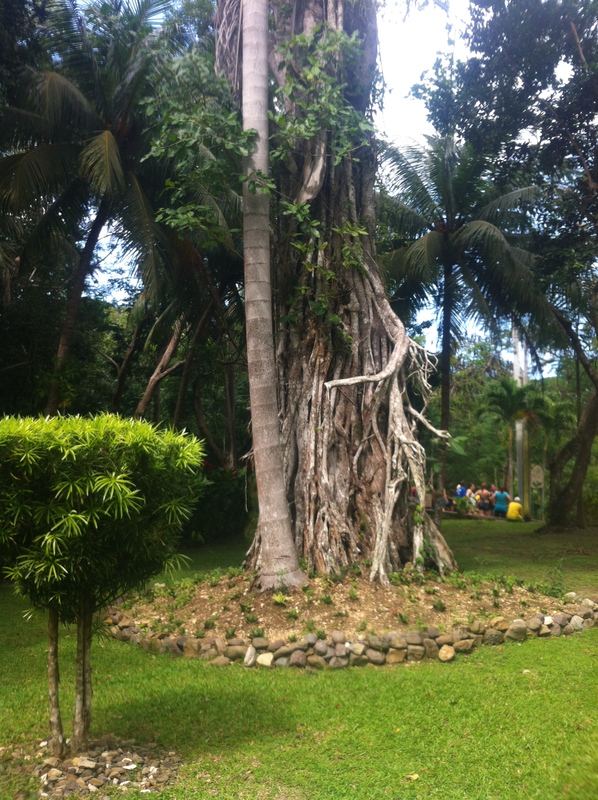 One of the many Banyon trees that dot the island. I thought these were beautiful flowers. However, I couldn’t find the name of them. 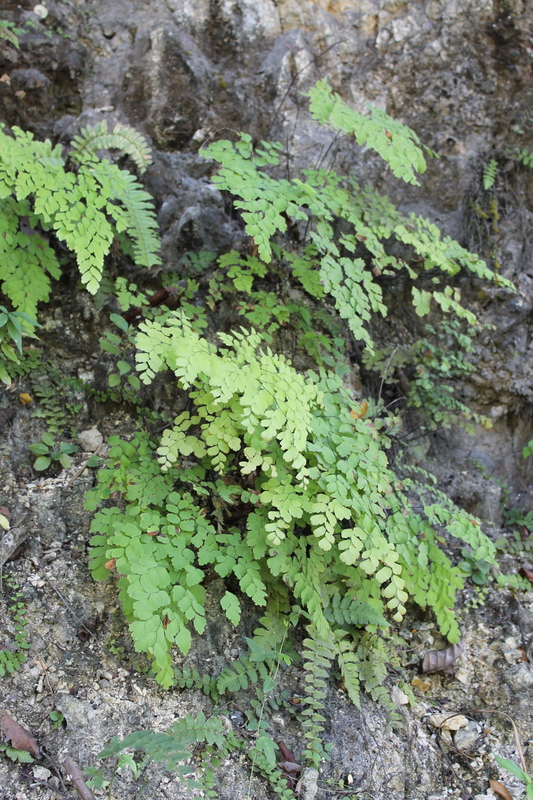 Another of Jamaica’s flora. Swamp Hibiscus. I say we wandered slowly. That was true, until we hit the souvenir stands. Oy. It was like a run for the hills trying to get through there. The sellers were really sweet and generous until they found out we didn’t bring any extra cash. Their M.O. was to walk up to us and give us each a “free” wooden figurine (quite cute, actually). 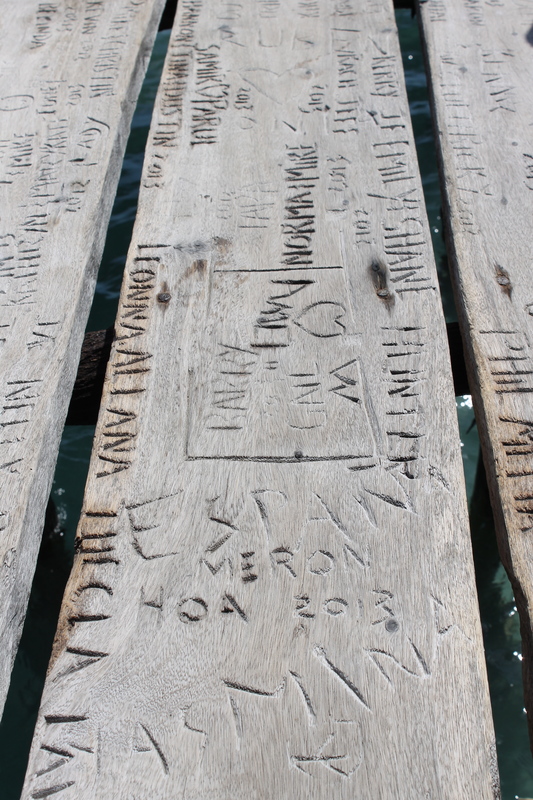 Then, they would ask our names so they could carve it into the wood. That’s when we would stop them and say we didn’t have any extra cash on us. Then, the figurine wasn’t so free. Oh, well. They have to make a living, too. One vendor did give us each a free necklace, though. Free after Steve bought a small carved wooden cat from him with what little cash he did have on him. It started to rain lightly, so we made our excuses and finally got back to the bus. Most everyone slept at least a little on the way back to the resort. I know I did. 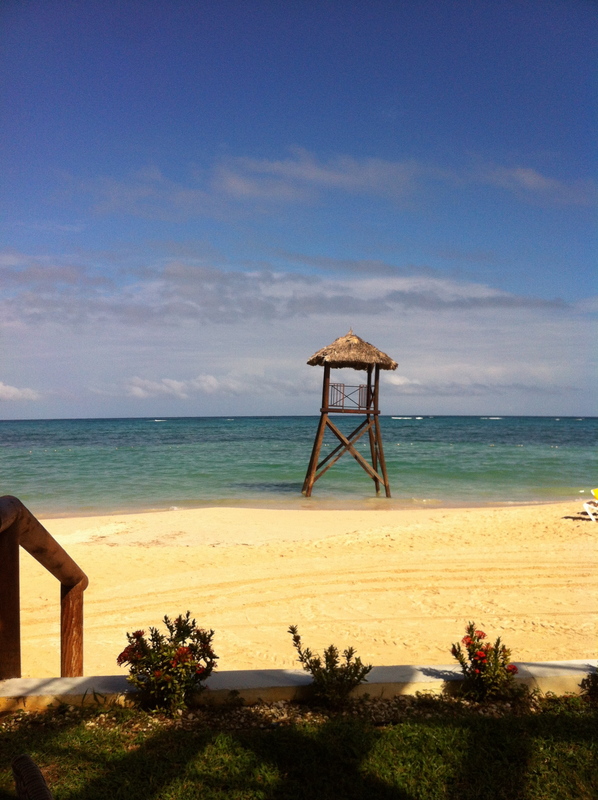 We made it back to the resort just in time for a quick change for the beach and lunch. 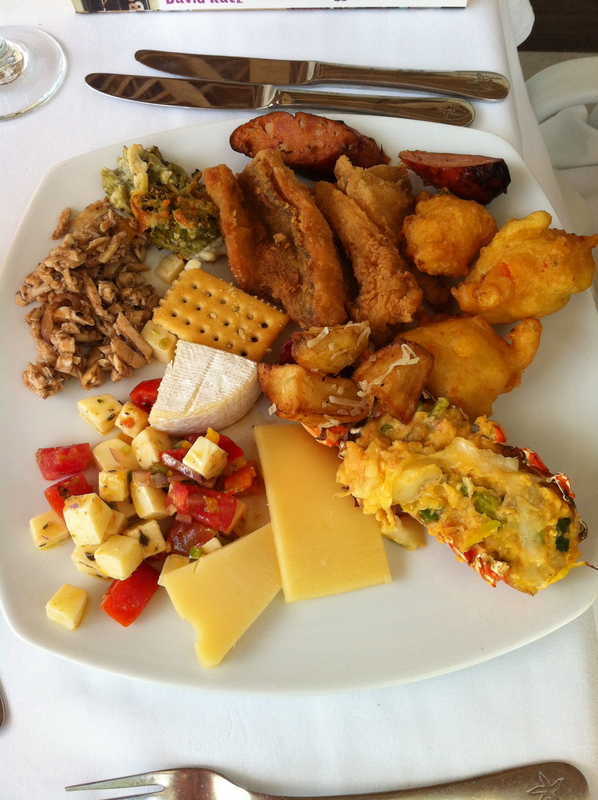 For lunch, it was back to a buffet at Port Maria. 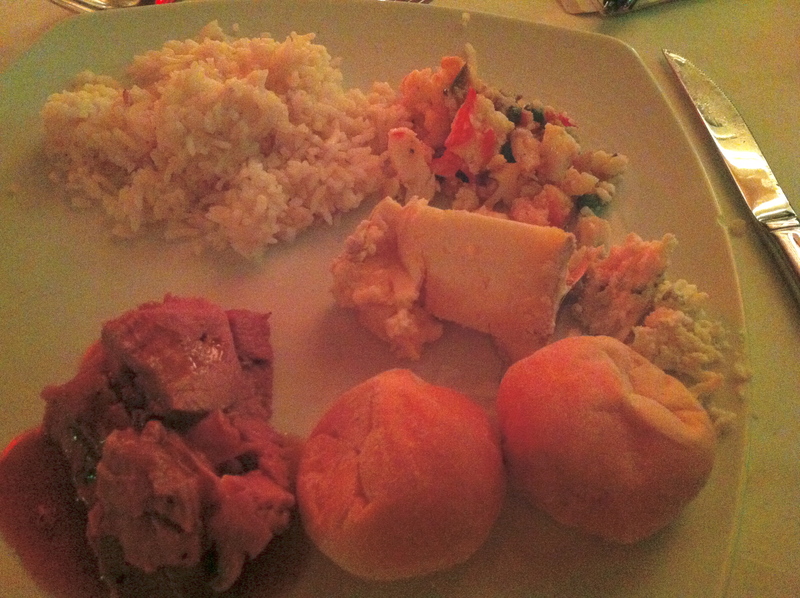 The food was a little better than the night before. There was more seafood, so that made us happy. Between the two of us, we had Lobster tail (which, much to my disappointment, was chopped, mixed with a cheese sauce, and put back in the shell), fried fish, a version of Caprese Salad, Squid Romesco, Conch Fritters, Broccoli au Gratin, cheese, fried potatoes, sausage, boiled shrimp, and crab claws. Our only excuse for the amount of food was that we were really hungry after climbing the falls. 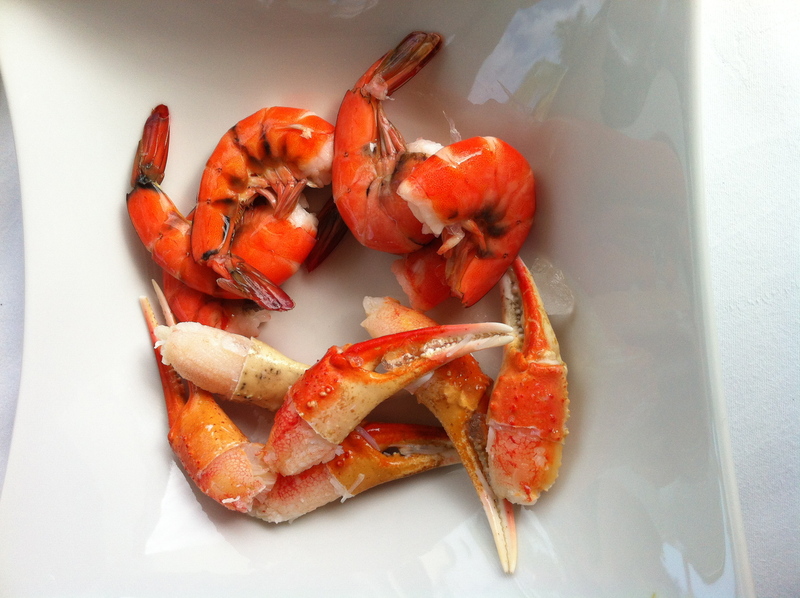 I managed to snag some of the last chilled shrimp and crab claws. They were the best part of the meal. Those and the conch fritters. After lunch, we made our way down to the beach to relax. We found a couple of unoccupied beach chairs, dragged them down to the water’s edge and just lazed for a couple of hours. I did do a little walking around and took photos. Steve did take a dip in the sea. We both read and dozed. 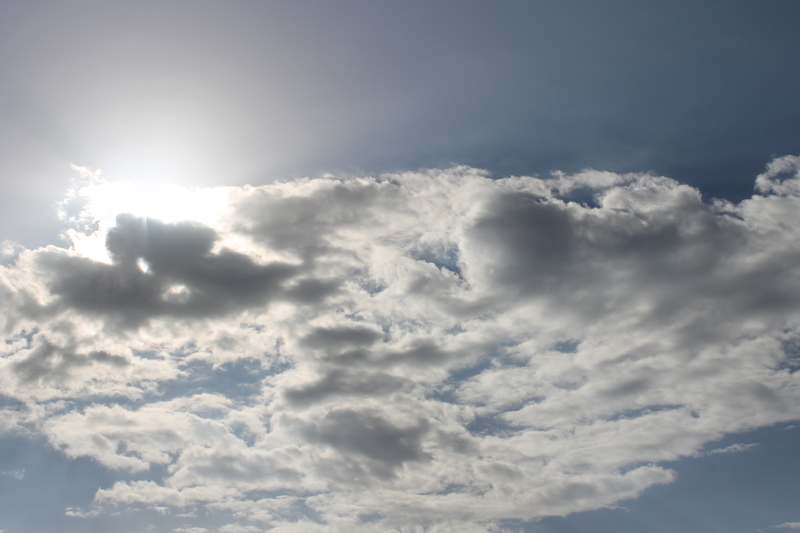 A lovely afternoon. Lifeguard stand. There are several of these on the beach, but I never saw this one used. 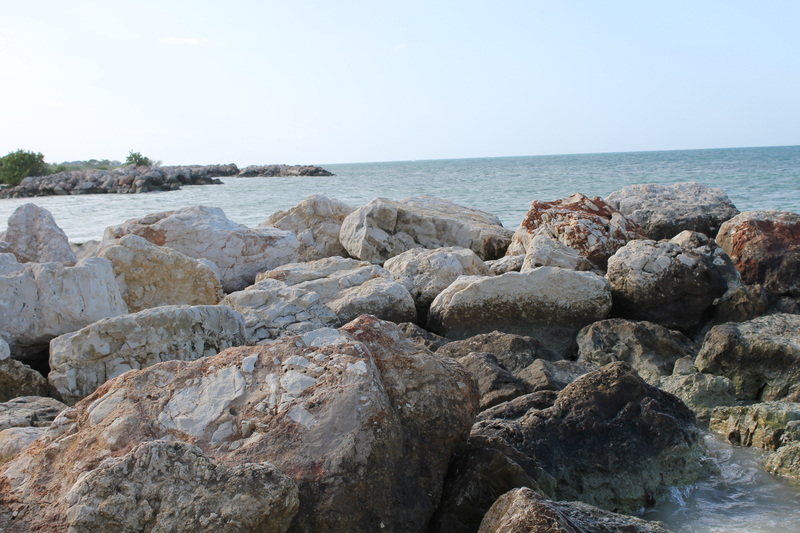 Rock jetty at the boundary of the beach. 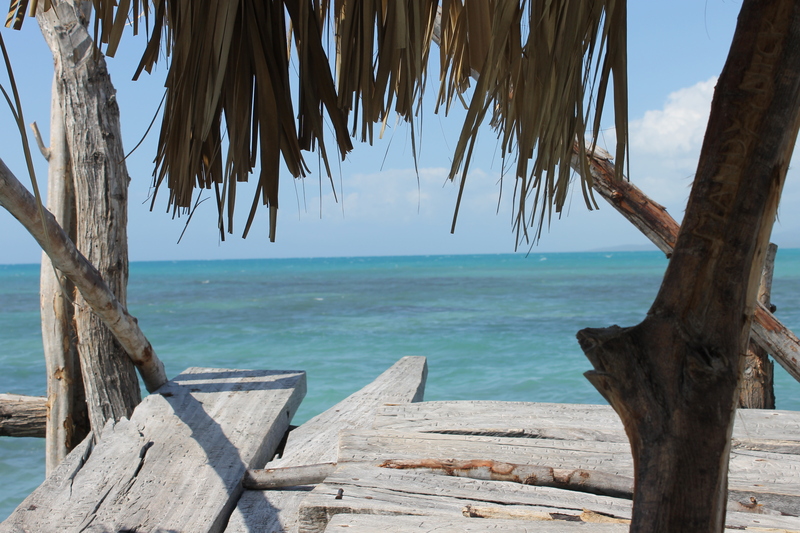 Looking out to the Caribbean Sea. There were some beach activities going on. We stayed well away from those. Surprisingly, though, the beach, while full, wasn’t overly crowded. Many people chose the pool area instead. After a quick rinse to get off the excess sand, Steve & I went to our room, cleaned up, and eventually, went to dinner. We did have reservations at the Japanese restaurant, but Steve really wanted to go to Galleon, the resort’s steakhouse. We ran into Brittany, who, after asking about Steve’s knee, was able to get us into the restaurant despite us not having a reservation. I wasn’t really hungry and I honestly could’ve gone the rest of the night without eating. But Steve didn’t want to eat alone and he didn’t want room service. I opted to just get an appetizer as a compromise. My dinner. Spider Crab Terrine with Lobster in Consomme. 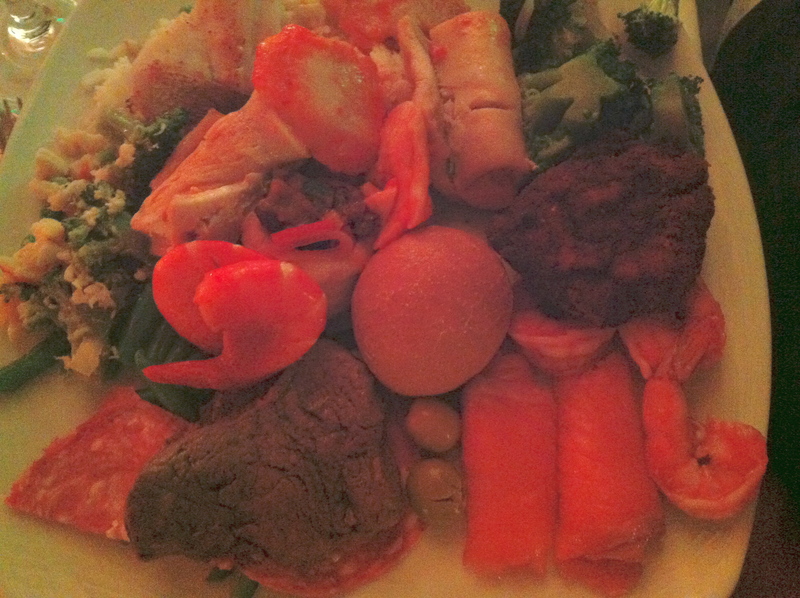 Basically, this was a glorified, bready crab cake with a very thin slice of lobster somewhere in the center. 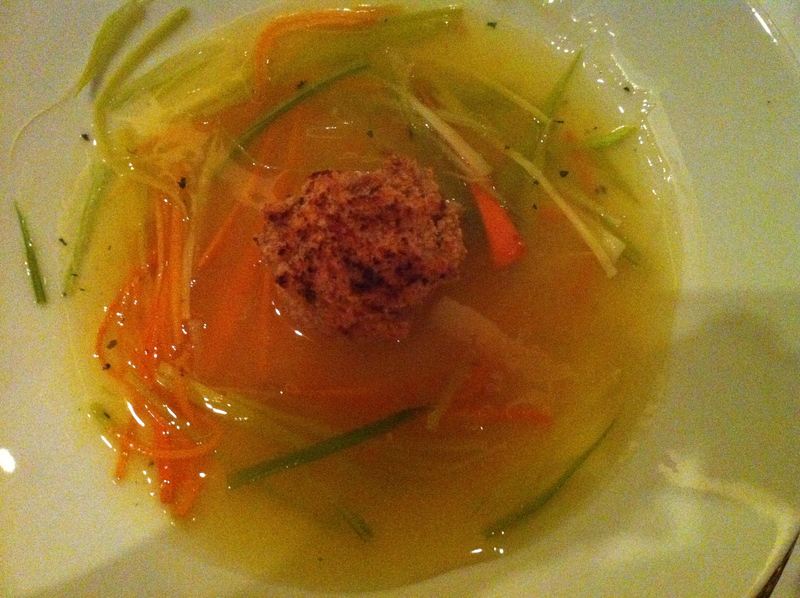 The consomme was almost jelly-like with what was no doubt the liberal addition of cornstarch. It also tasted like celery. Celery’s fine as a flavoring, but it shouldn’t be the dominant flavor; certainly not with seafood. The dish wasn’t terrible. Just disappointing. 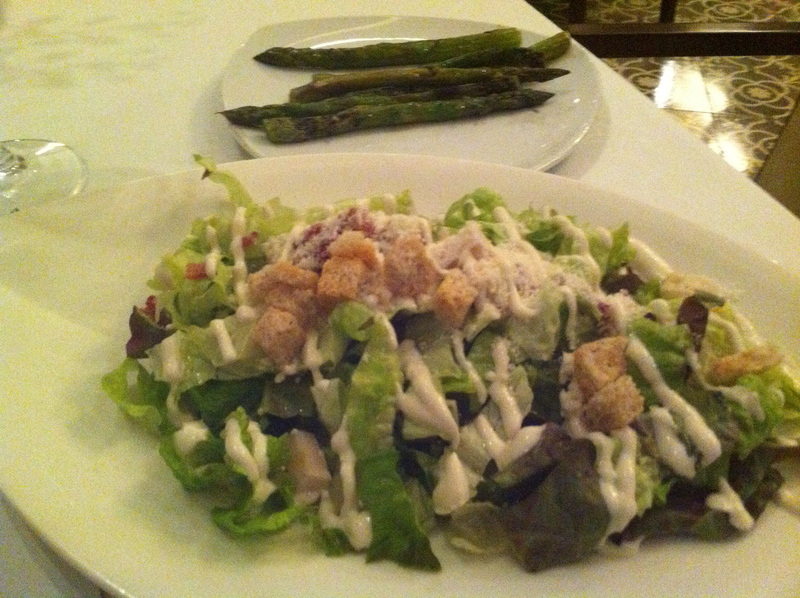 The sides for Steve’s Surf & Turf: Caesar Salad and Asparagus. Other than saying the food was good, Steve really didn’t have anything to say about it. He ate it all. 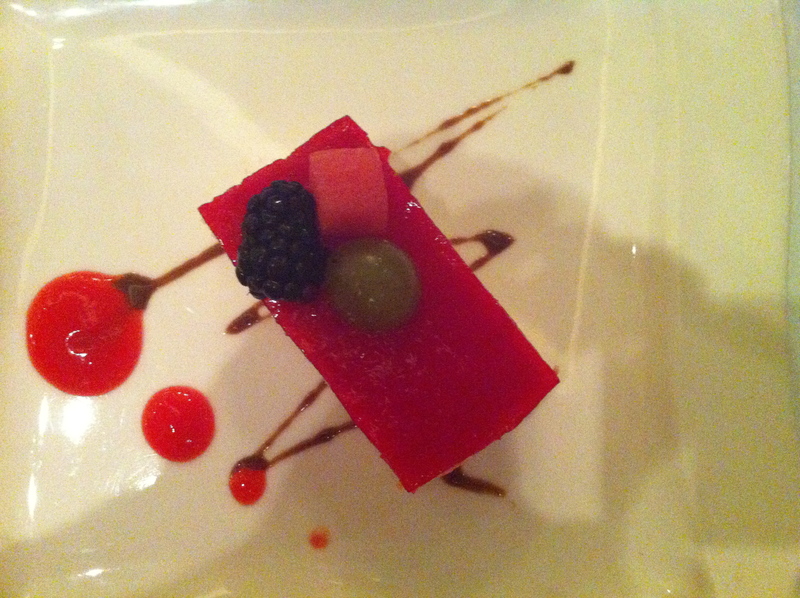 My Dessert: Cheesecake with Mountain Fruit. What to say. I’m not sure where the “Mountain Fruit” part came from since, unless I’m woefully ignorant about this, blackberries, grapes, and watermelon don’t grow in the mountains. 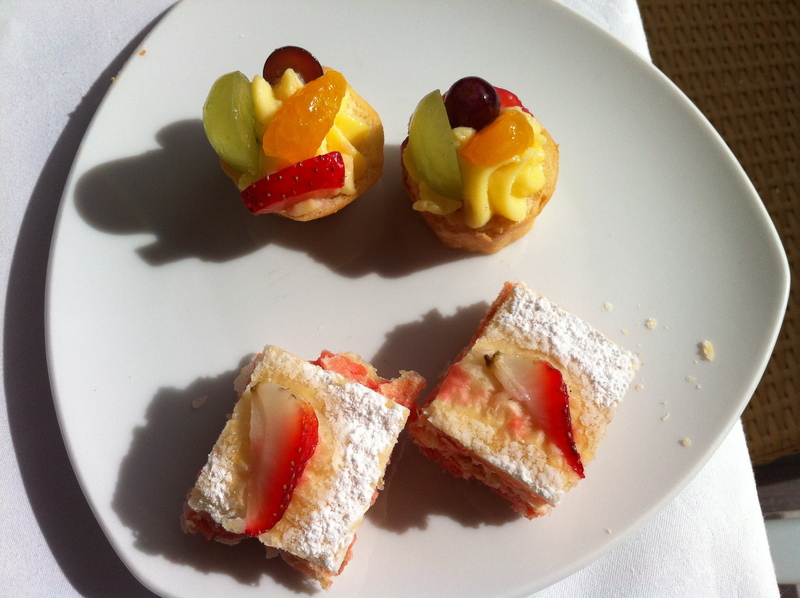 Plus, the jellied strawberry topping/glaze seems to be a popular go-to in the pastry kitchen. The cheesecake was lighter in texture than one would think of when they think of cheesecake and tasted fine. Not great; just fine. Fancy. He was happy. Note the use of more Strawberry Glaze. I went back up to the room to read and go to sleep. Steve decided to go listen to a reggae band playing near the pool area, smoke one of the cigars he bought, and enjoy a Rum Punch. Thus, Day 2 ended. Day 3, we were going off the reservation. We couldn’t wait. Part 1, fin. Part 2, soon.